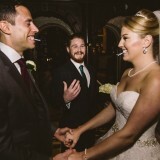 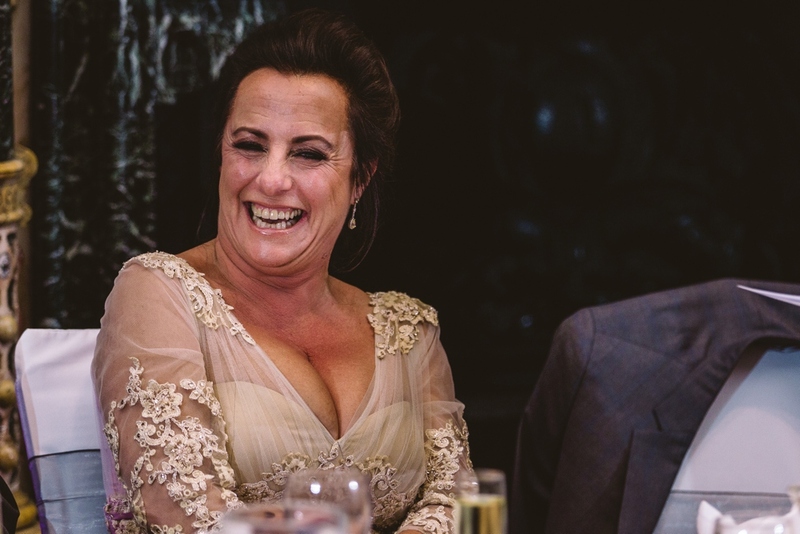 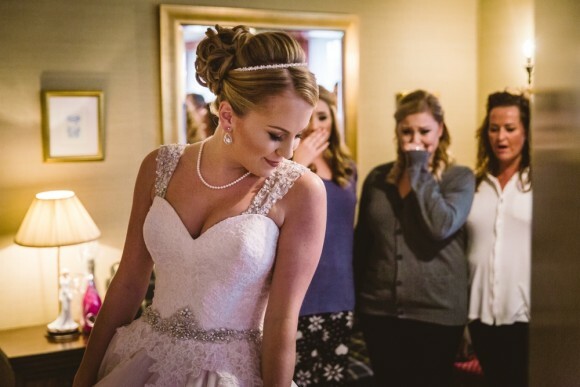 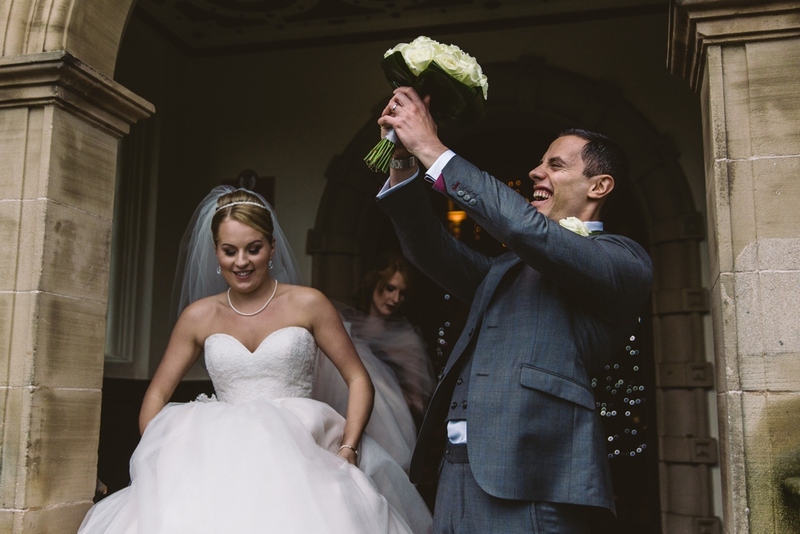 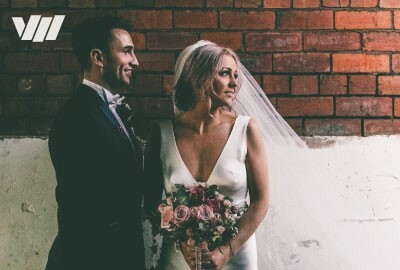 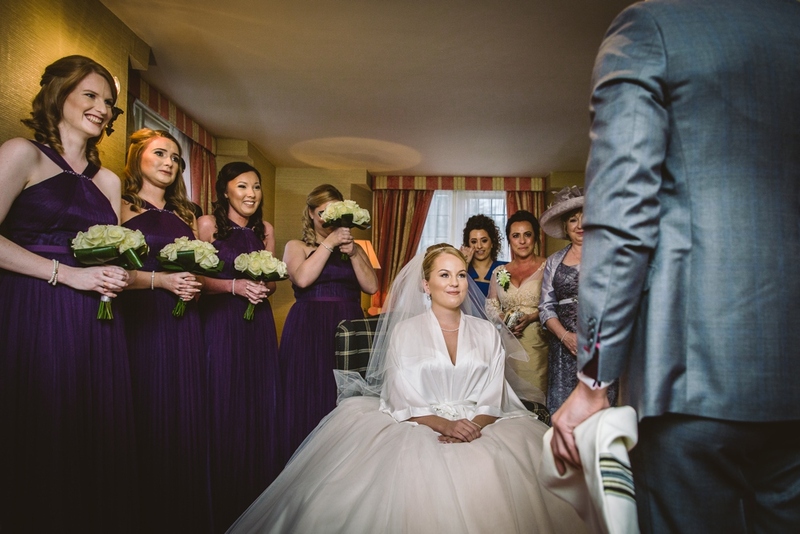 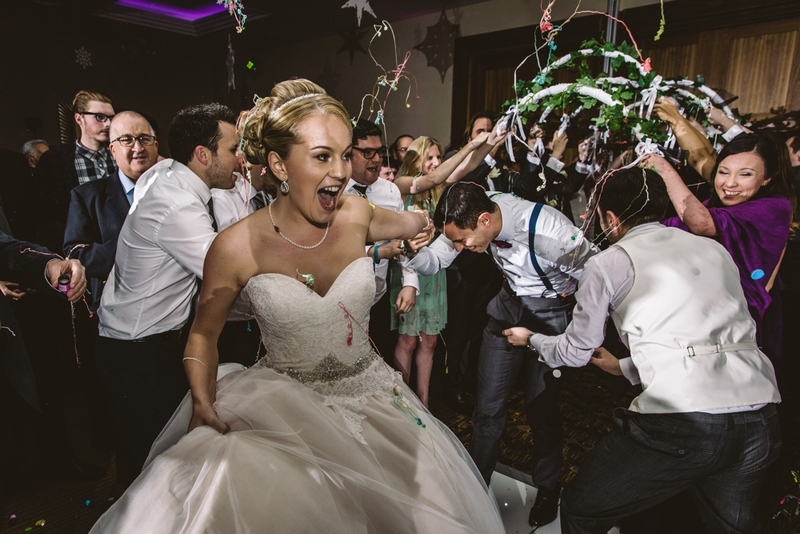 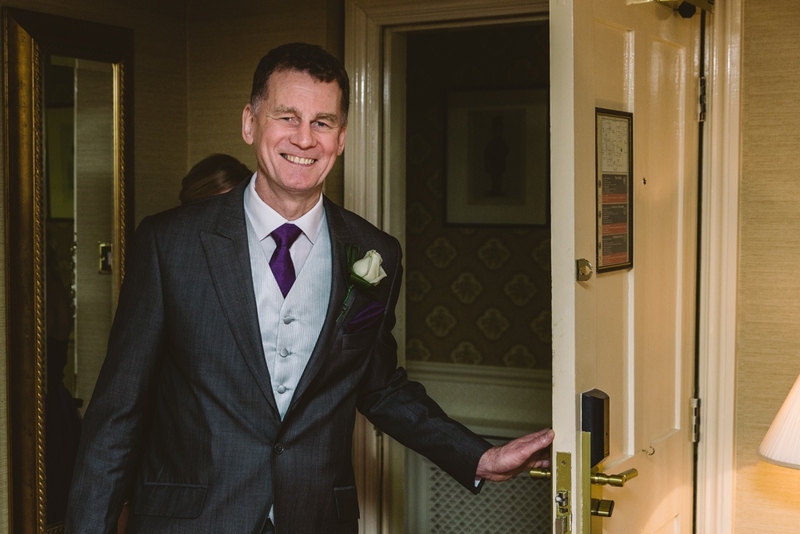 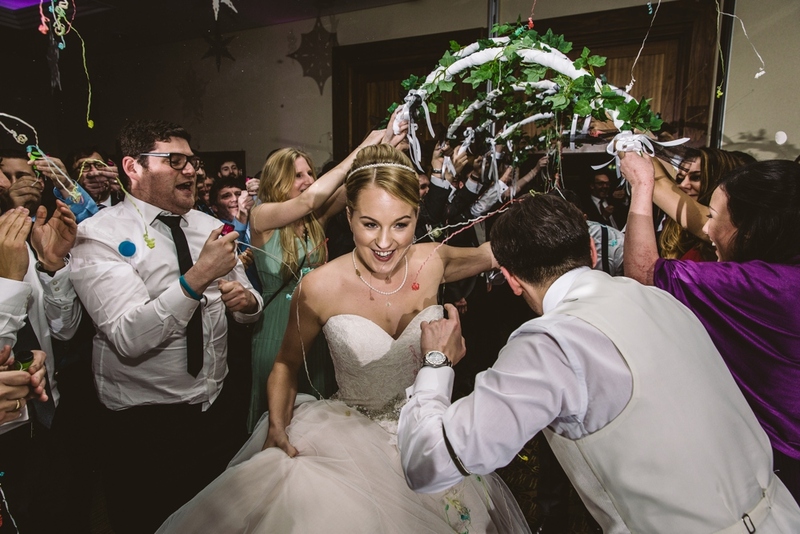 What we love most about today’s real wedding is the expressions of happiness, excitement and joy on the faces of the bride and groom – and their (200 plus!) 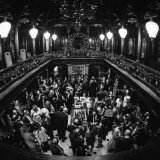 guests. 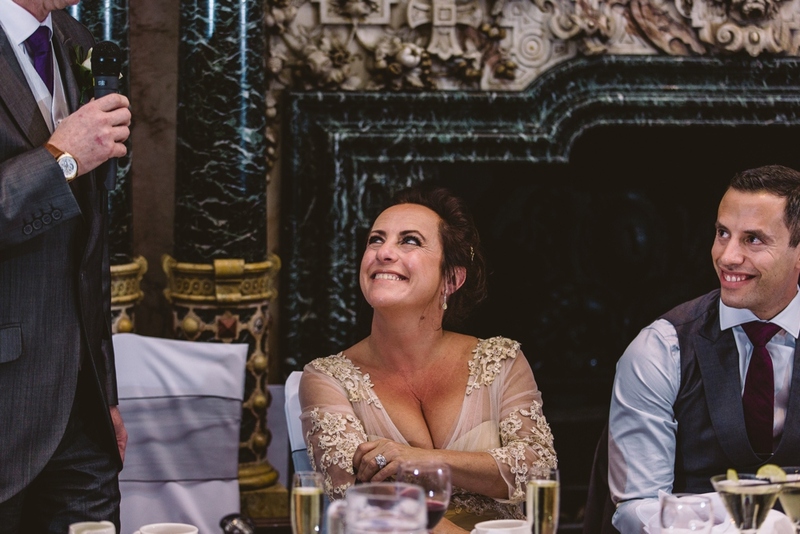 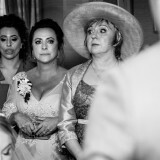 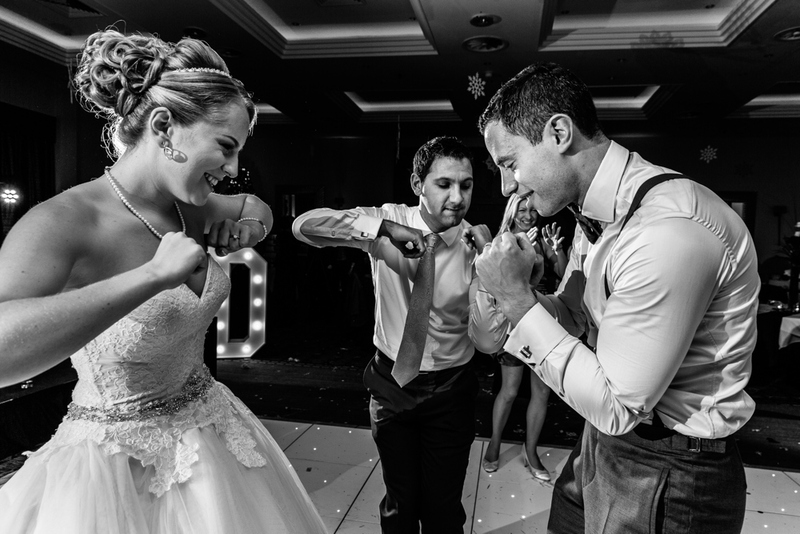 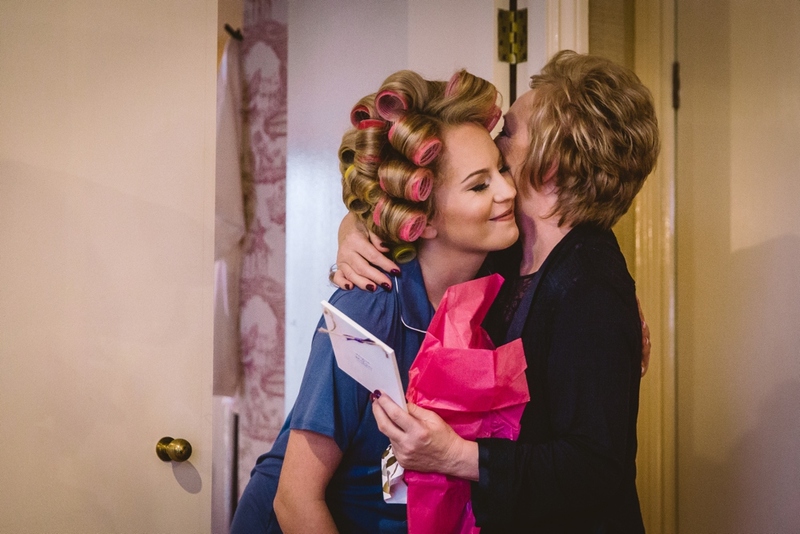 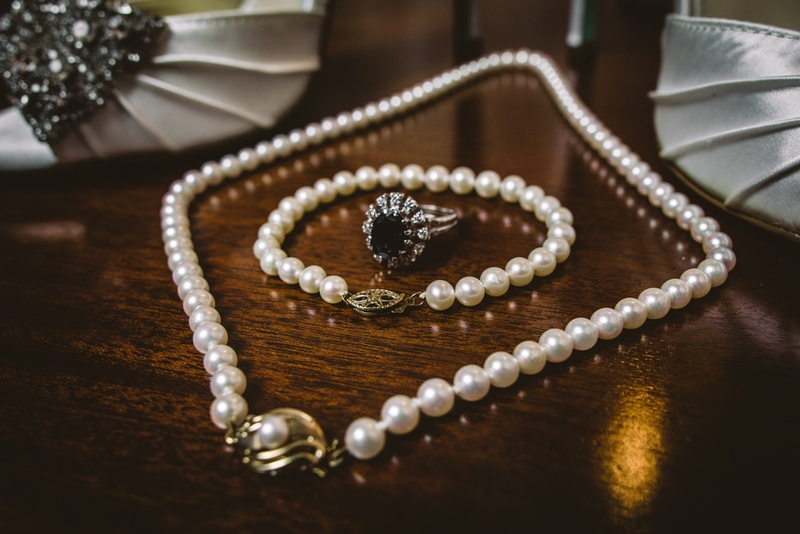 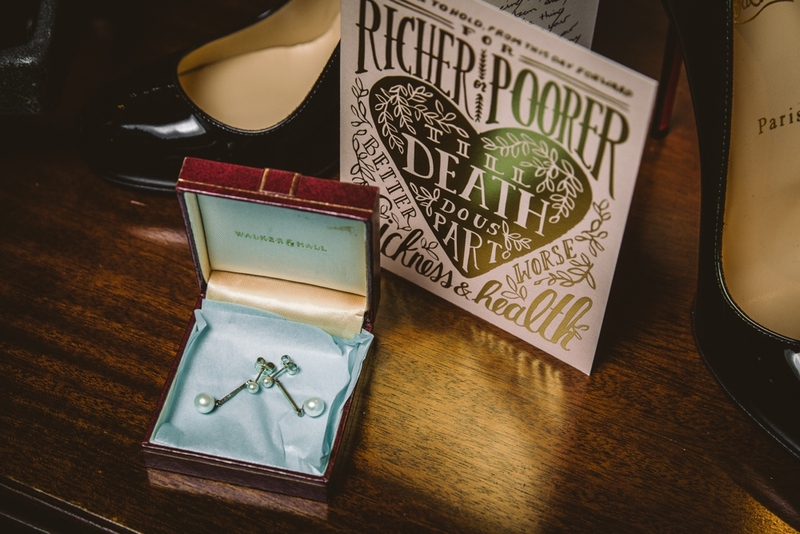 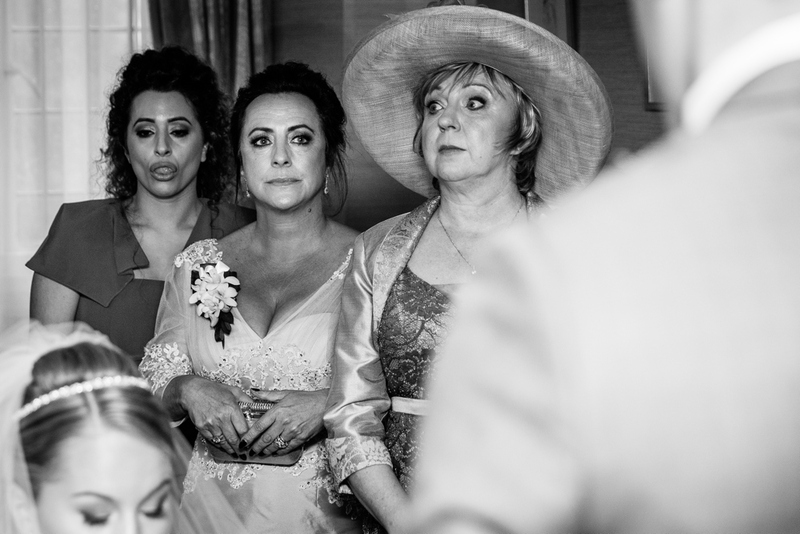 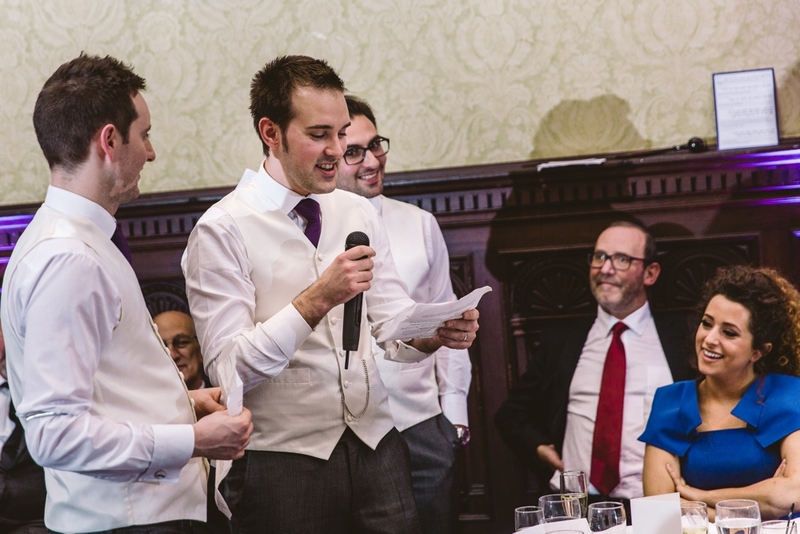 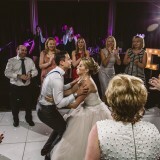 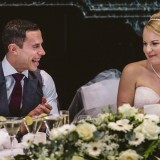 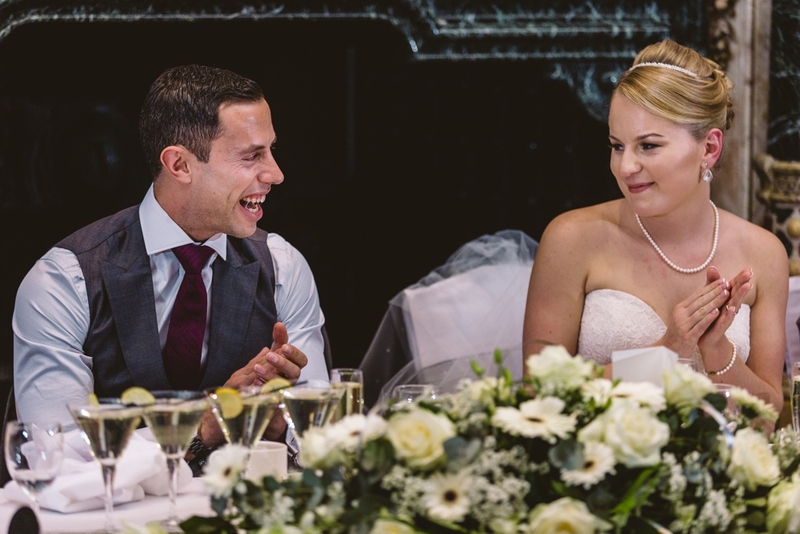 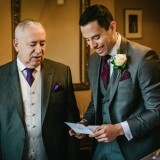 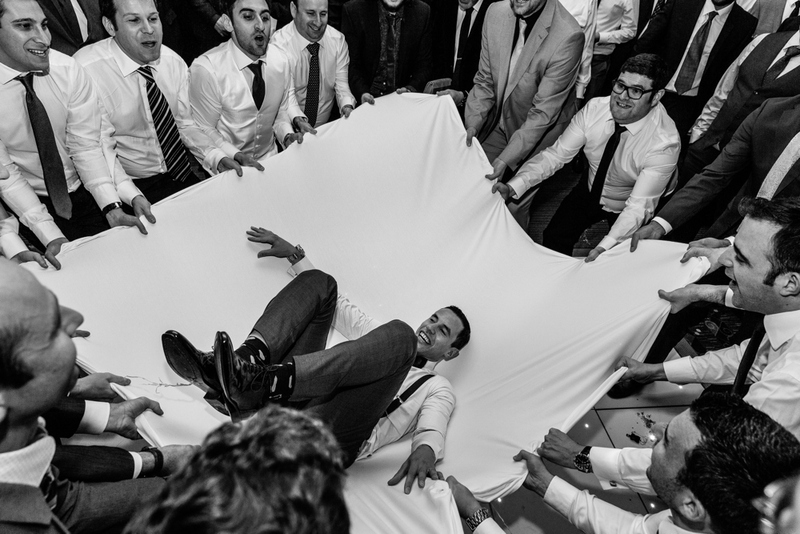 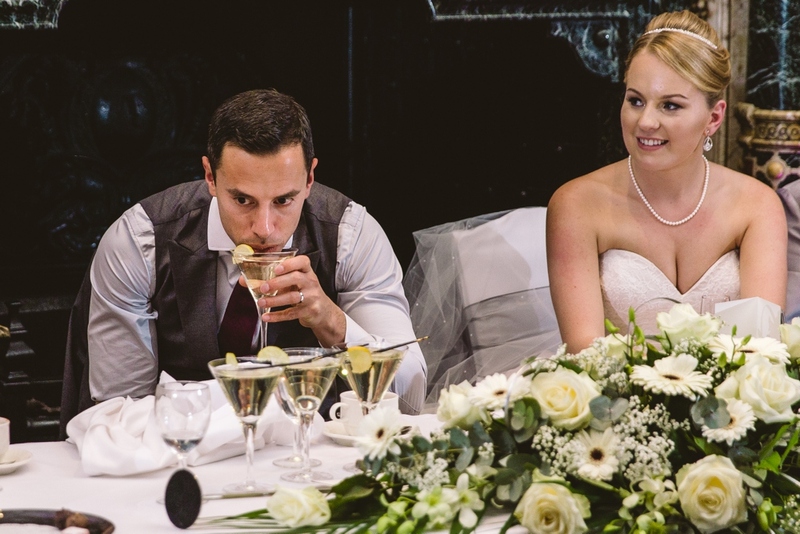 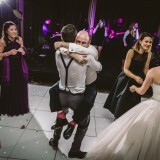 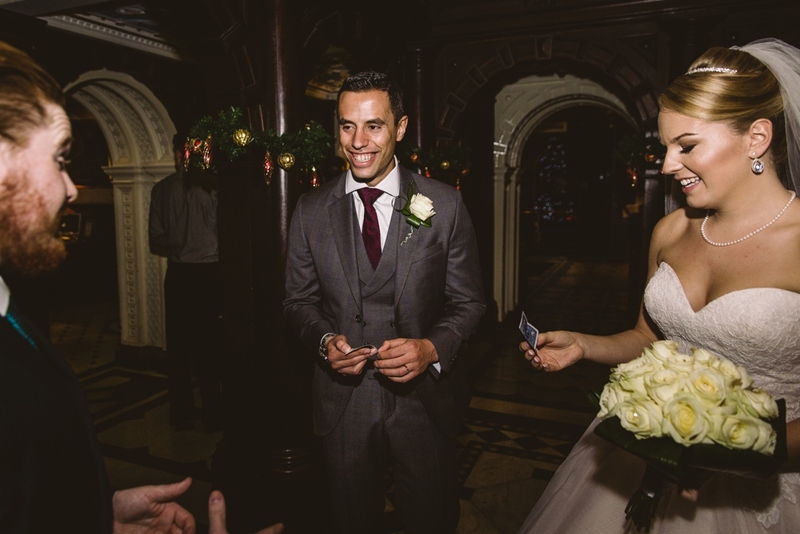 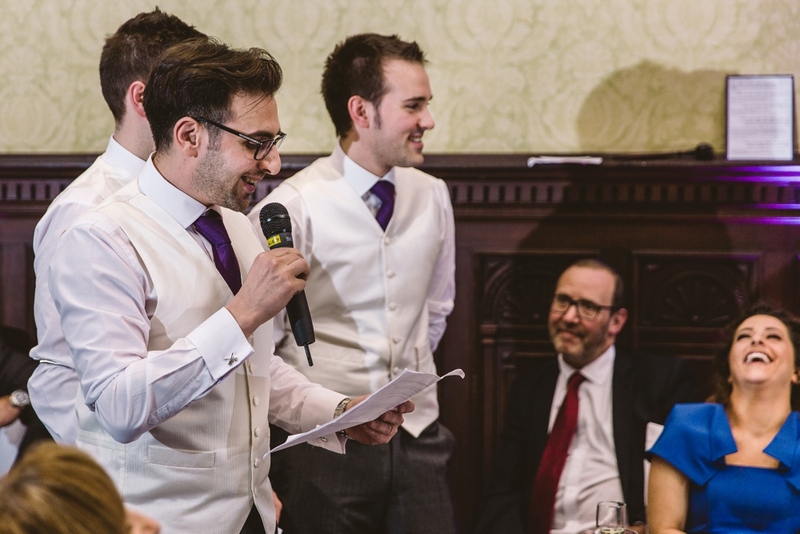 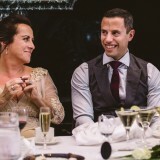 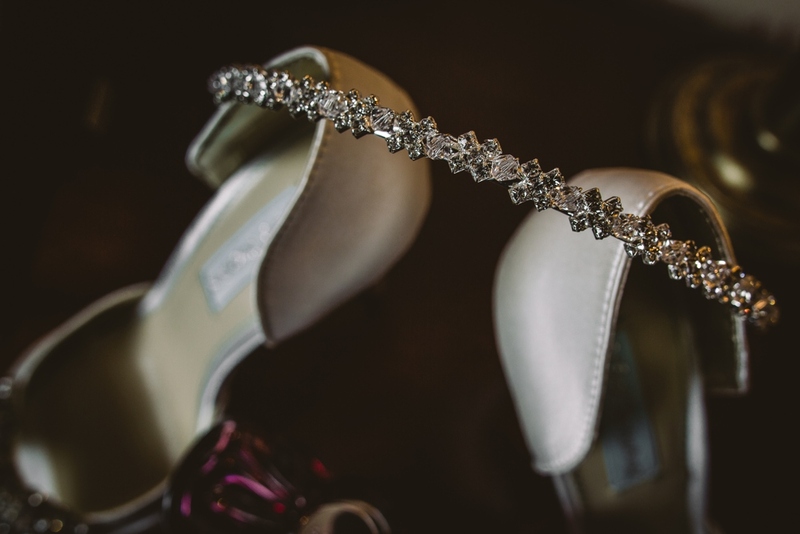 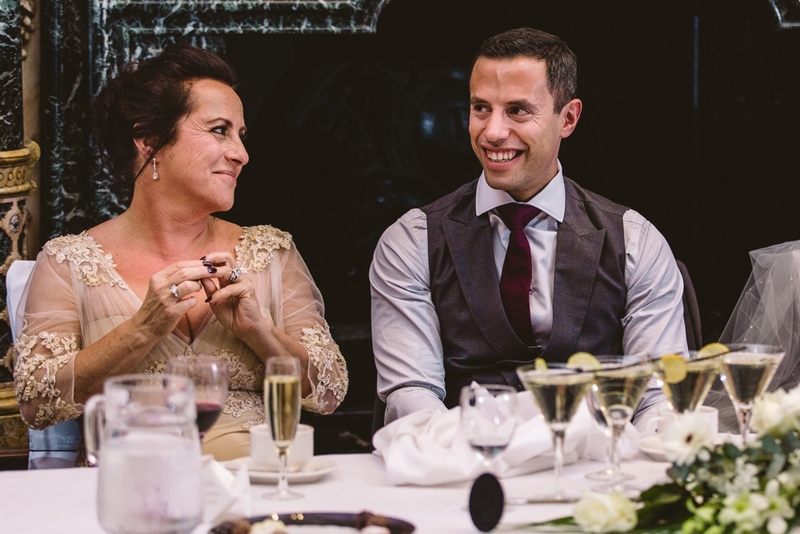 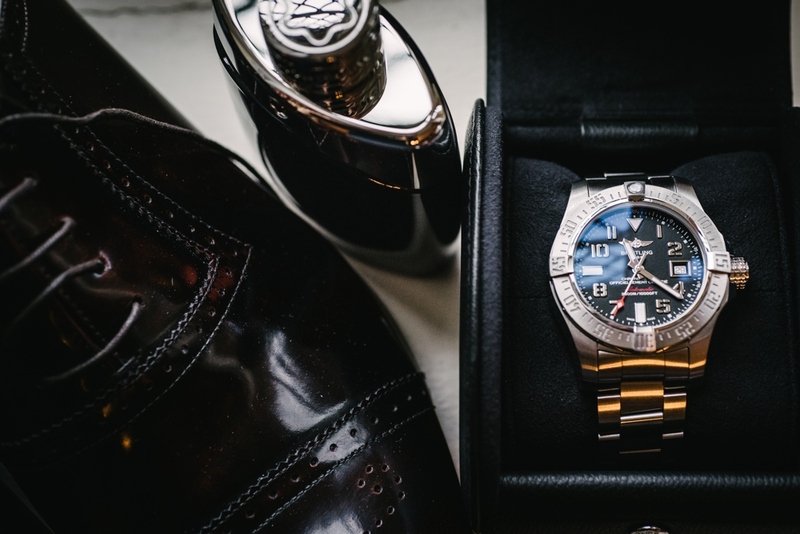 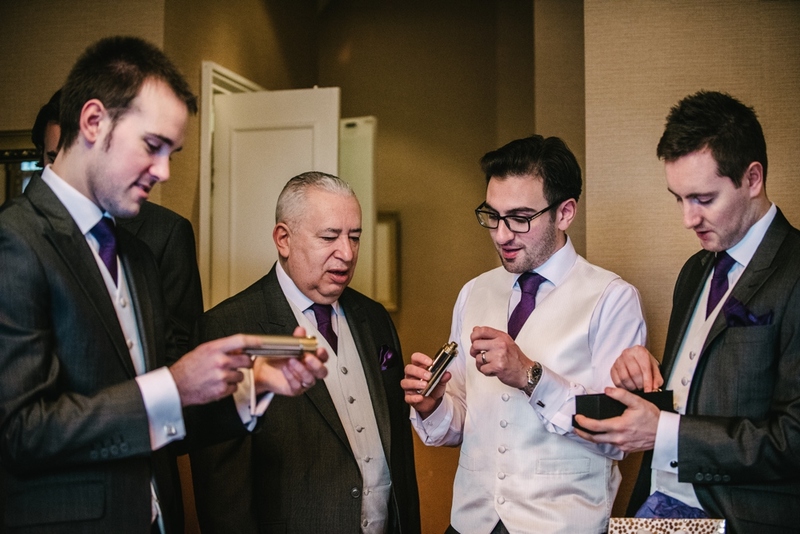 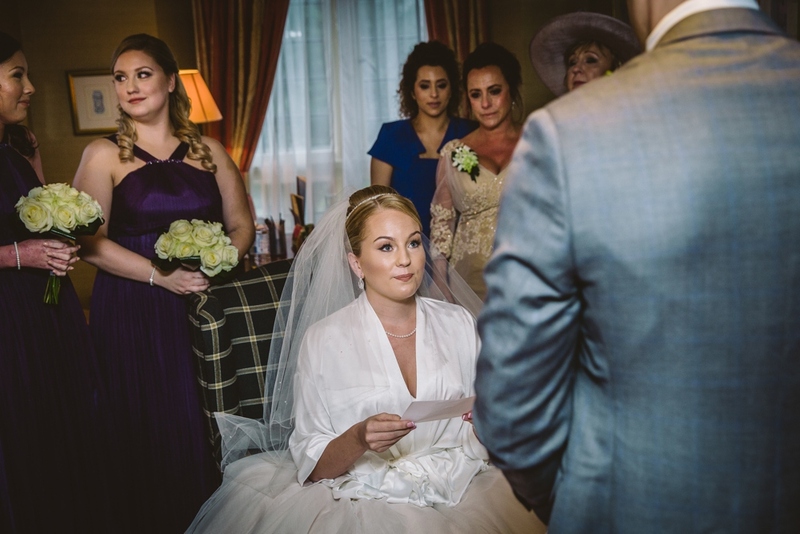 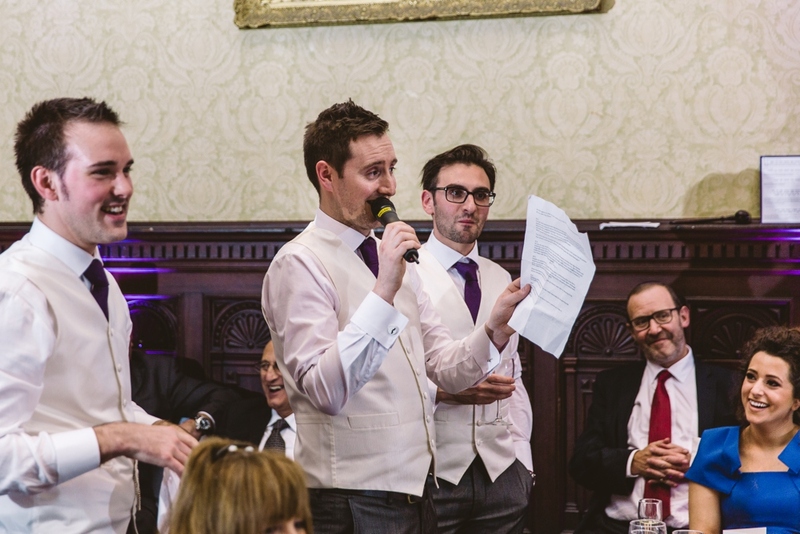 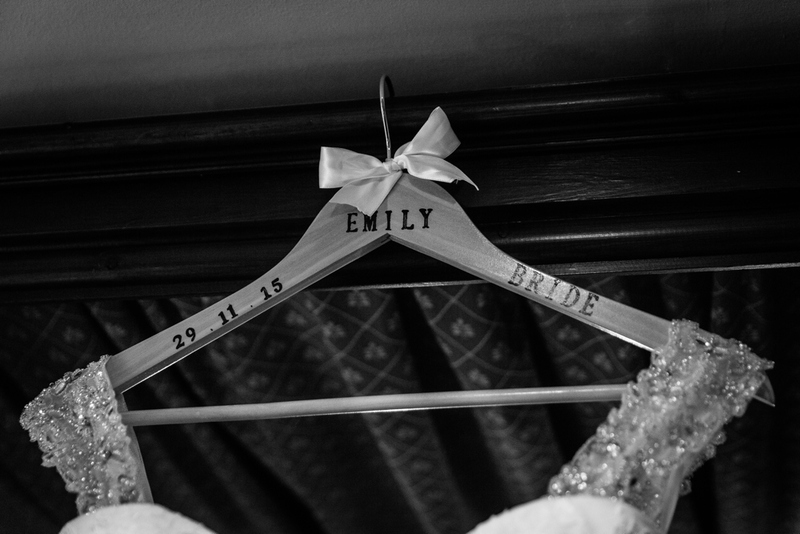 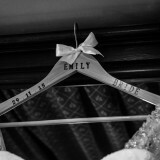 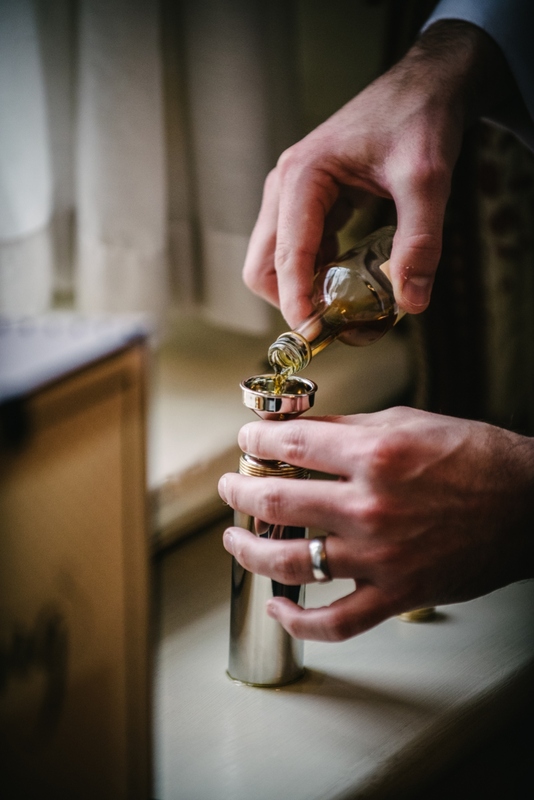 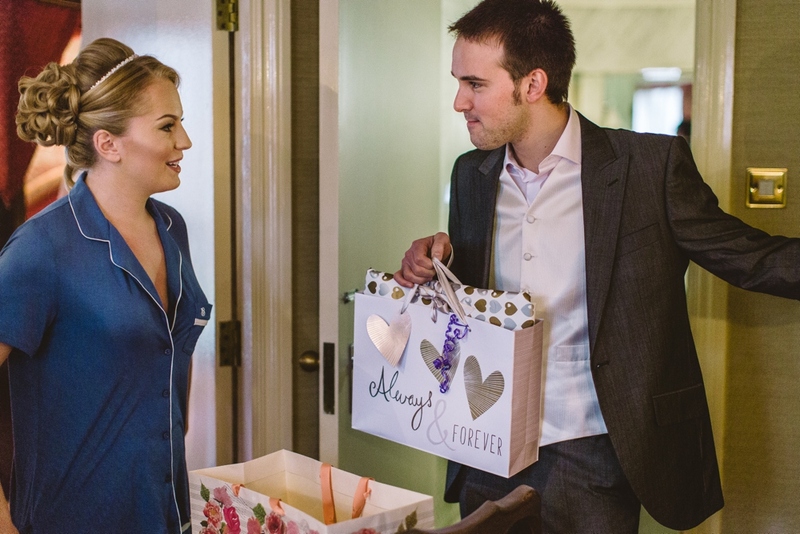 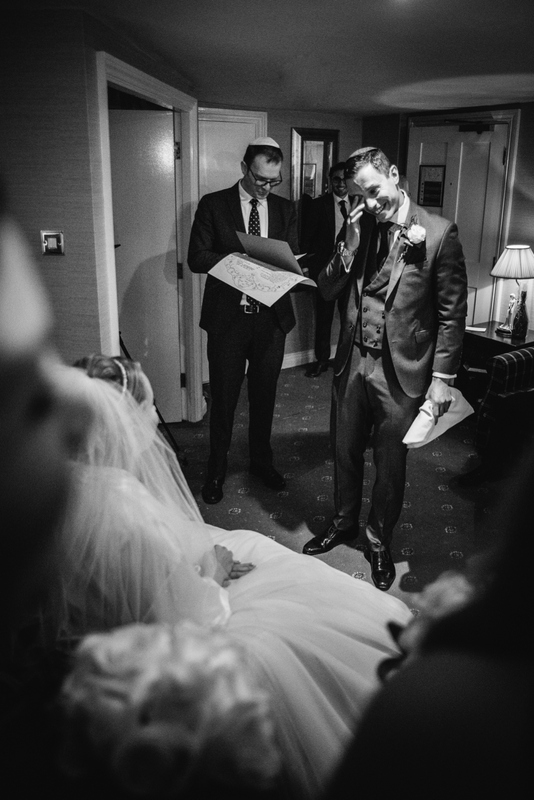 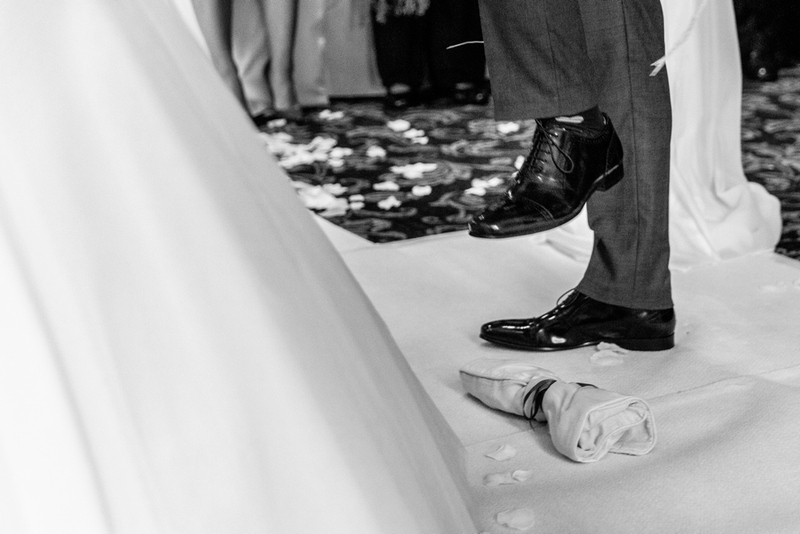 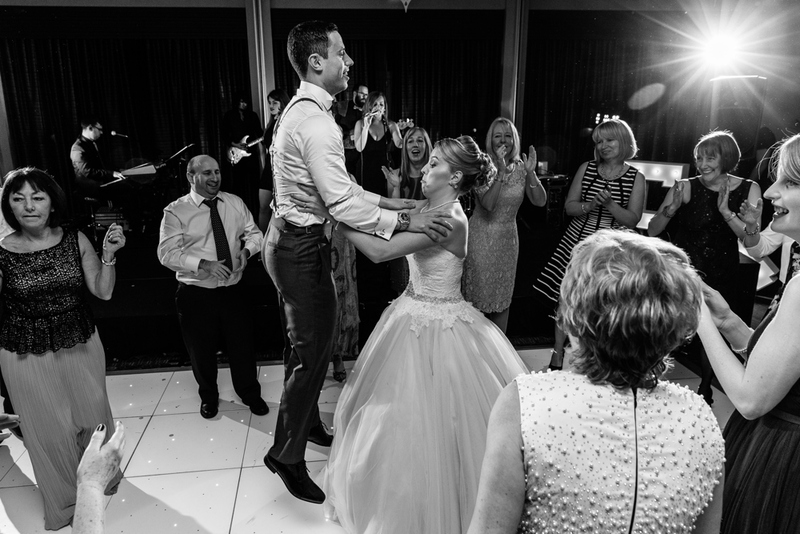 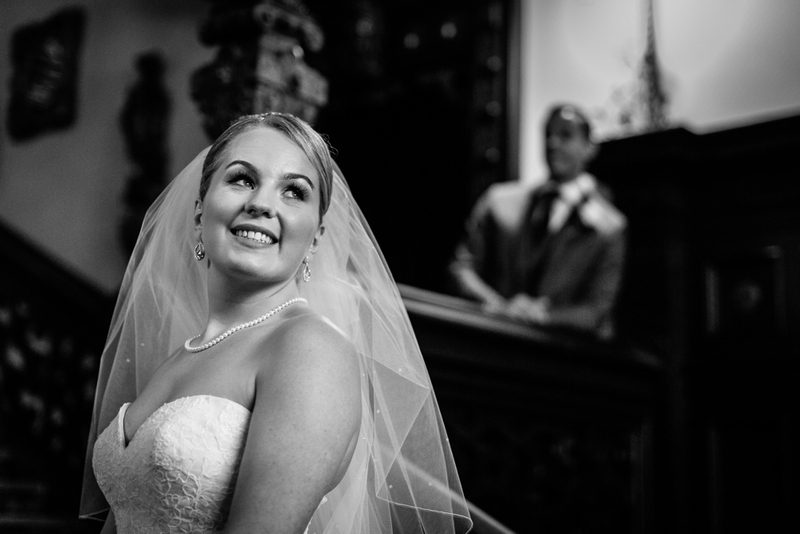 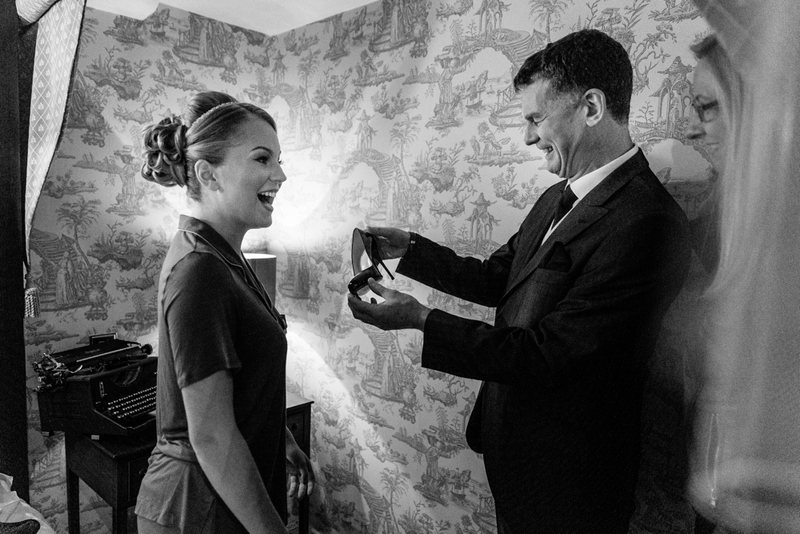 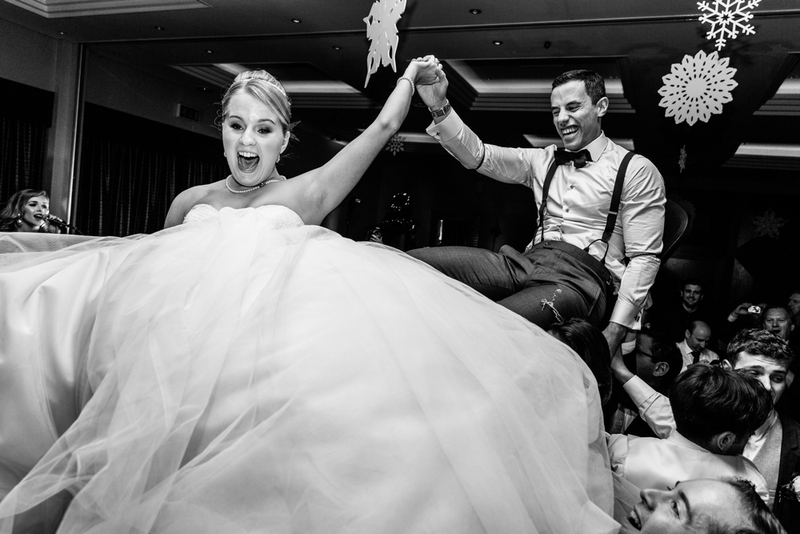 A wedding day, of course, involves some very serious commitments, but we think it should also be a fun occasion filled with laughter, love and emotions, which Emily and David’s big day certainly was. 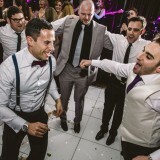 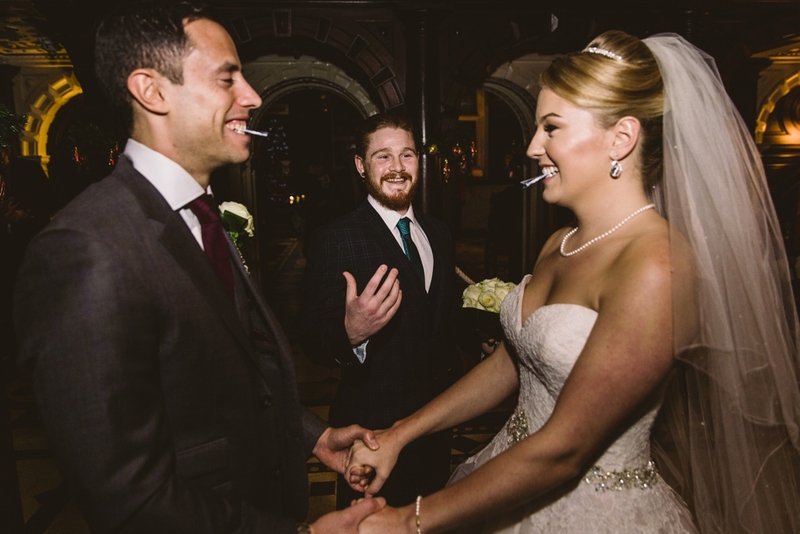 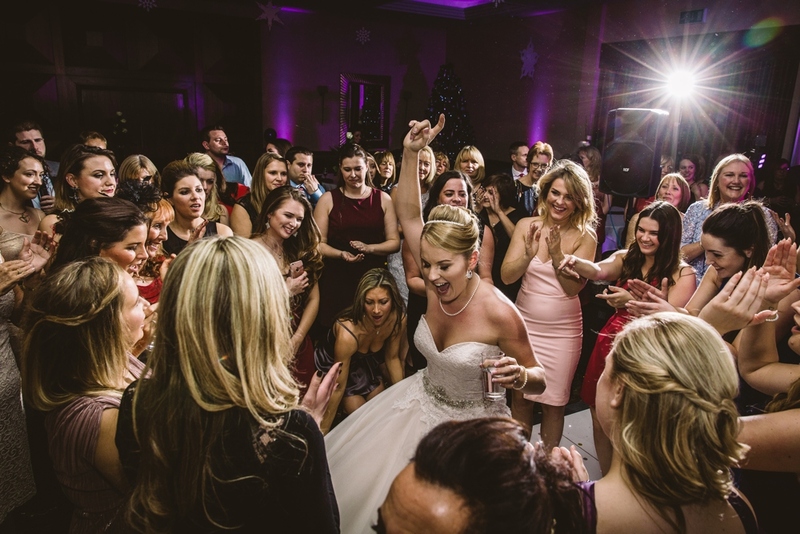 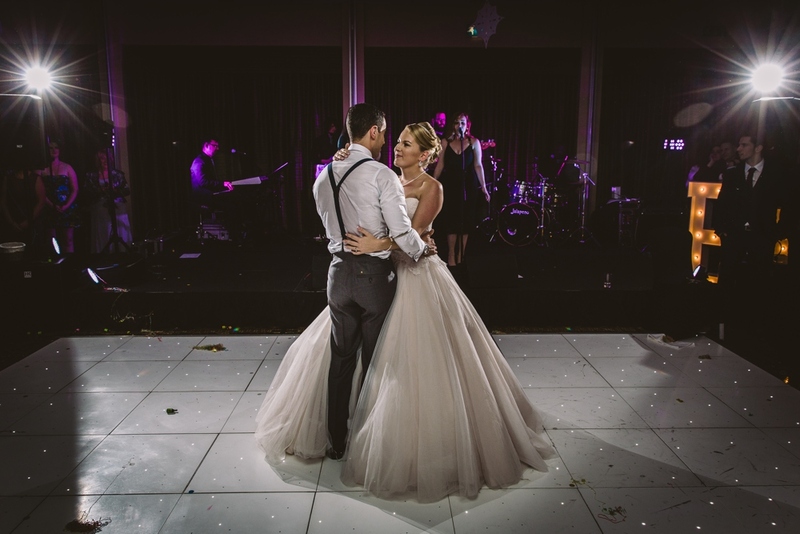 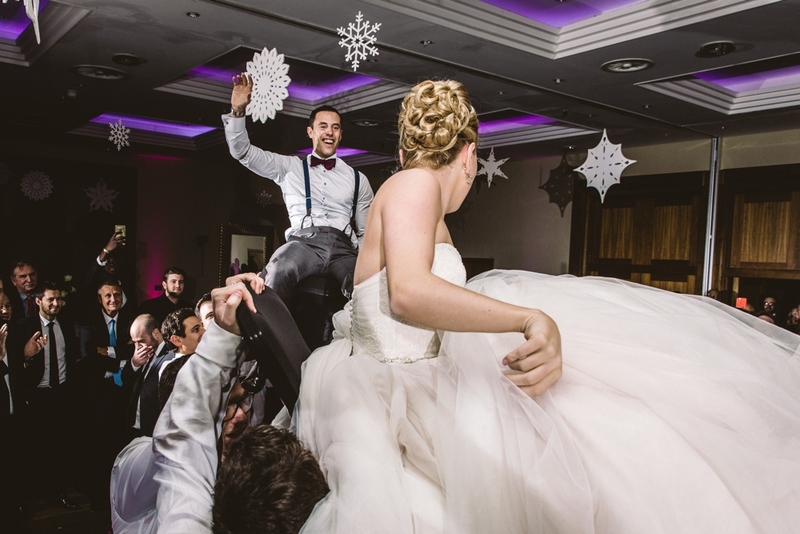 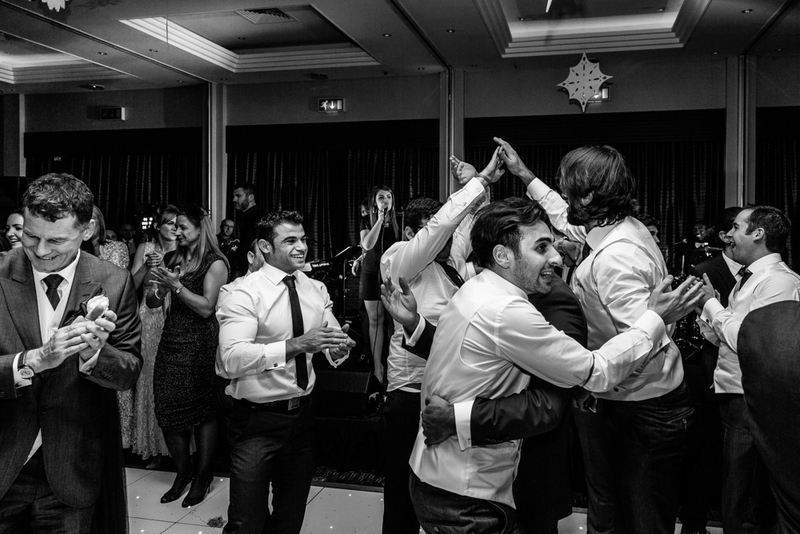 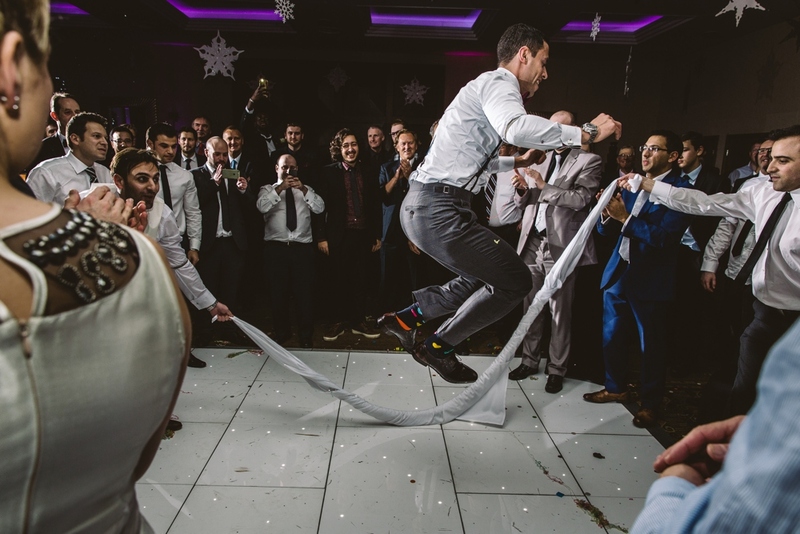 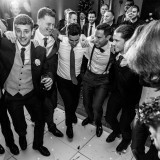 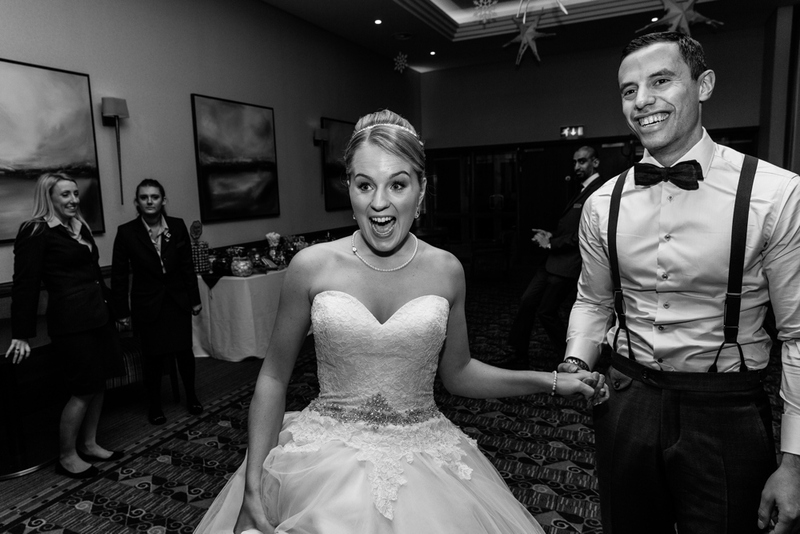 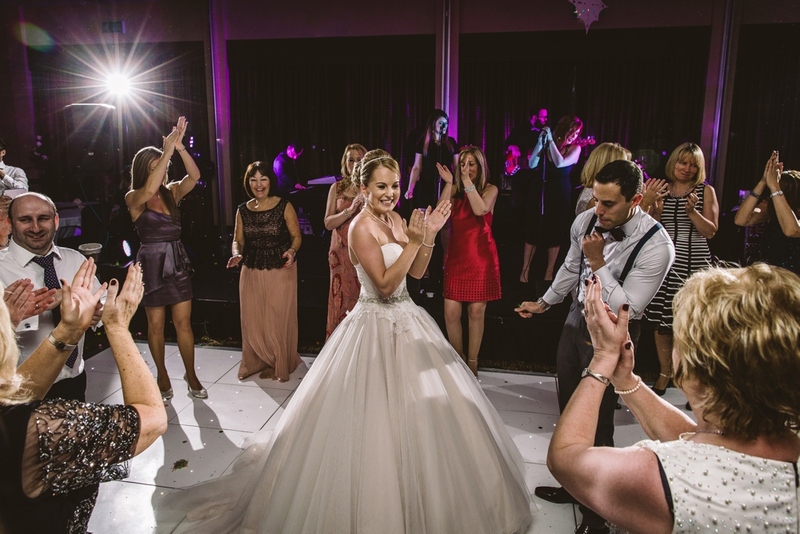 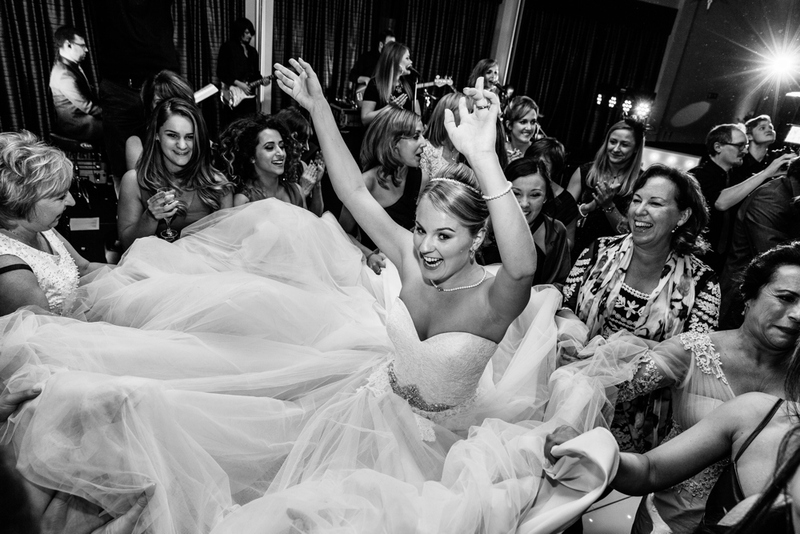 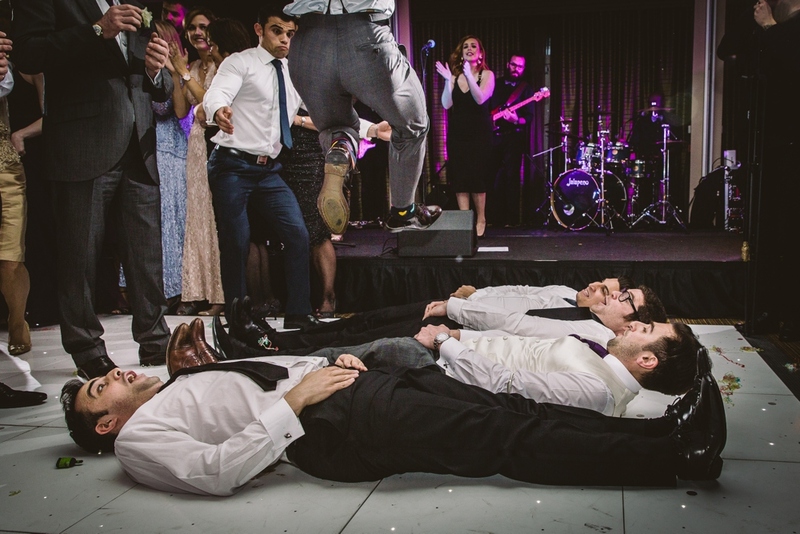 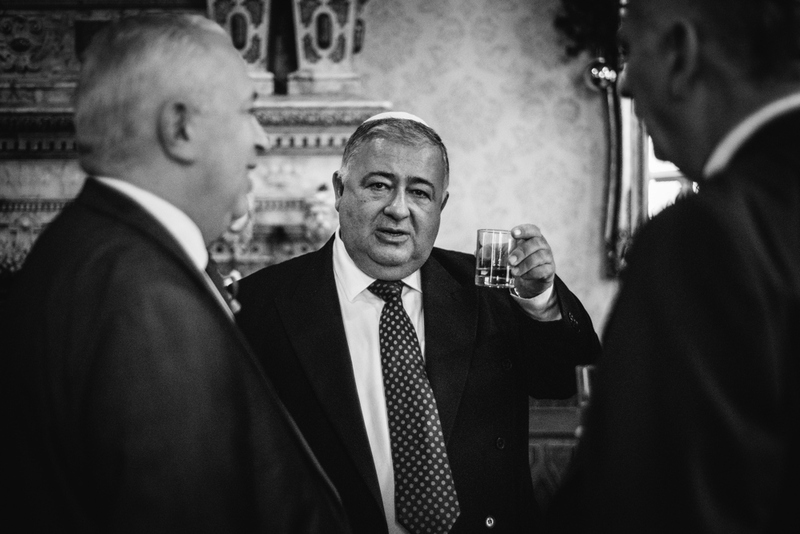 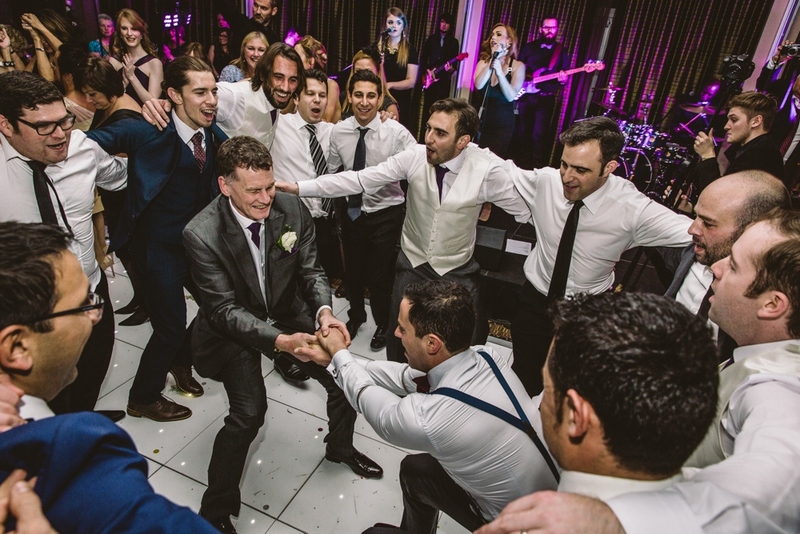 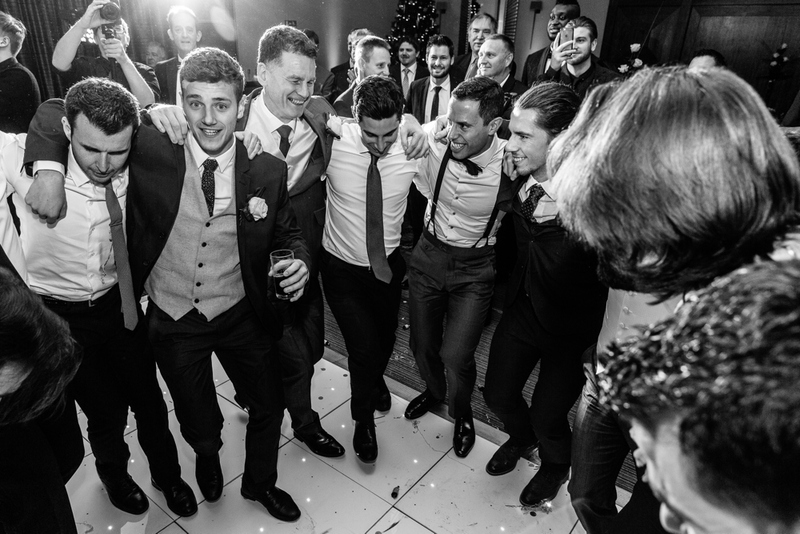 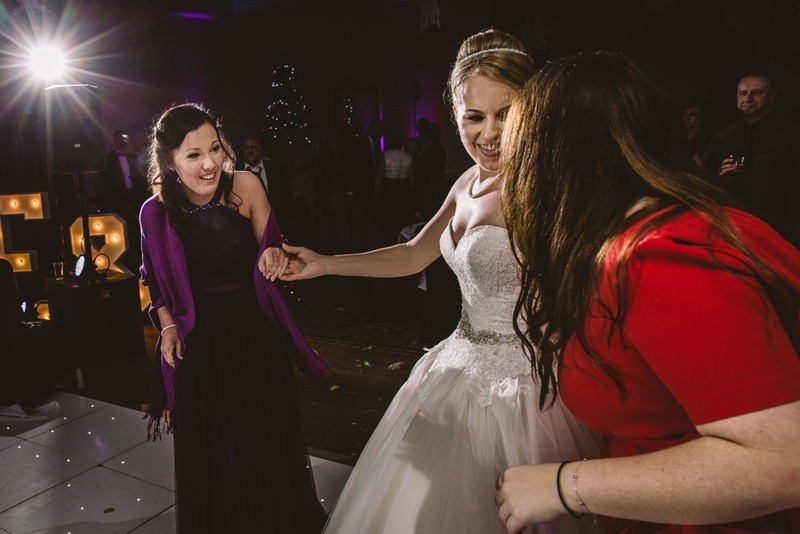 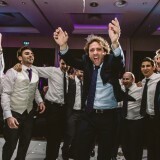 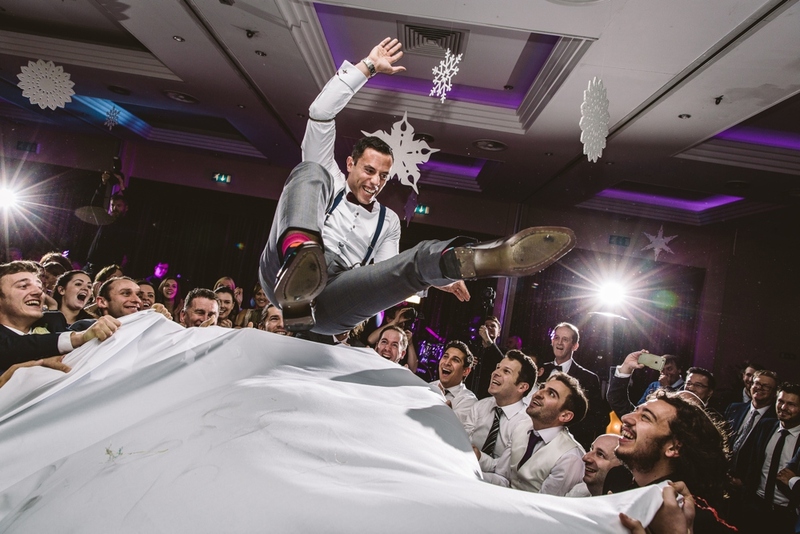 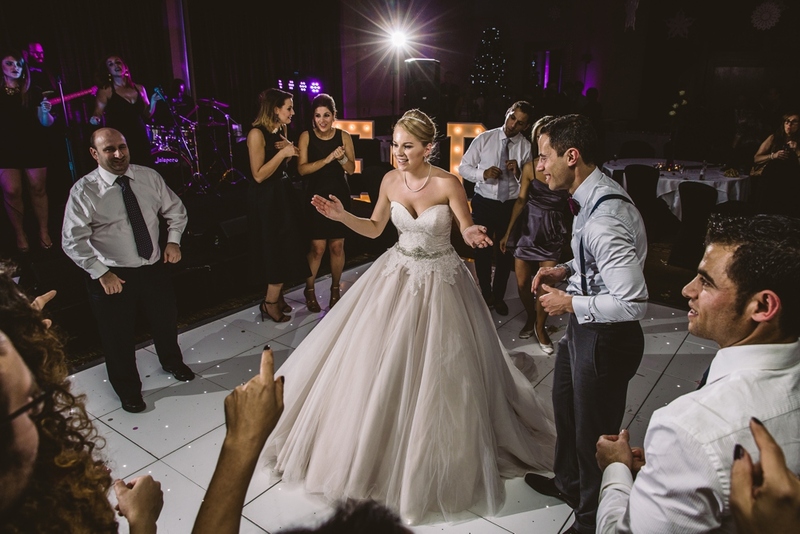 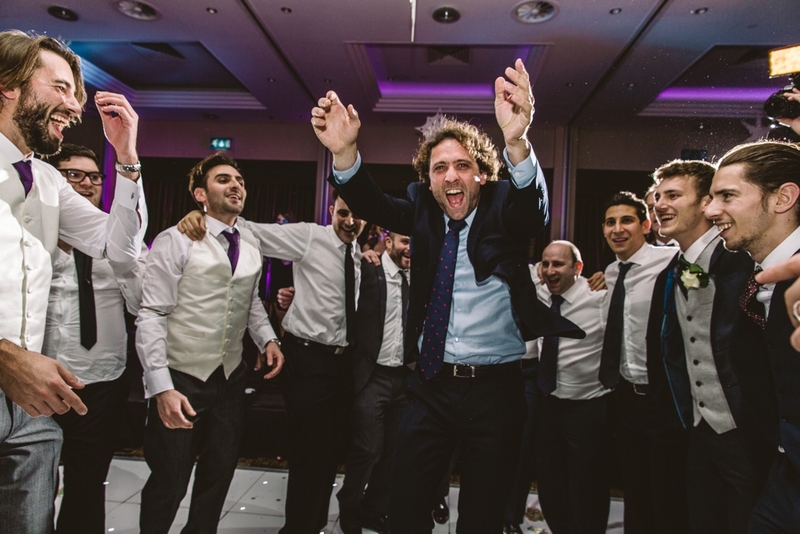 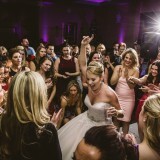 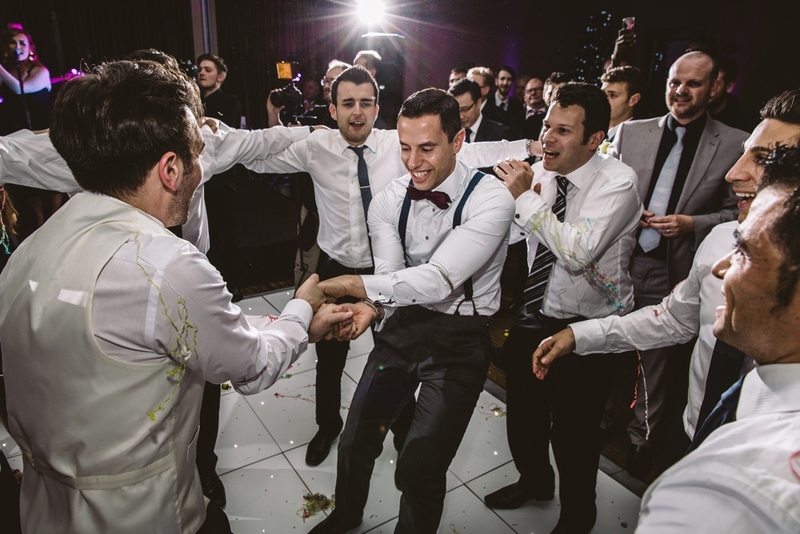 From their traditional ceremony and breakfast to their ‘party style’ evening reception, it’s clear to see that everyone is having an amazing time! 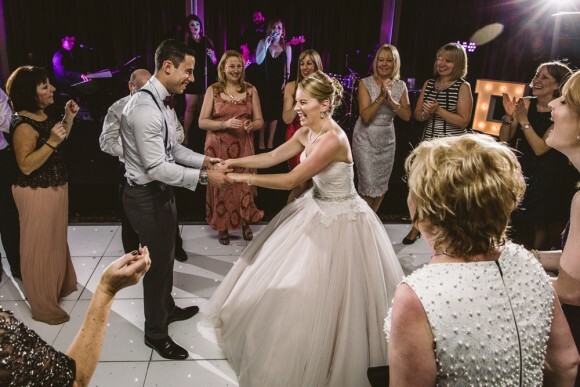 Throw in the fabulous styling, attire and venue and you’ve got one pretty perfect wedding! 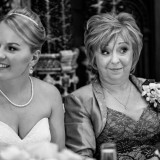 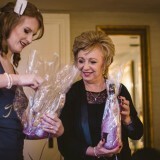 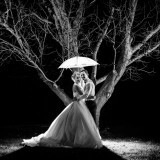 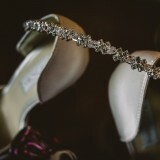 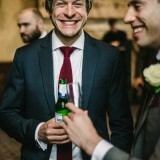 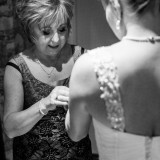 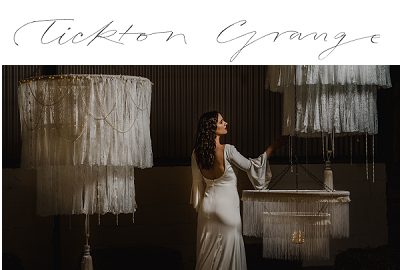 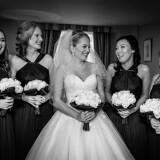 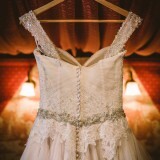 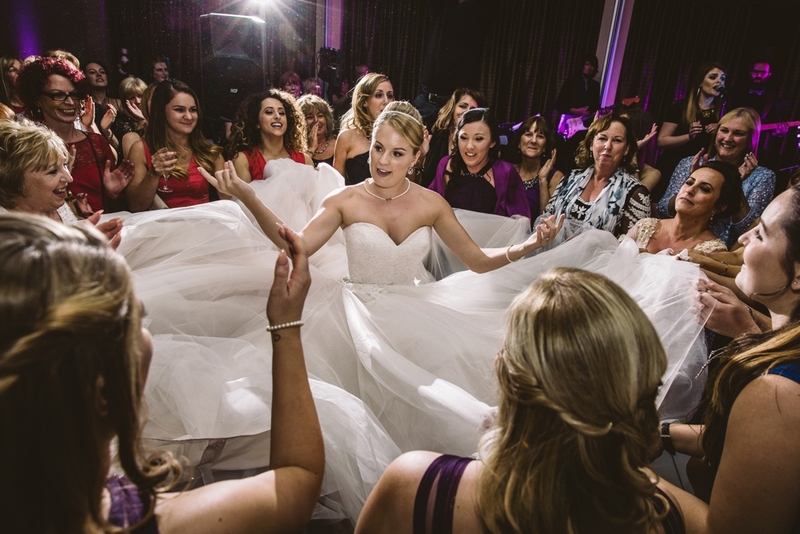 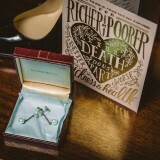 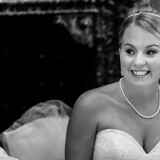 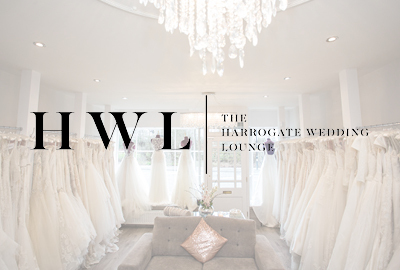 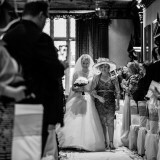 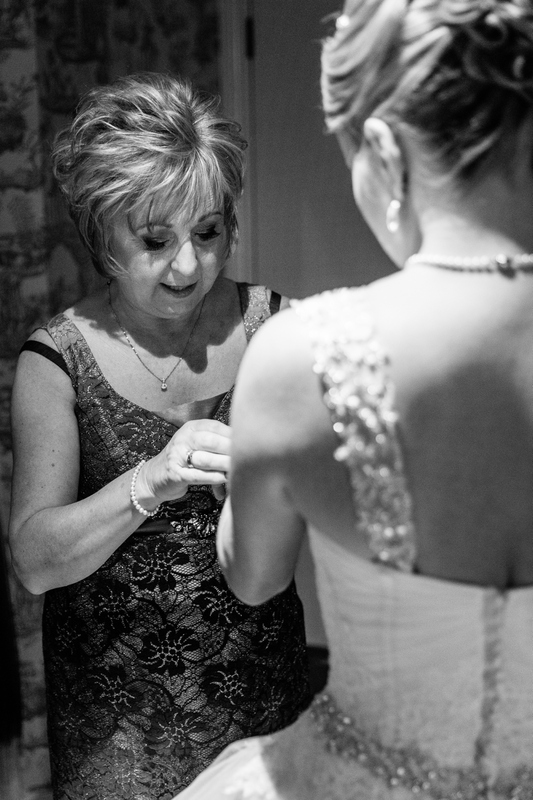 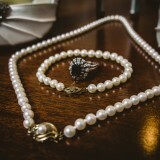 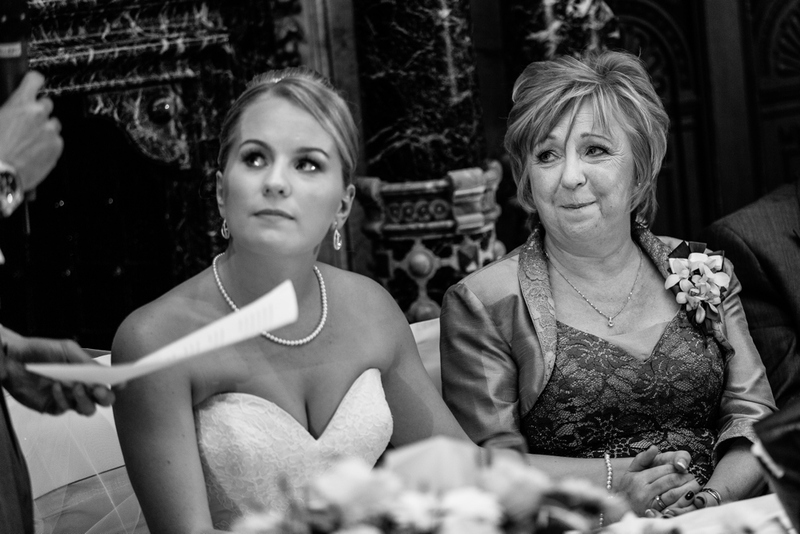 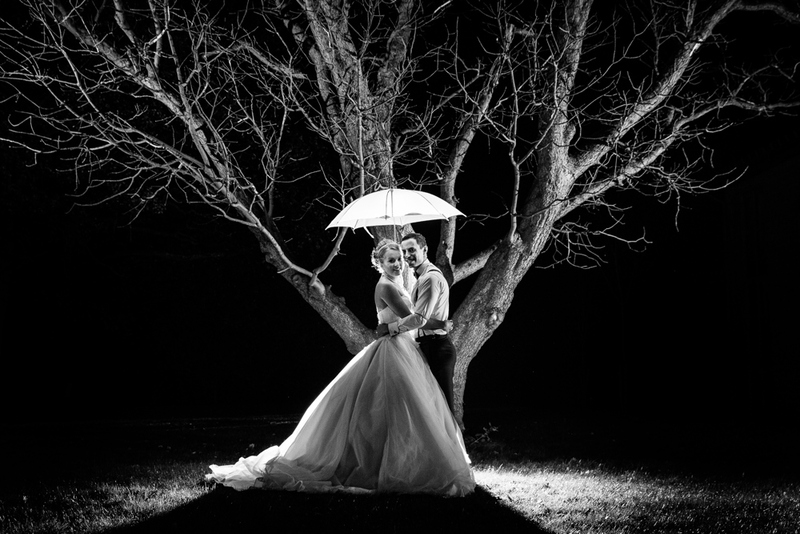 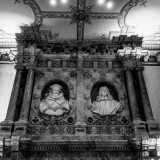 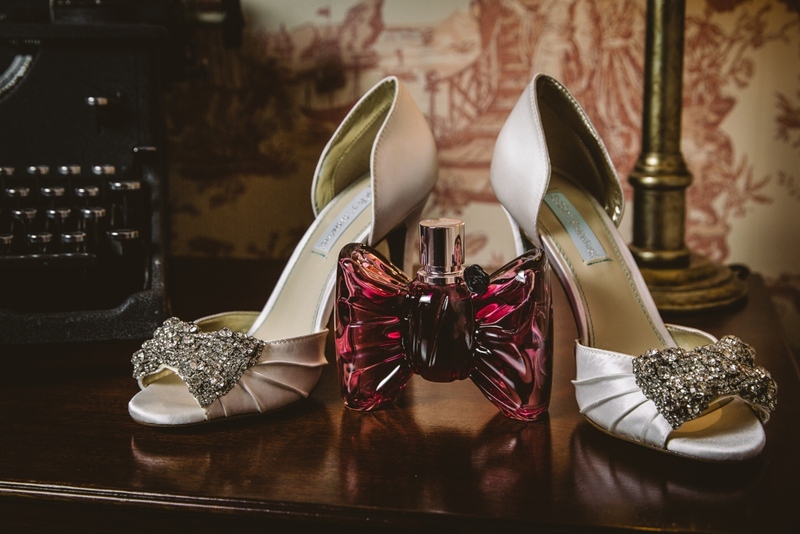 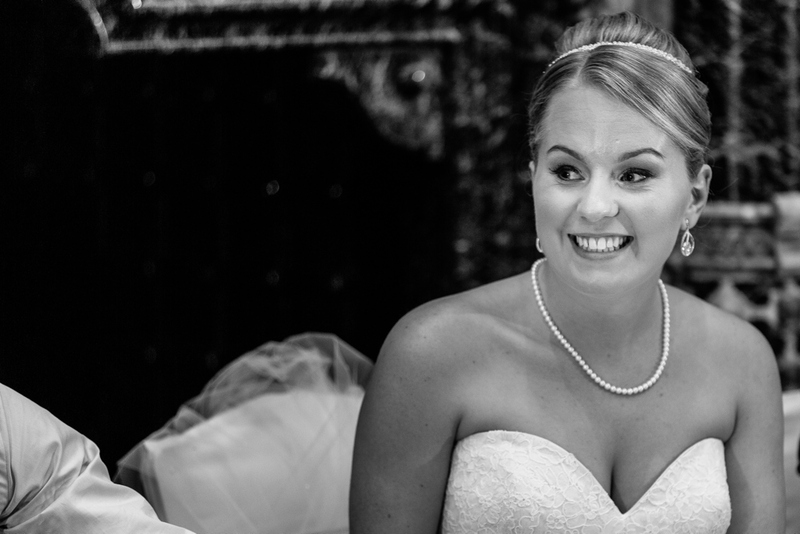 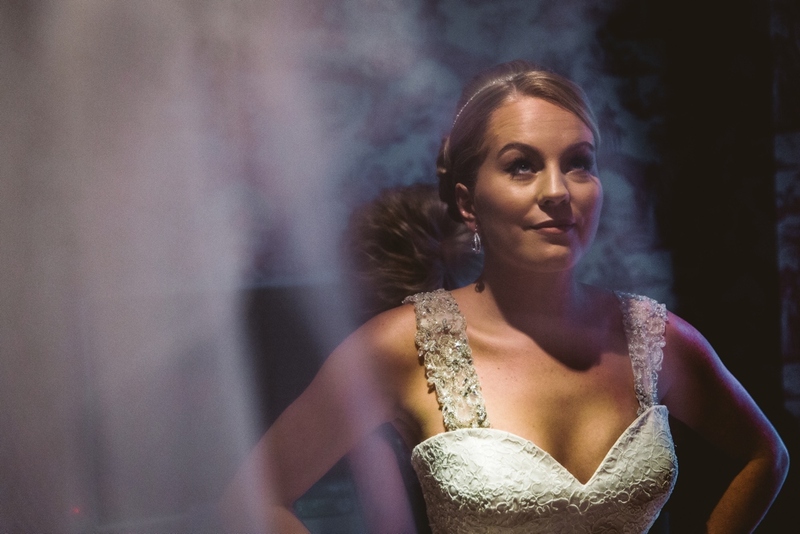 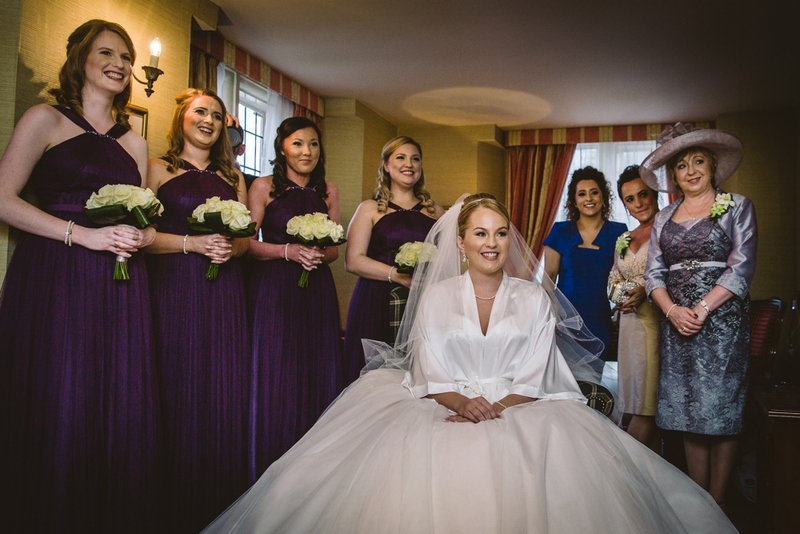 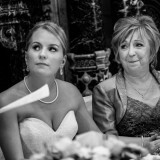 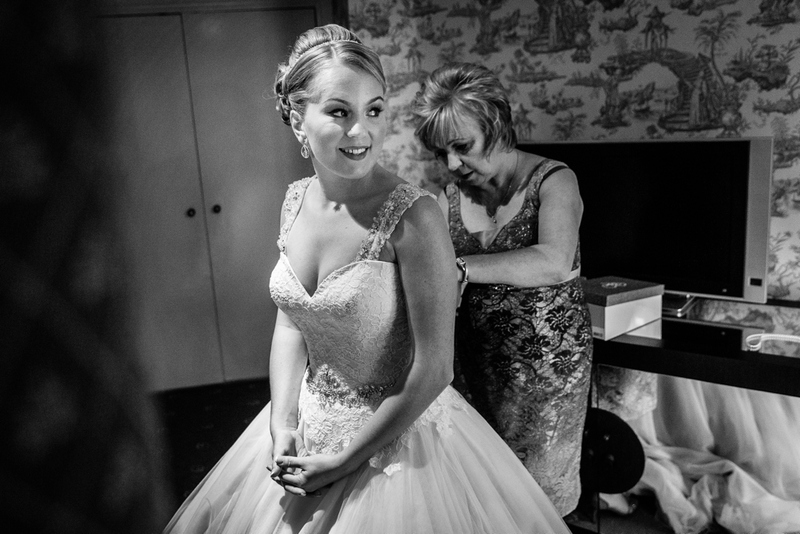 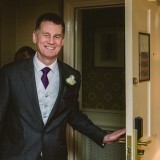 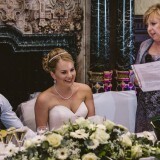 With images by brilliant Brides Up North Sponsor Lee Brown Photography. 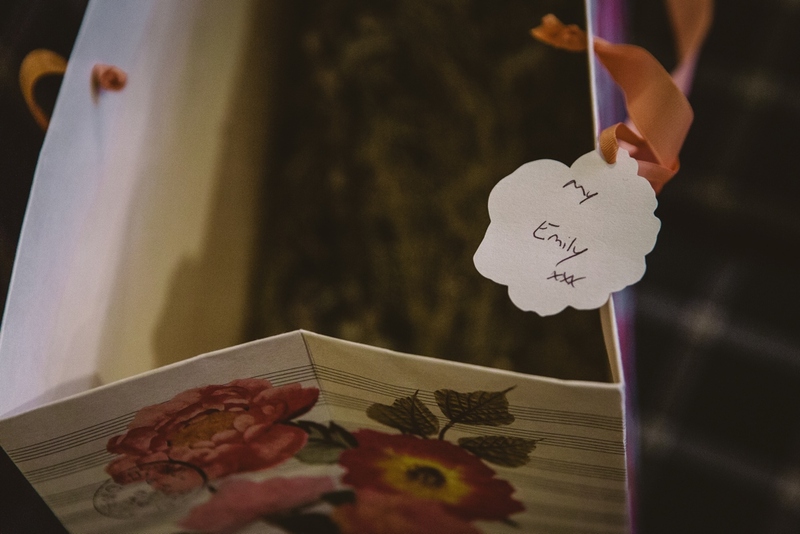 emily says: We got engaged on 19th April 2014, in New York City. 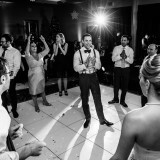 David had arranged a private experience for us in our hotel’s rooftop bar that overlooked Times Square. To keep the surprise, David had told me that we had won this in a Facebook competition, but of course it was all a set up! 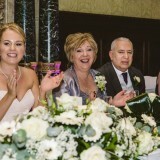 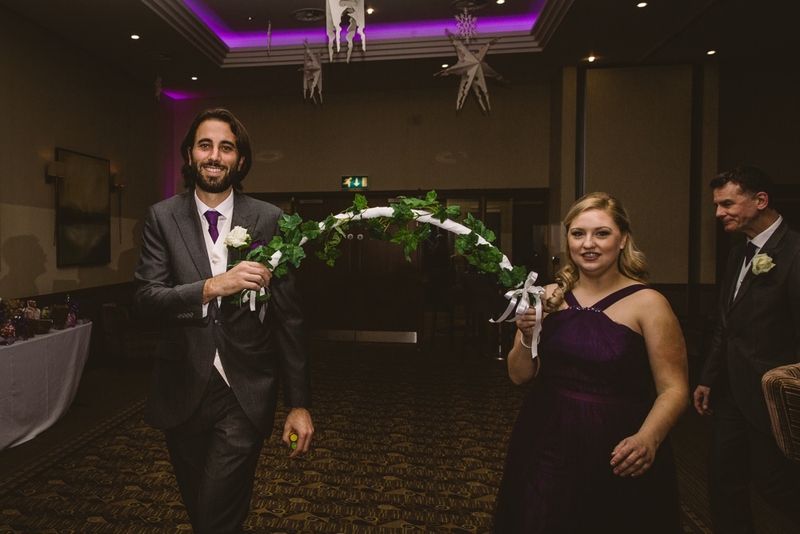 Our wedding was on Sunday 29th November 2015. 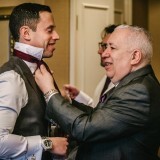 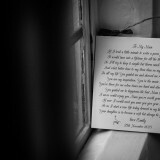 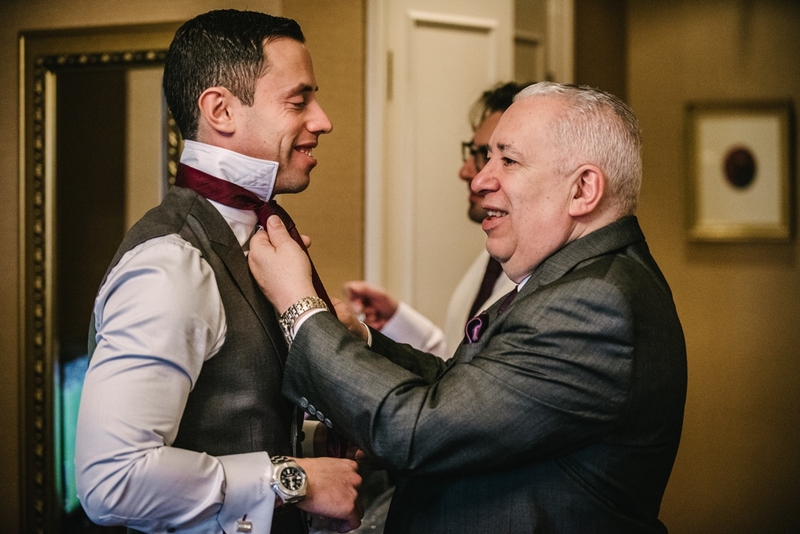 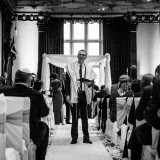 As we had a Jewish wedding, this impacted the days of the week that were open to us and explains why we chose a Sunday. 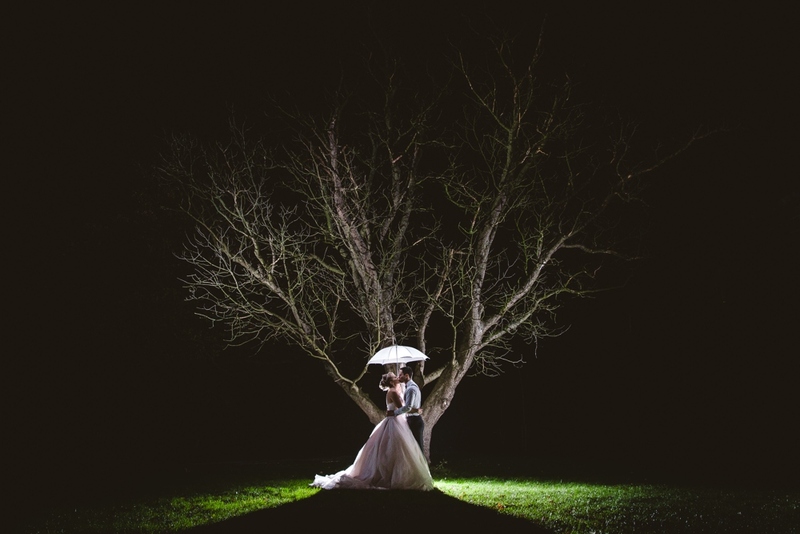 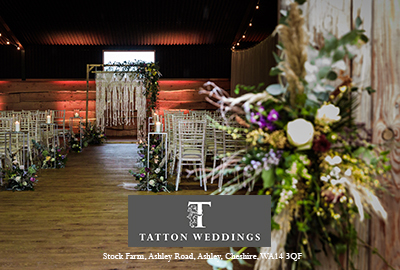 We decided on a winter wedding because David’s profession means that he is particularly busy with work in the summer months and also because we felt that our venue looked that little bit more magical in the winter. 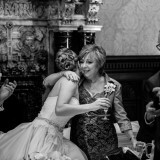 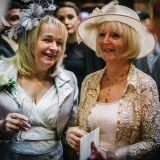 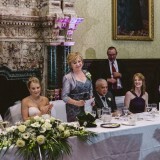 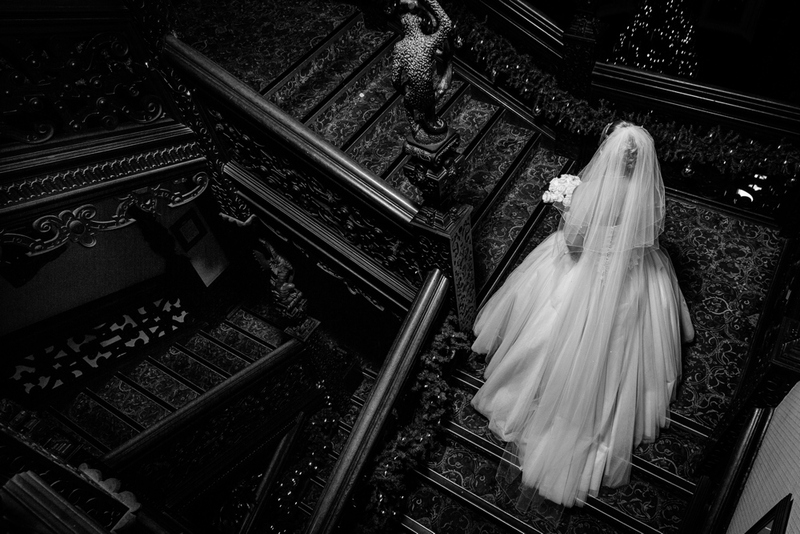 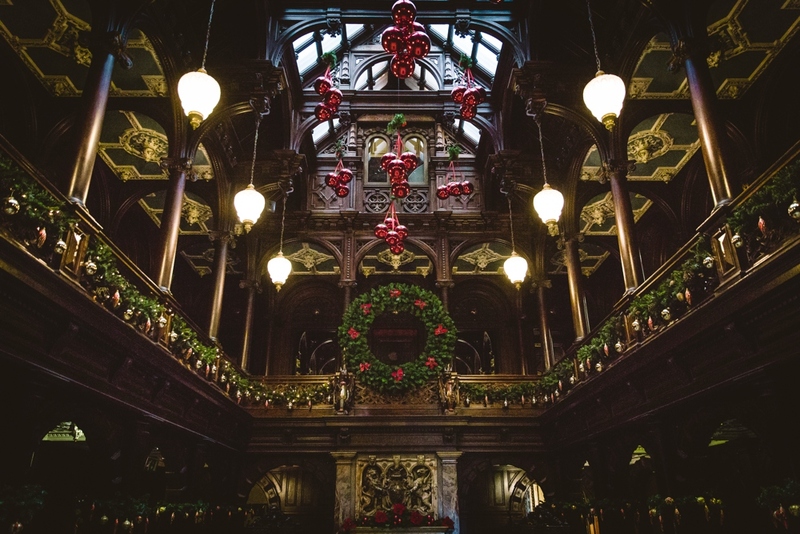 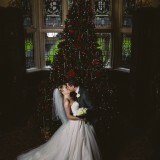 We got married at Crewe Hall. 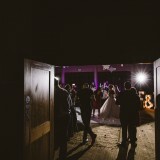 We chose the venue because it was perfect for us. 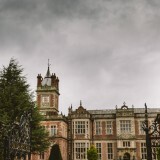 We loved that it had the traditional ‘Downton Abbey’ part of the building but also had a modern wing to the hotel. 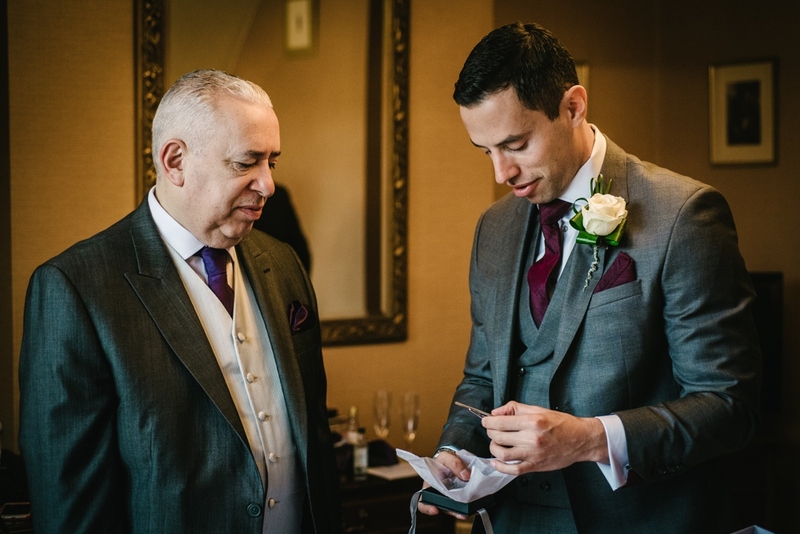 This meant that we were able to have a picturesque wedding ceremony and breakfast in the older parts of the hotel and then move to the modern part for the reception. 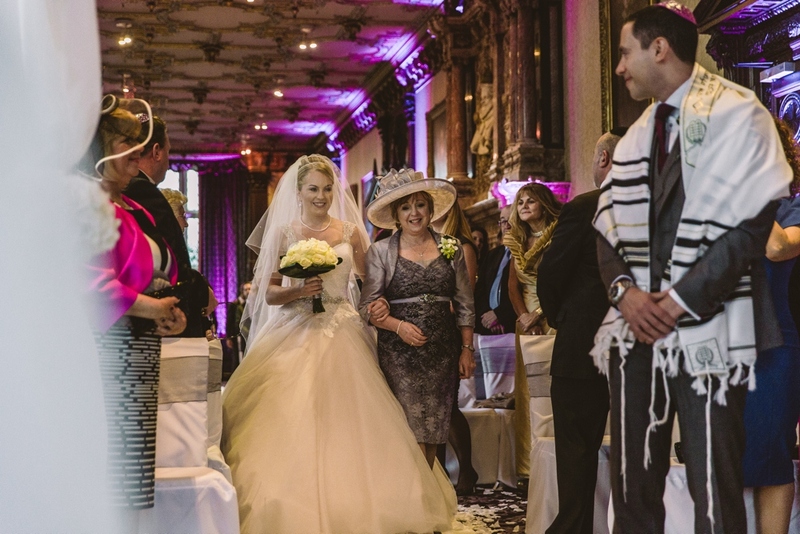 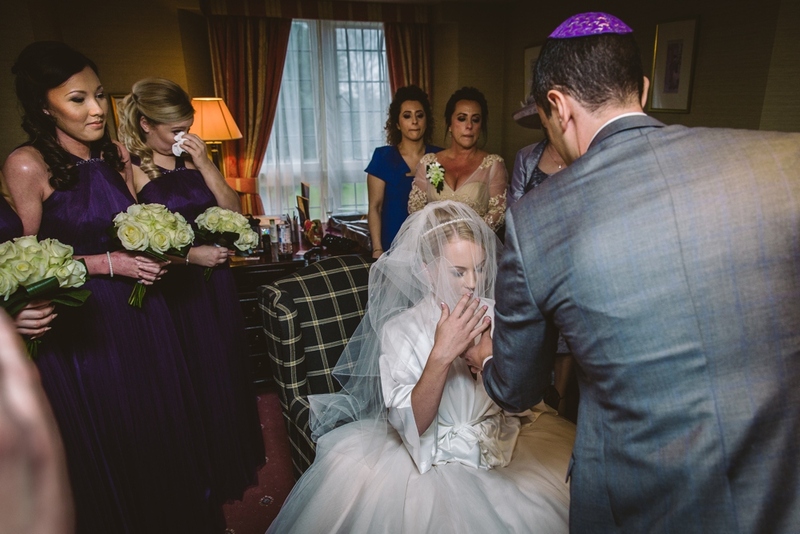 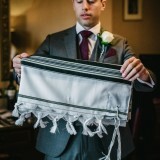 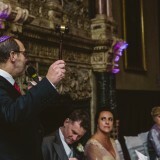 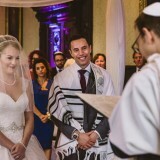 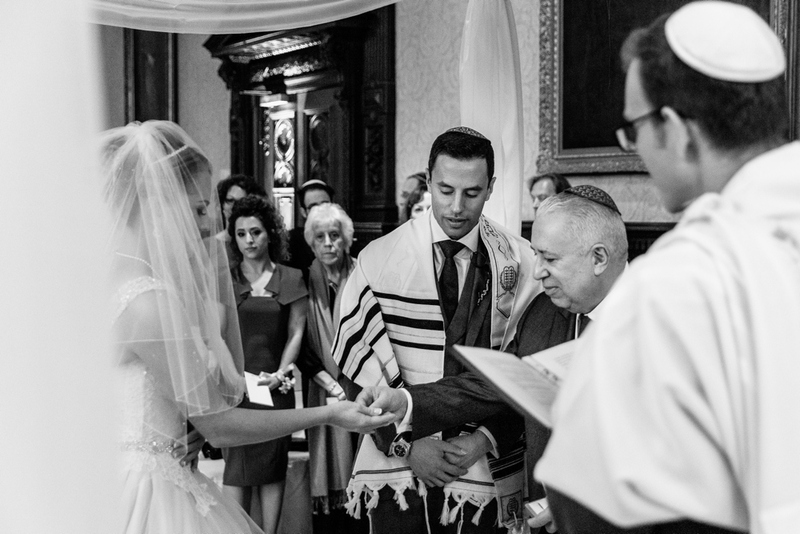 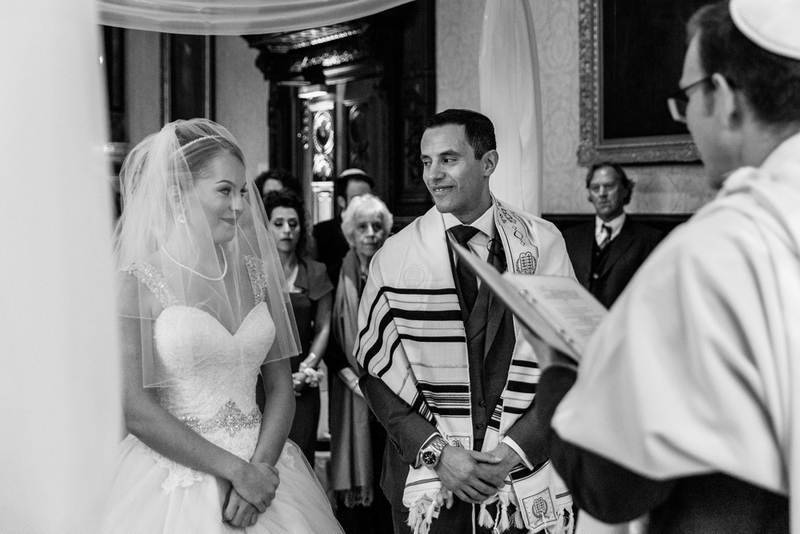 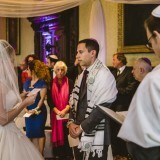 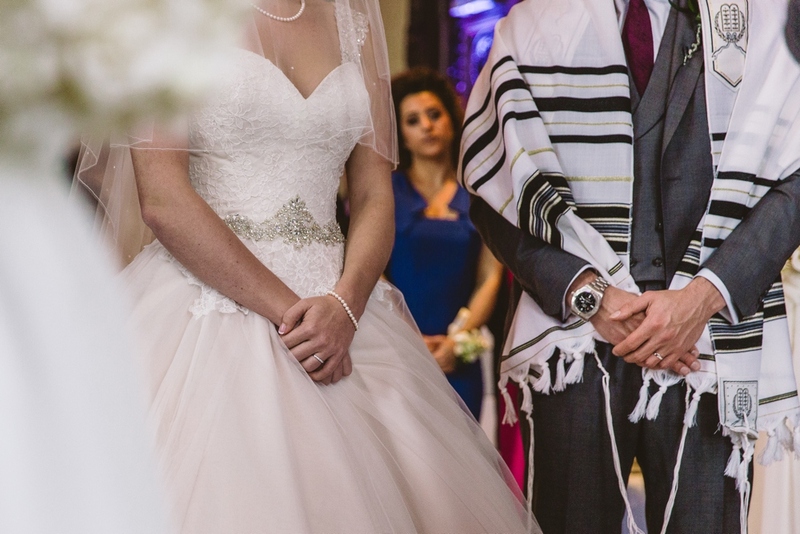 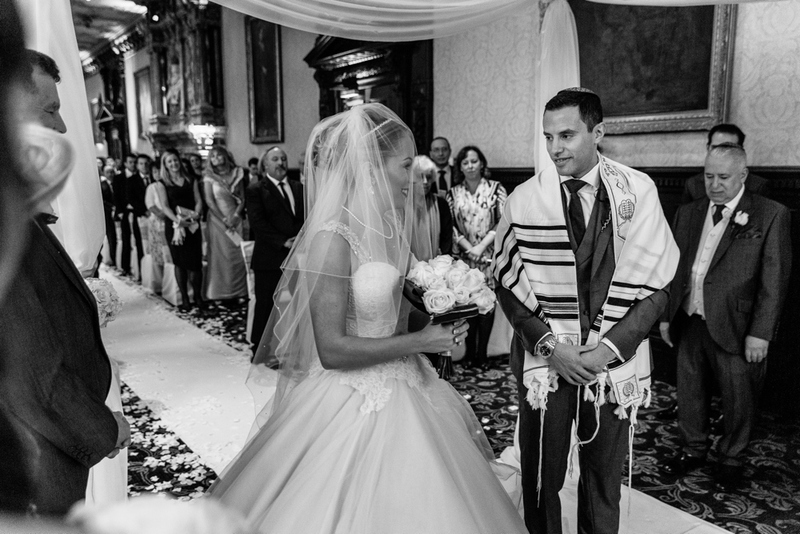 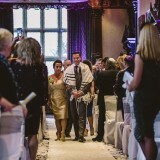 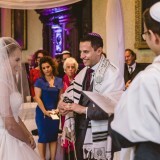 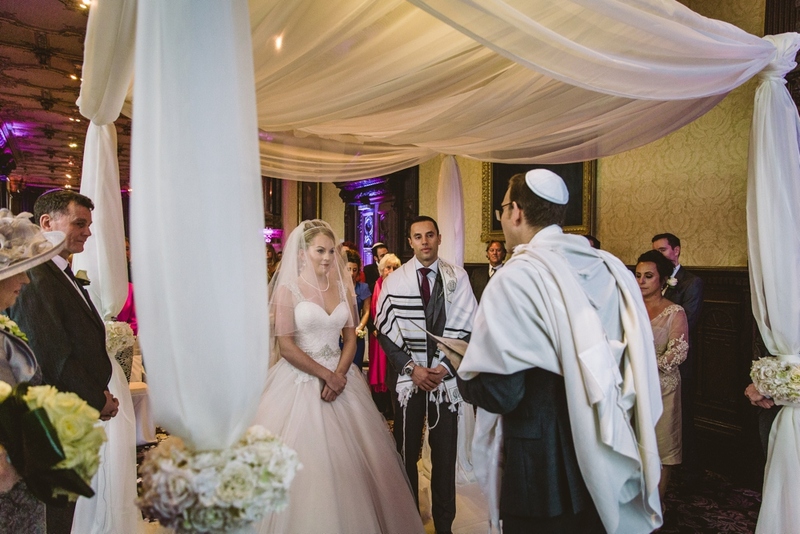 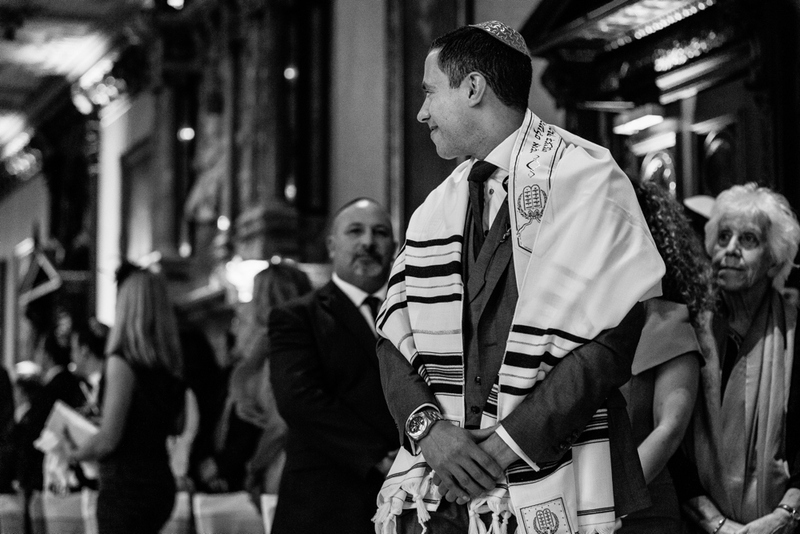 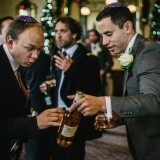 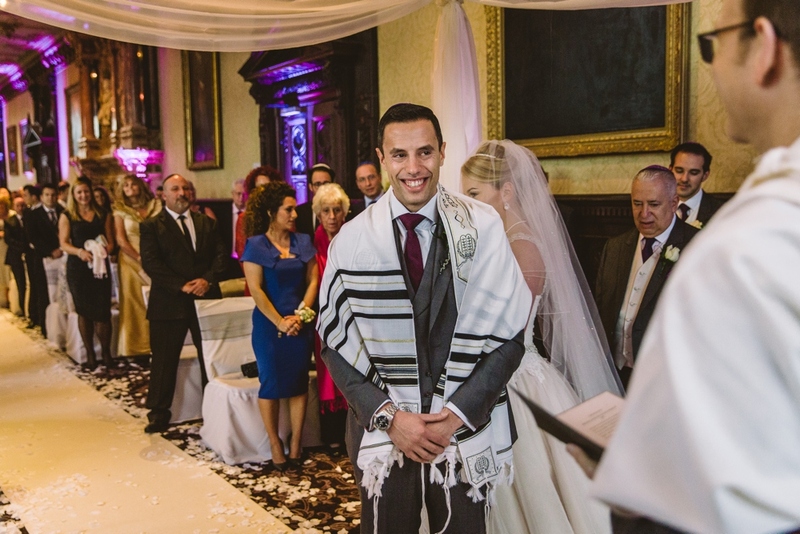 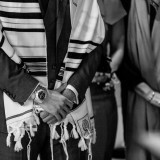 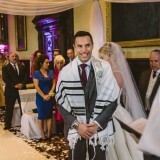 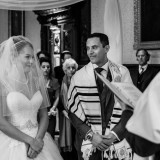 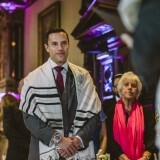 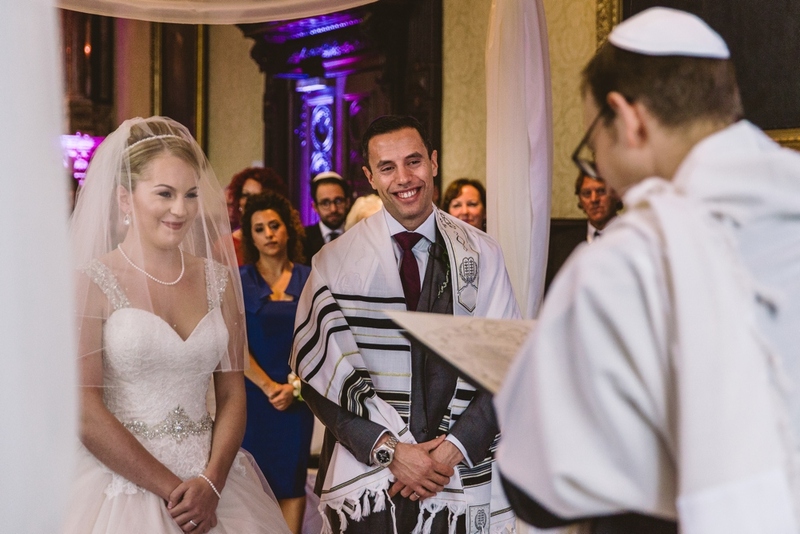 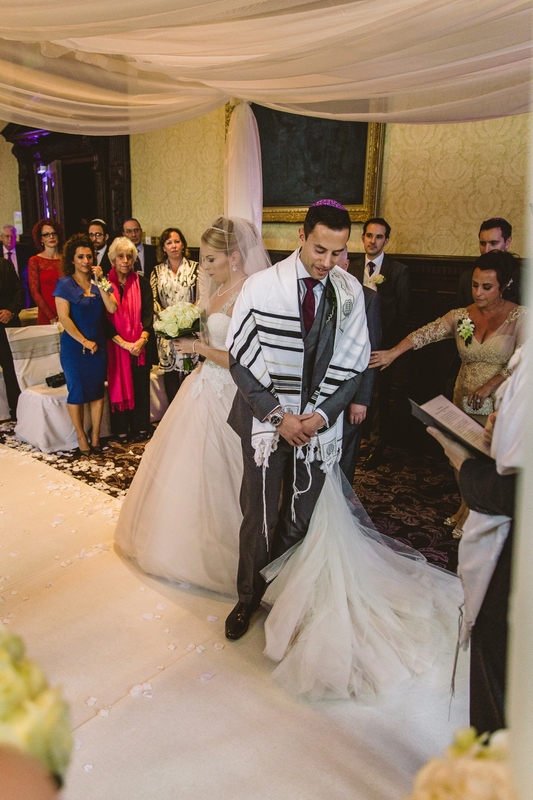 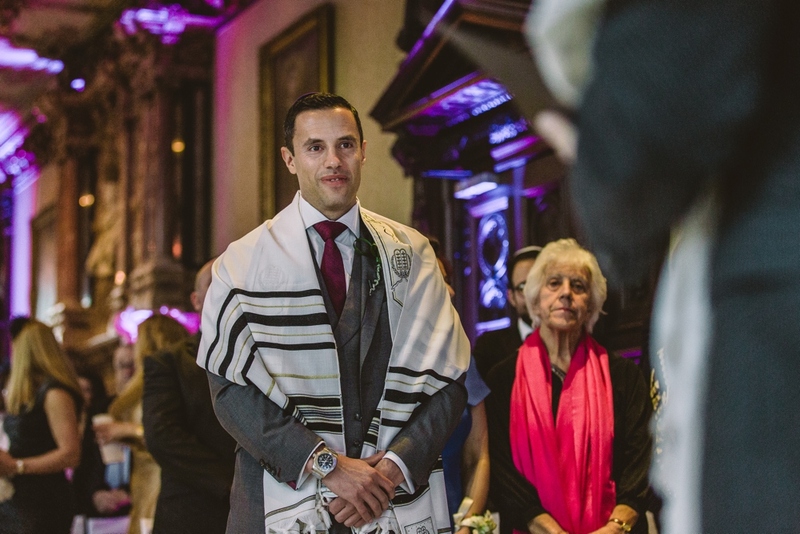 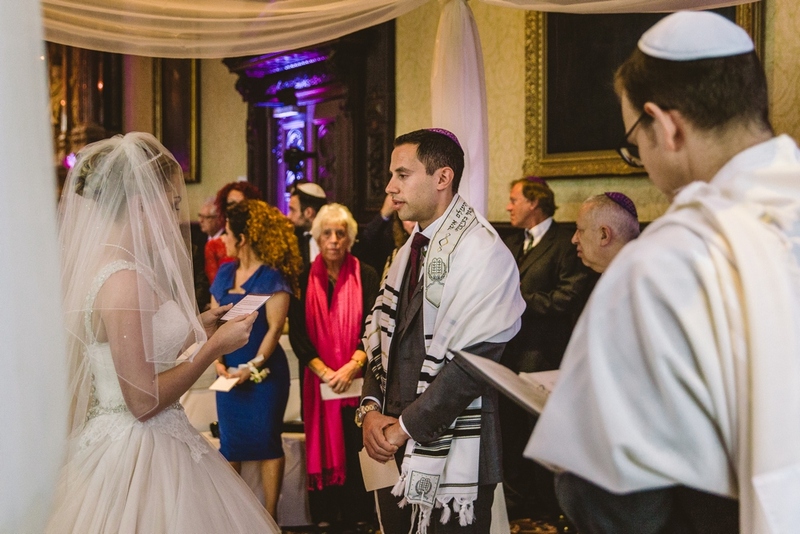 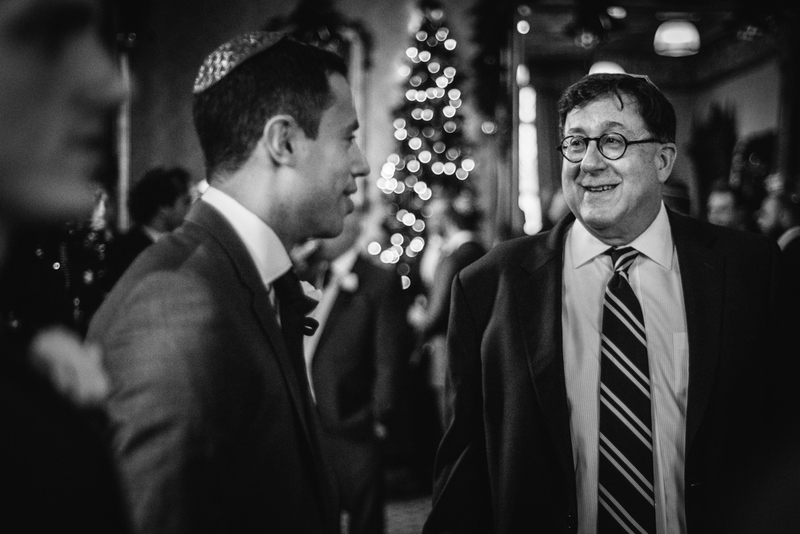 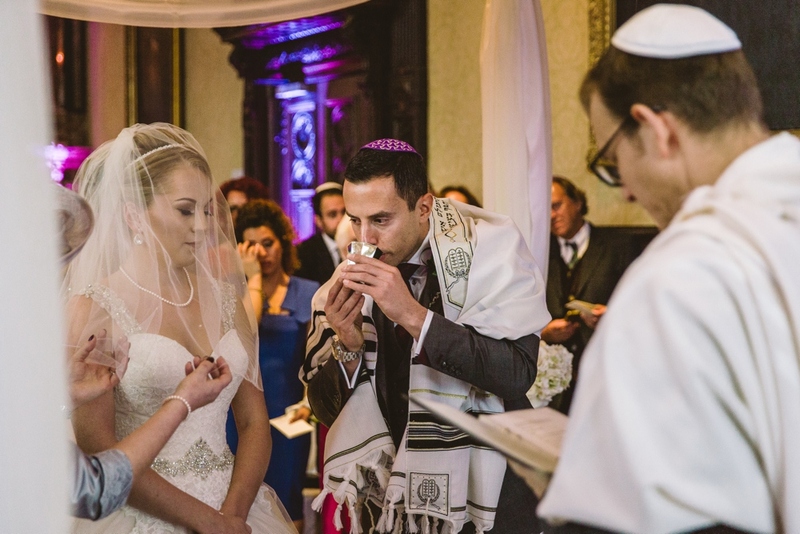 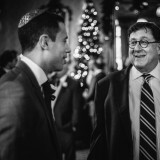 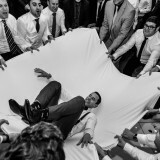 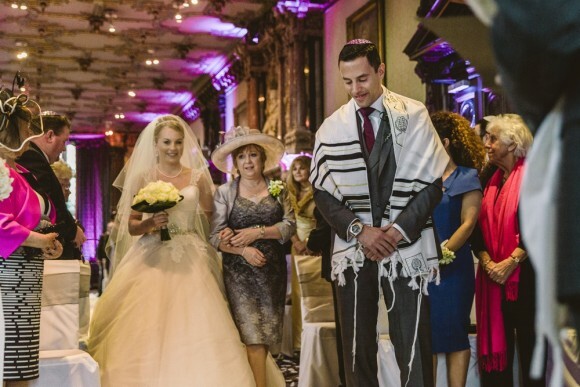 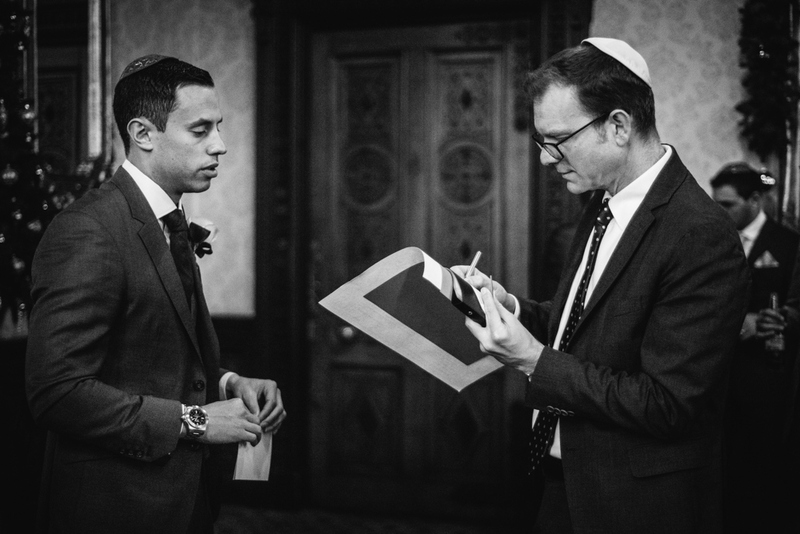 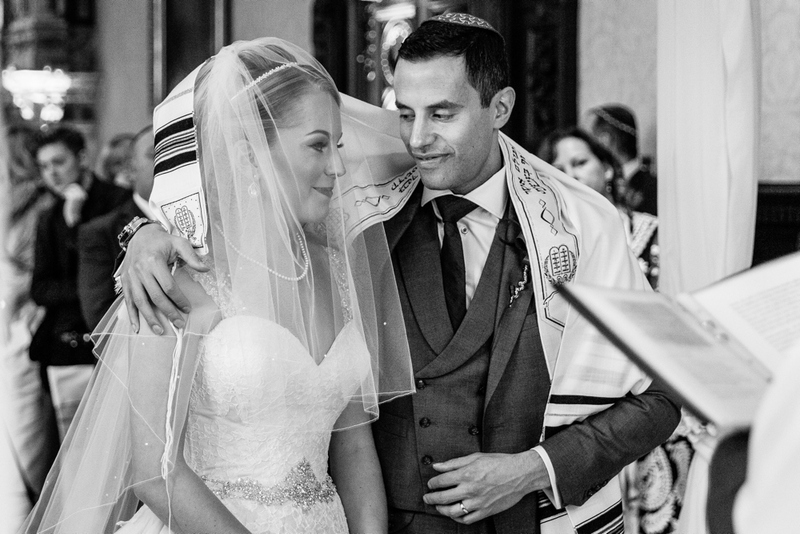 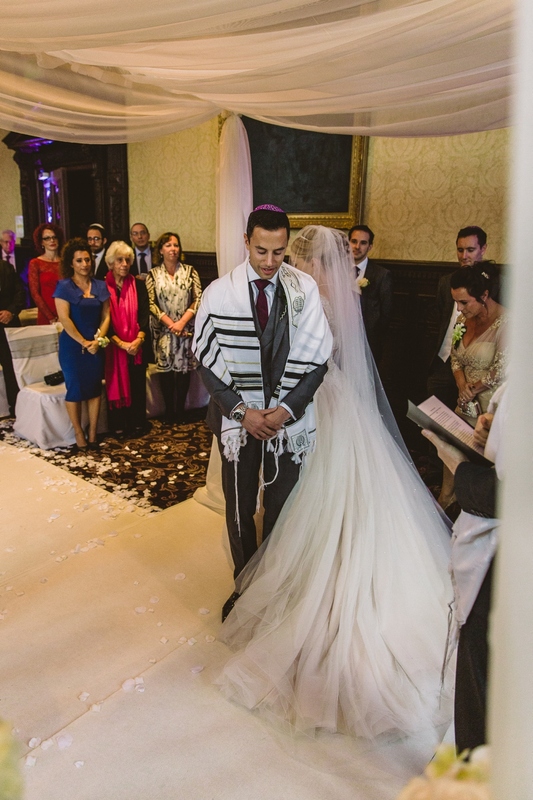 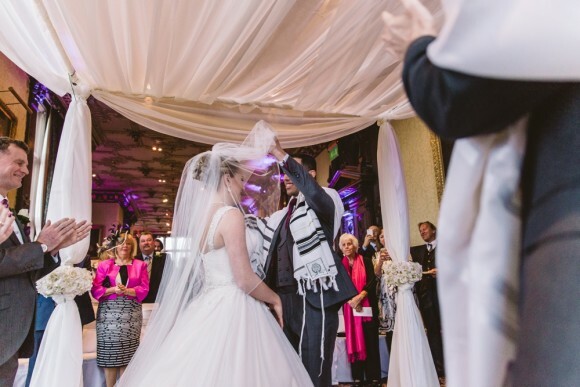 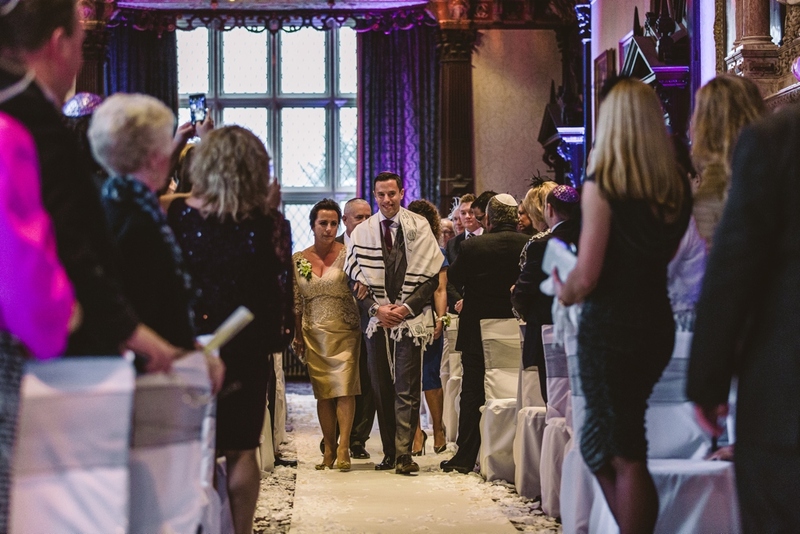 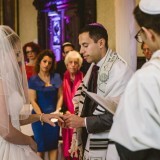 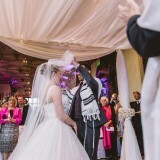 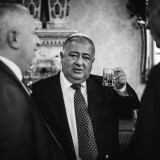 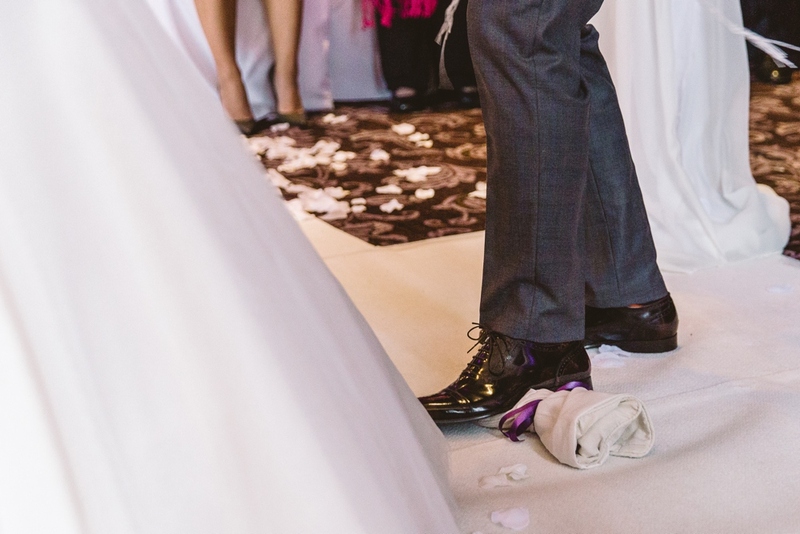 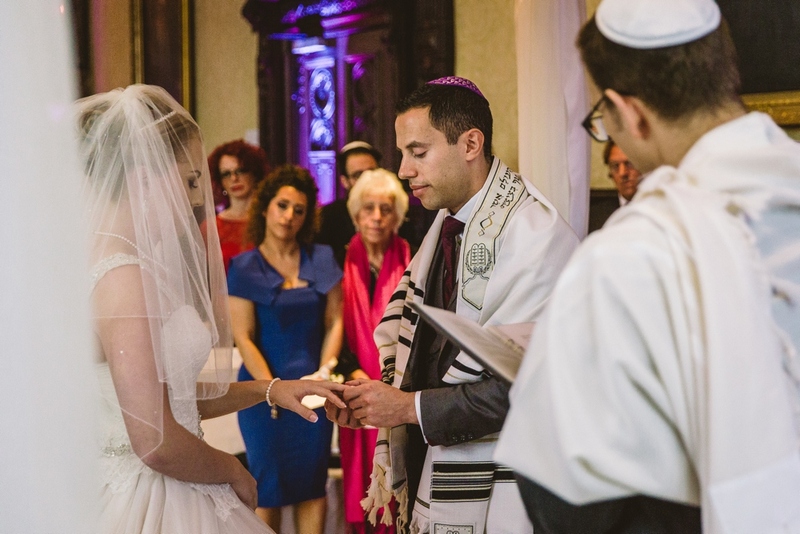 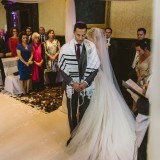 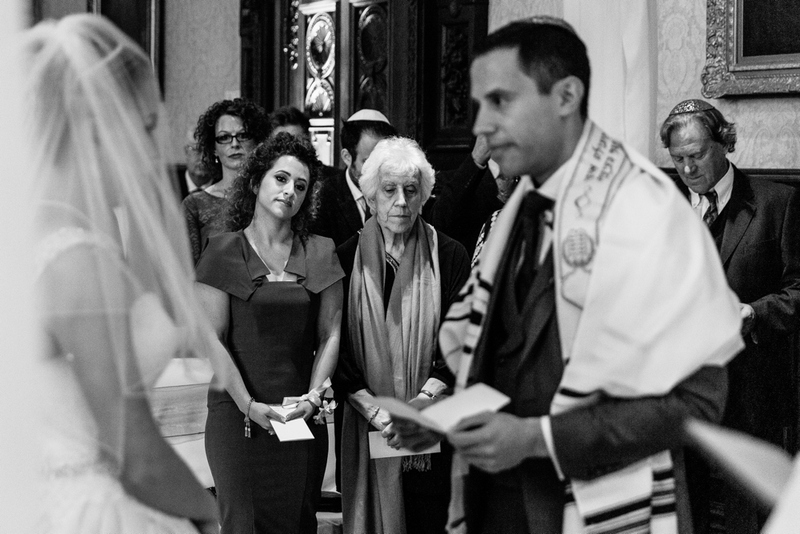 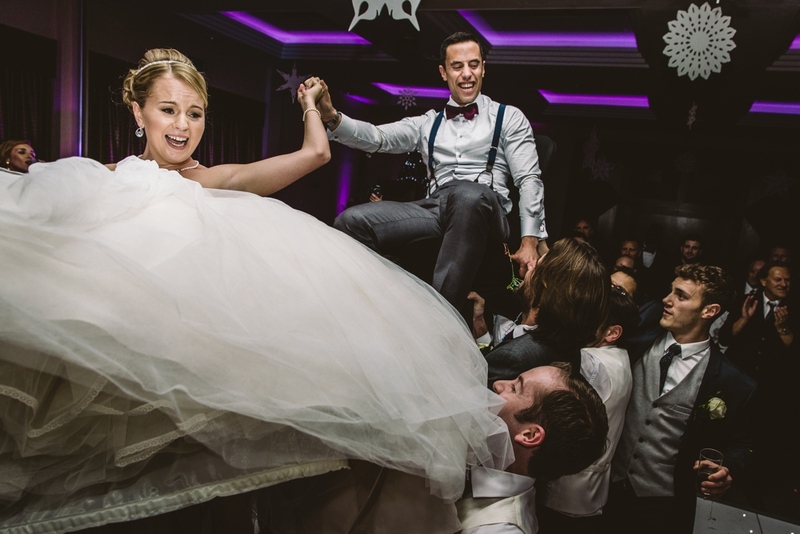 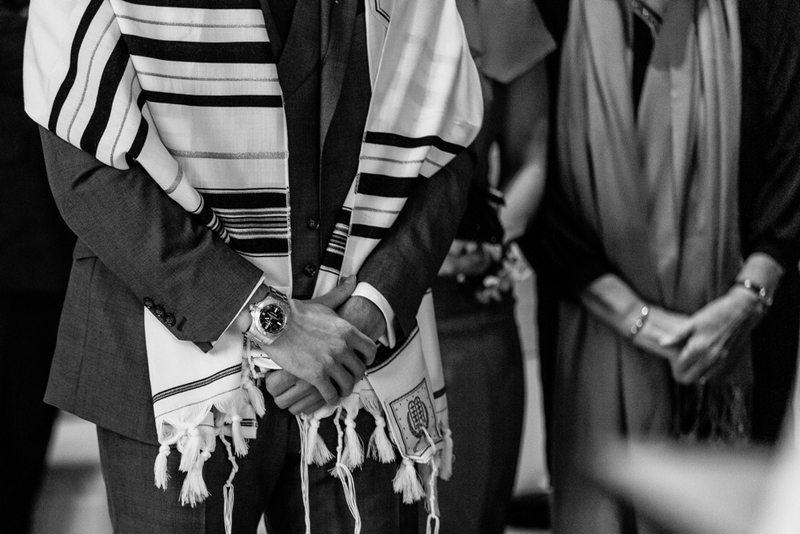 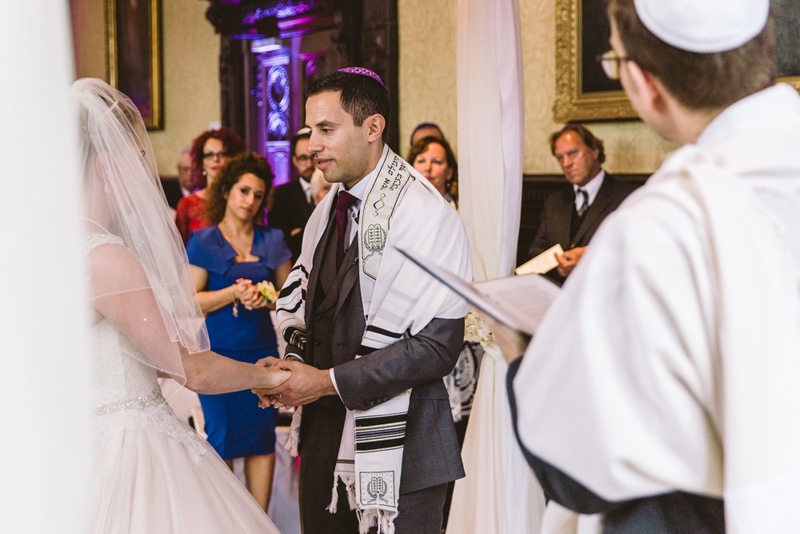 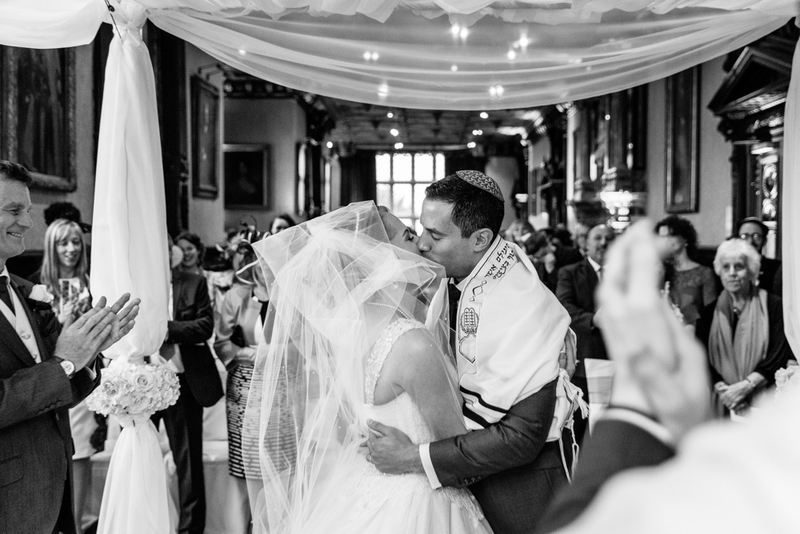 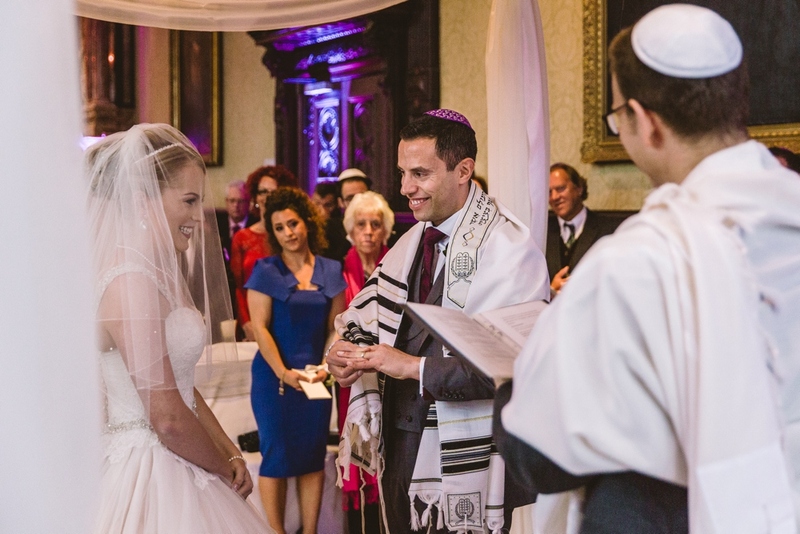 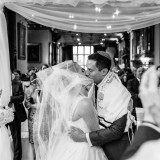 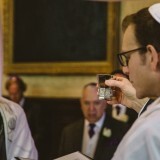 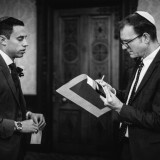 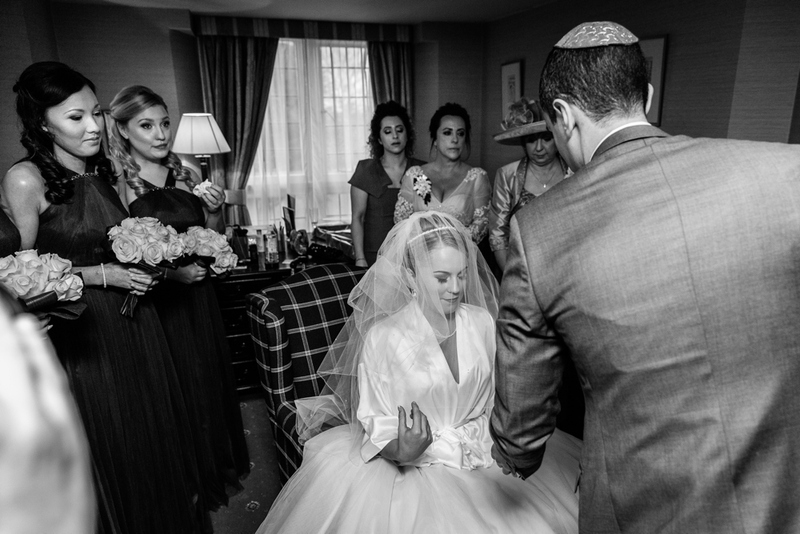 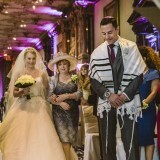 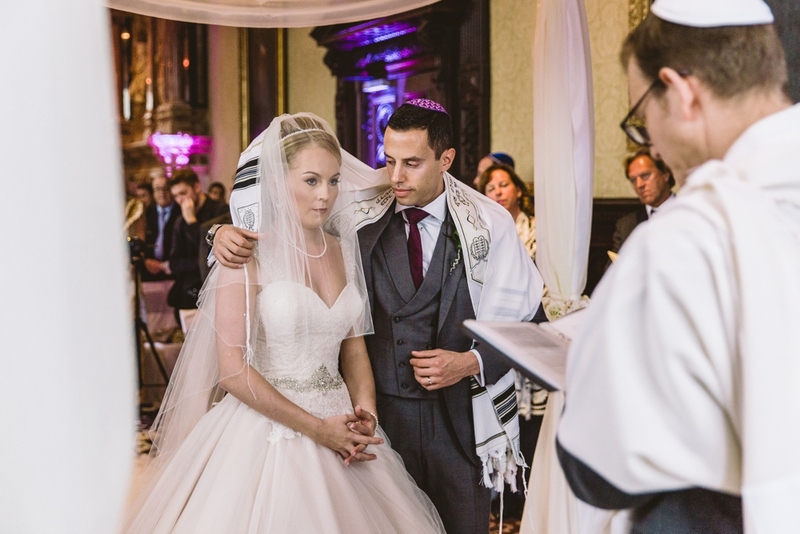 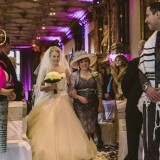 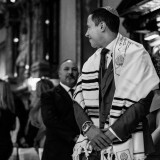 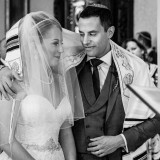 We had a reform Jewish wedding. 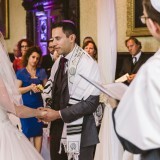 This meant that we had tisch and bedeken ceremonies before the wedding ceremony. 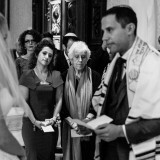 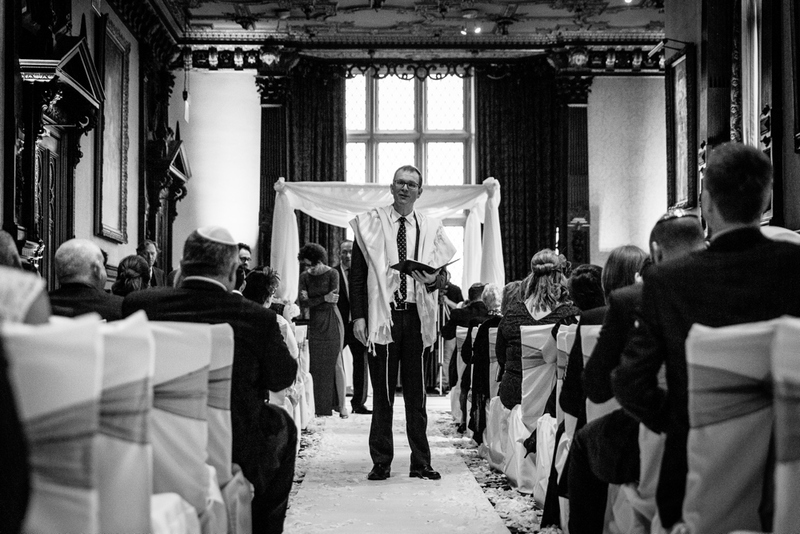 Our wedding ceremony was officiated by a Rabbi and took place under a Chuppah. 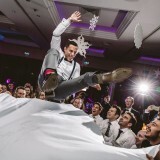 We also took part in some traditional Israeli dancing in the evening. 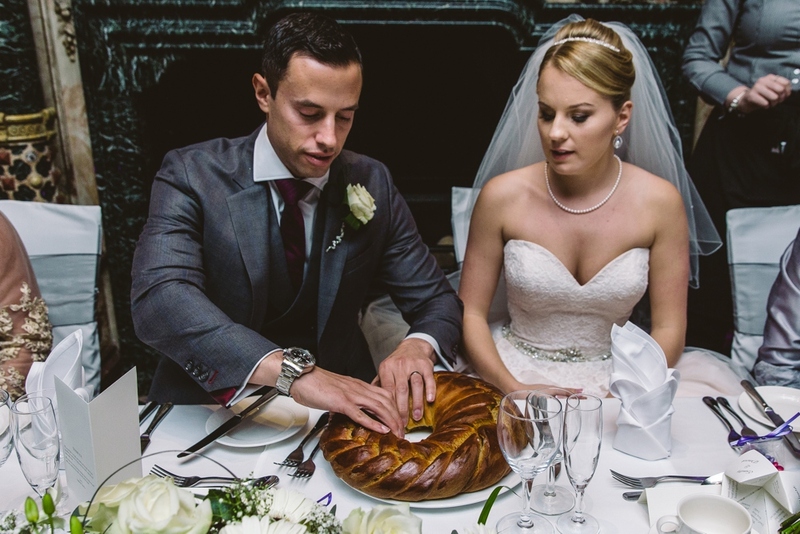 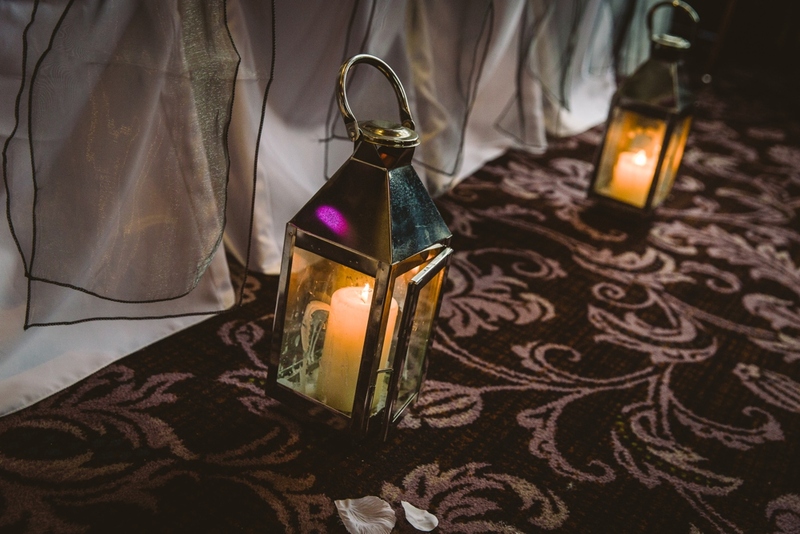 We didn’t have a theme as such but we knew that we wanted the ceremony and breakfast to have a very traditional feel and then the evening do to have more of a party atmosphere. 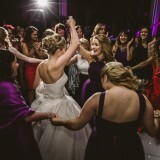 We chose this because we felt that it matched our personalities and was reflective of the venue. 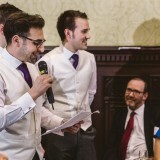 We were also conscious that weddings can become a little repetitive and we wanted to do something that we hadn’t seen done before. 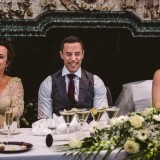 We felt that by moving our guests after the breakfast to a fully dressed second room, rather than waiting for our breakfast room to be redressed, meant that we kept everyone guessing and achieved this. 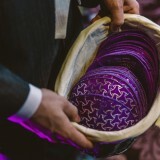 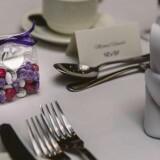 Aubergine was the main colour incorporated into the wedding, but we also had some ivory and silver grey tones during the day. 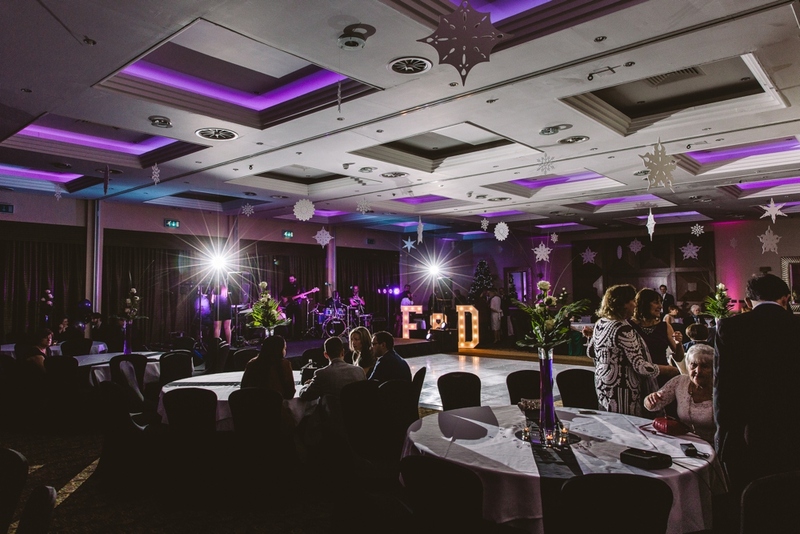 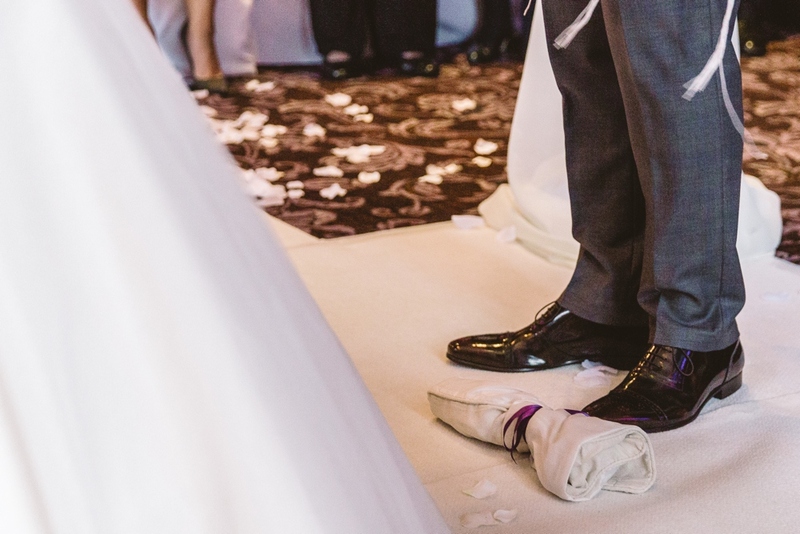 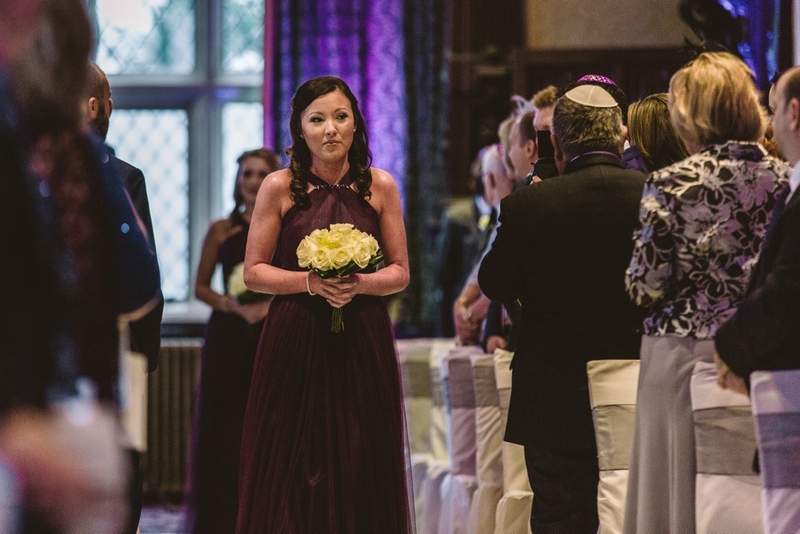 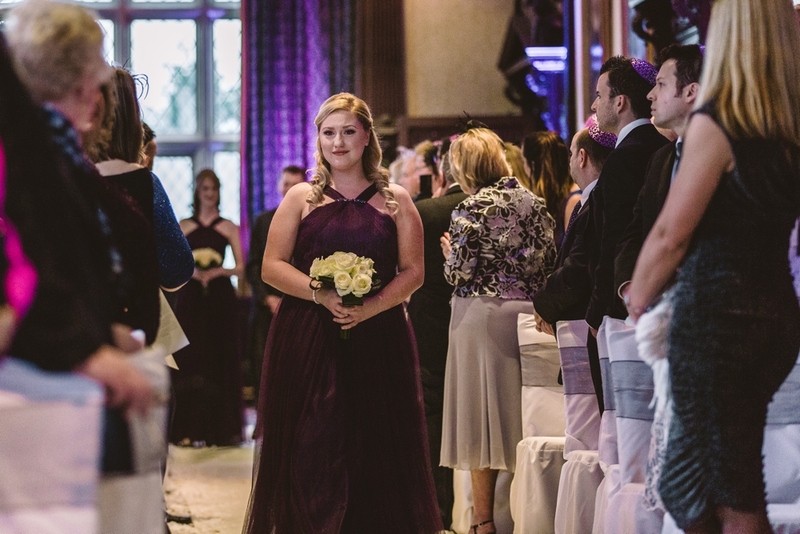 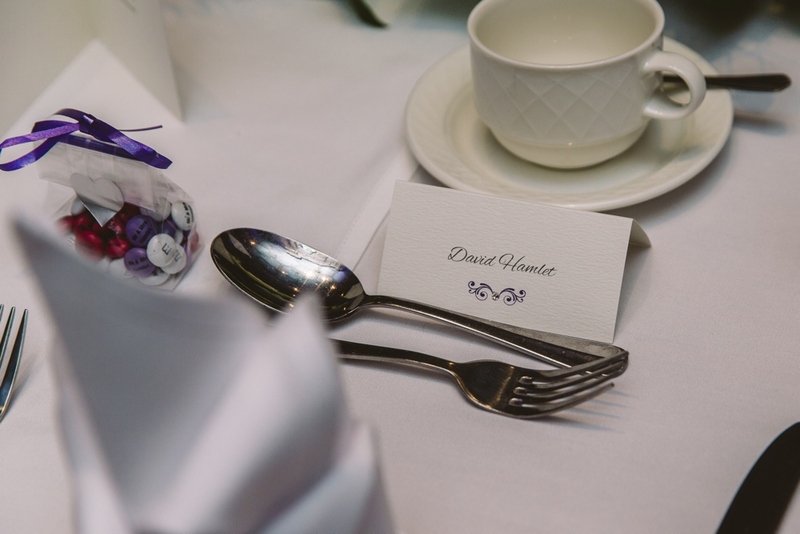 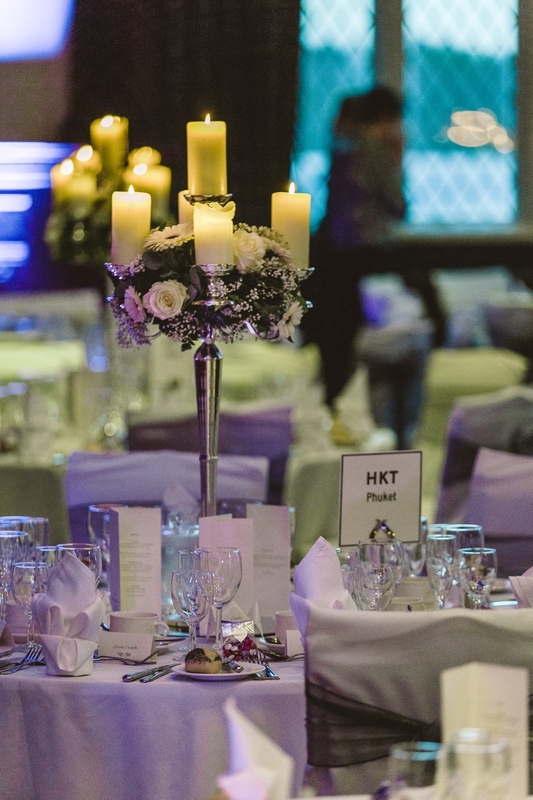 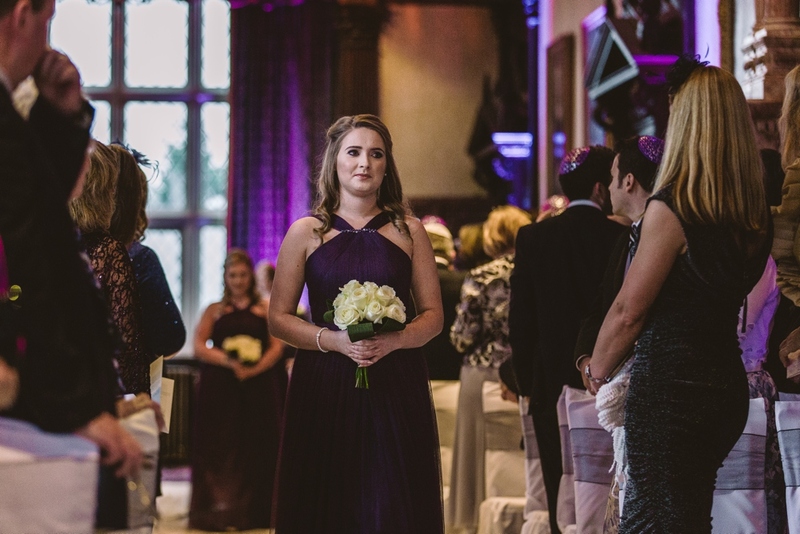 We chose the deep purple colour as we felt that it fit a winter wedding well but we didn’t want it to be too harsh and dramatic, which is why we introduced the ivory and silver grey. 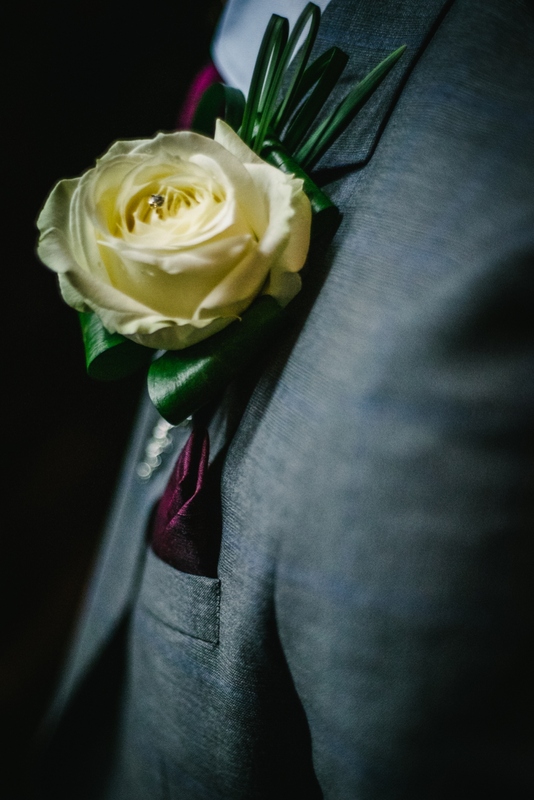 In the evening, we still had the aubergine tones but we went with more of a ‘black-tie’ feel so the colours were more black and white. 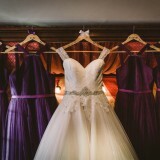 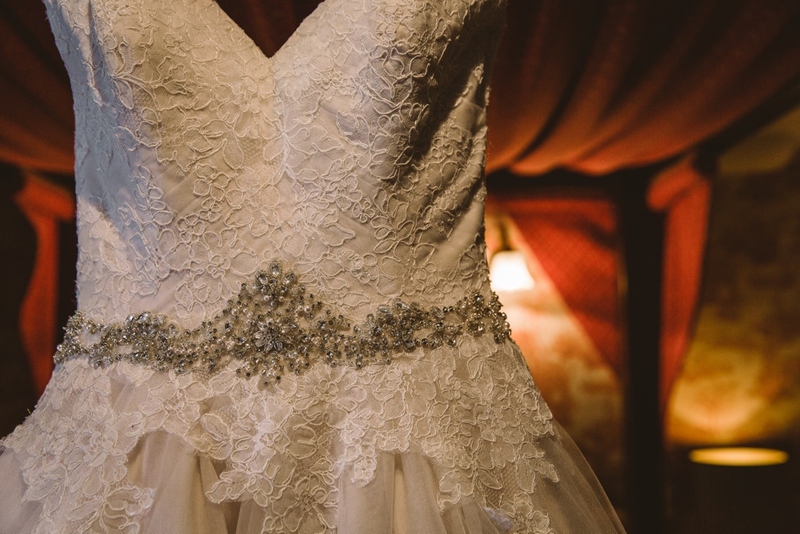 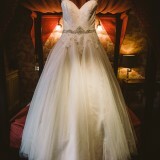 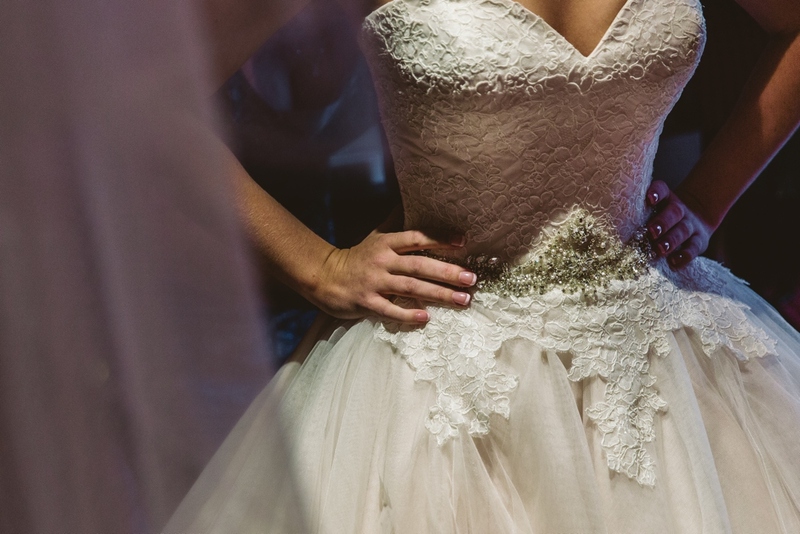 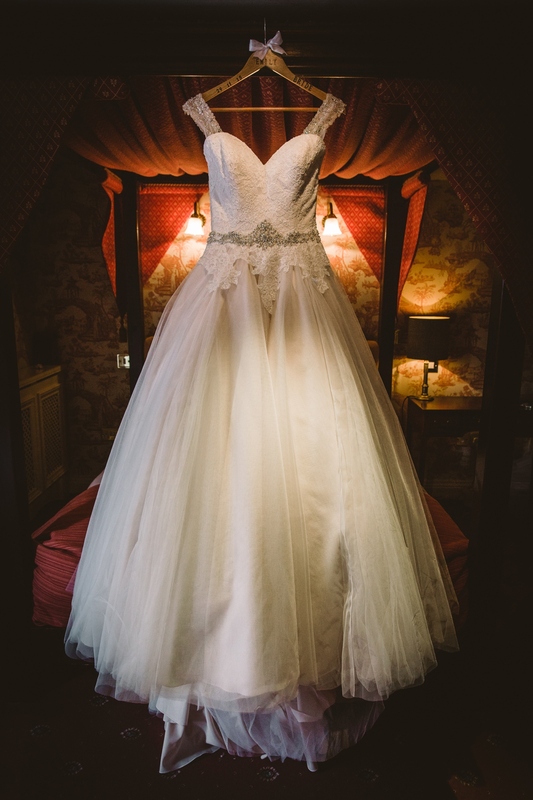 I chose a princess style ball gown by Madeline Gardner. 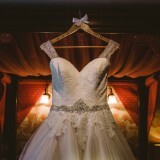 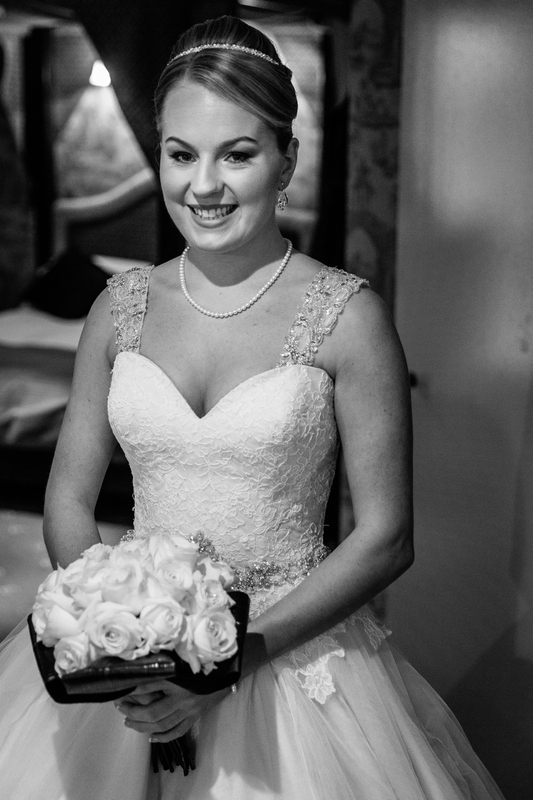 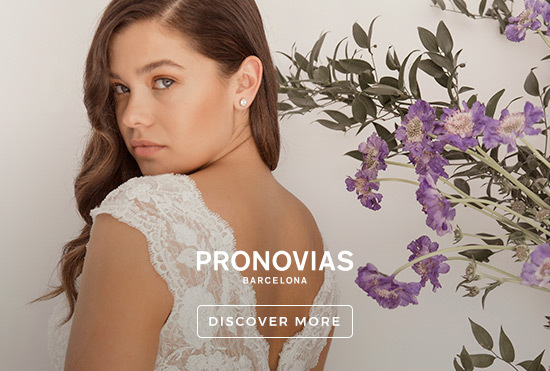 I chose the style as growing up I had always dreamt of a huge wedding dress and I felt that it suited my body shape well. 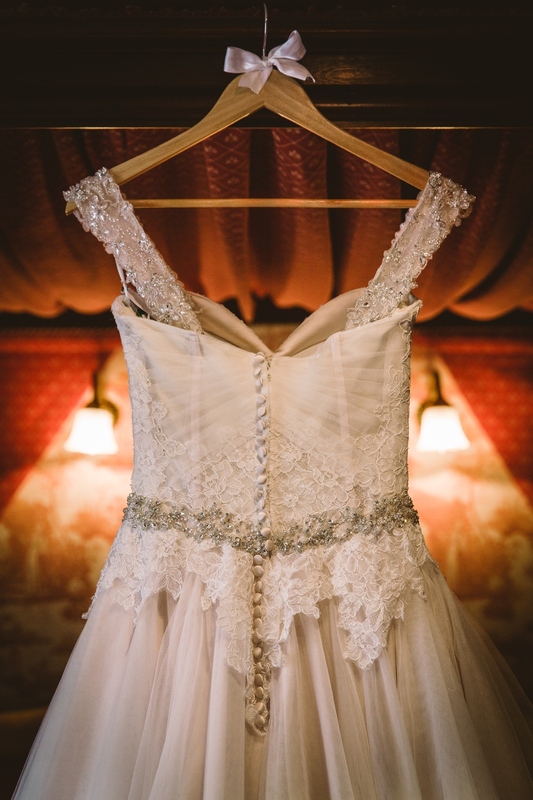 After trying on more than thirty wedding dresses, I bought the dress from a local shop called Wedding Belles. 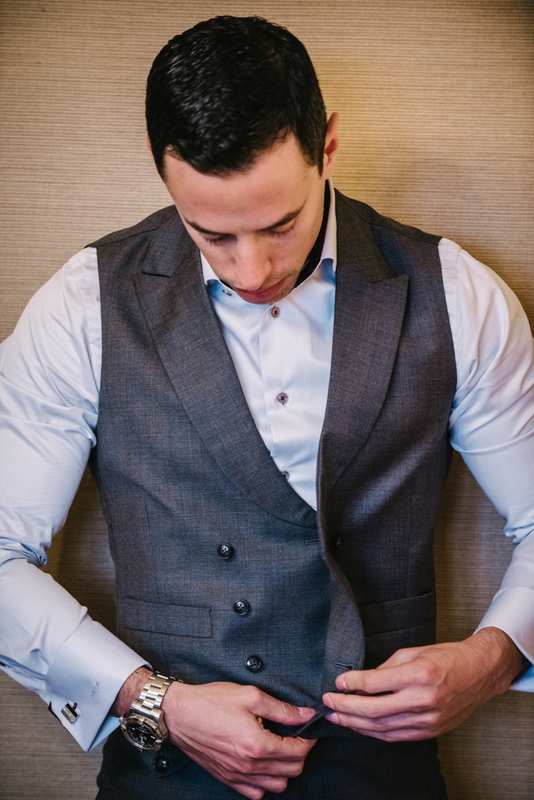 I felt like the experience was very personal and I was able to take my time in making my decision. 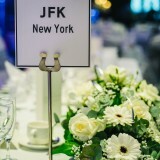 The fact that my dress came from New York, which is where we got engaged, was the icing on the cake! 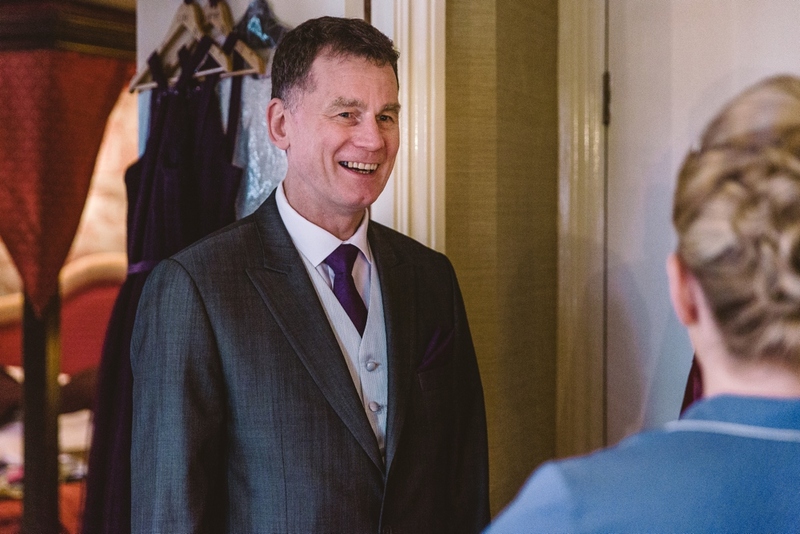 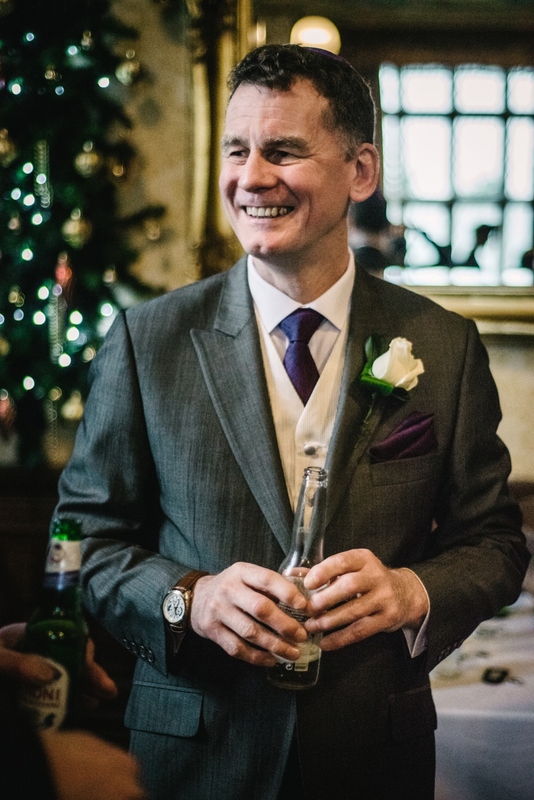 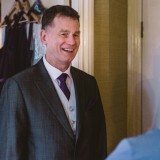 David had his suit made by Richard Smith, a well-known Manchester tailor. 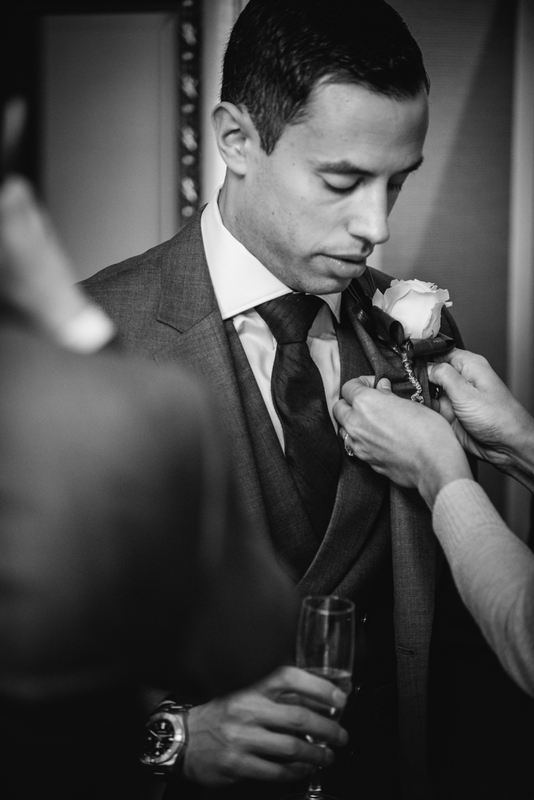 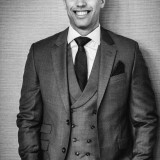 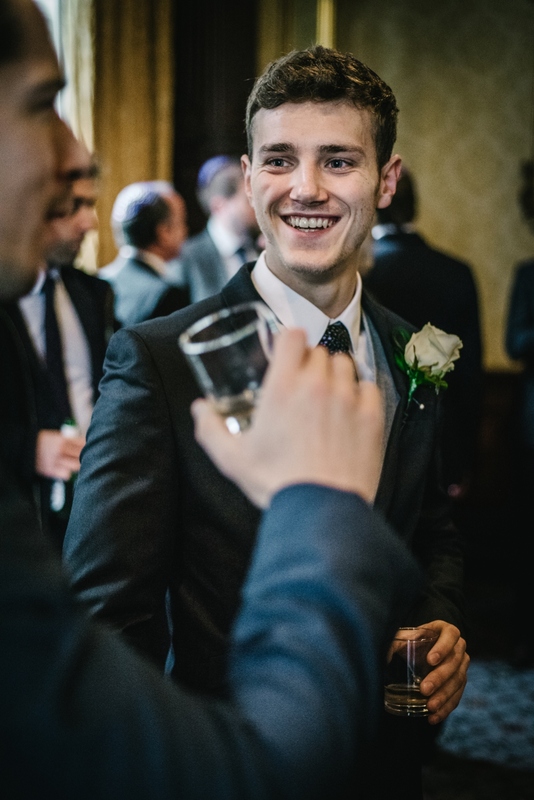 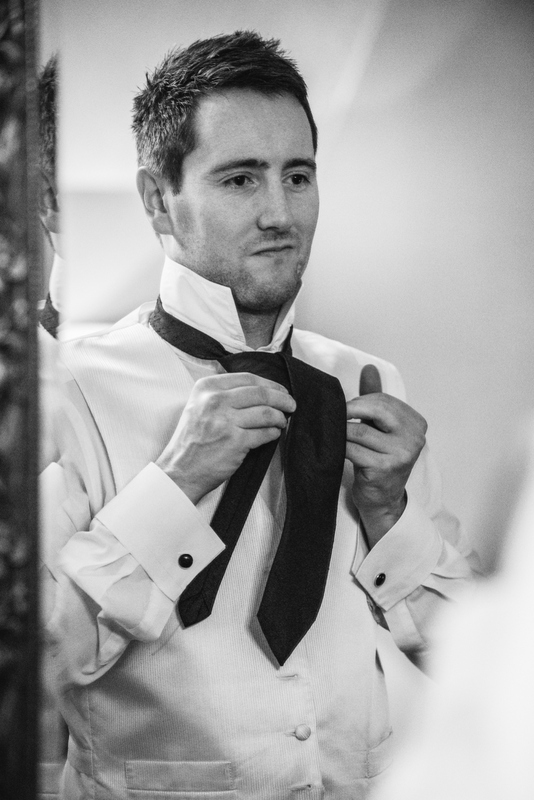 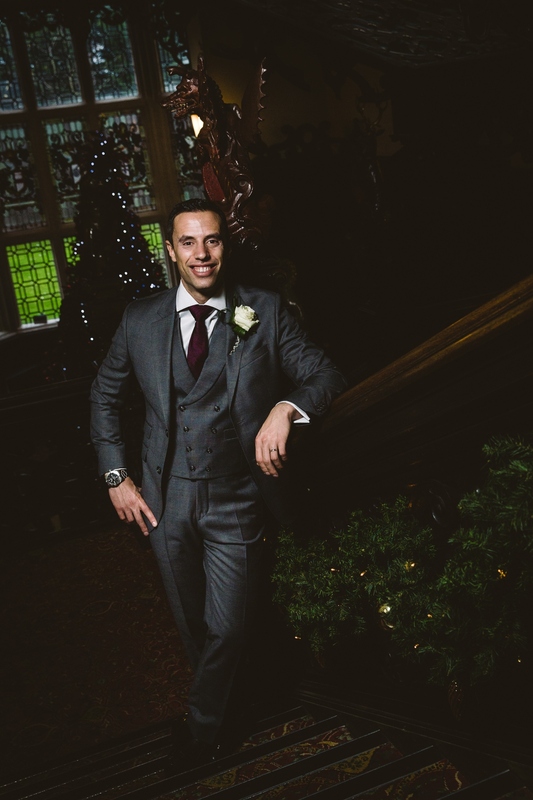 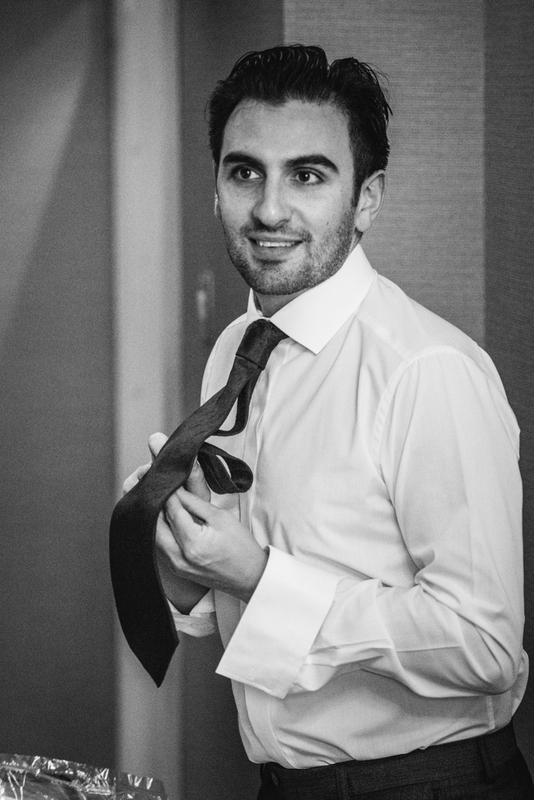 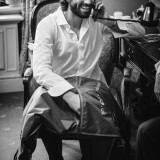 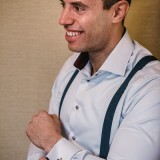 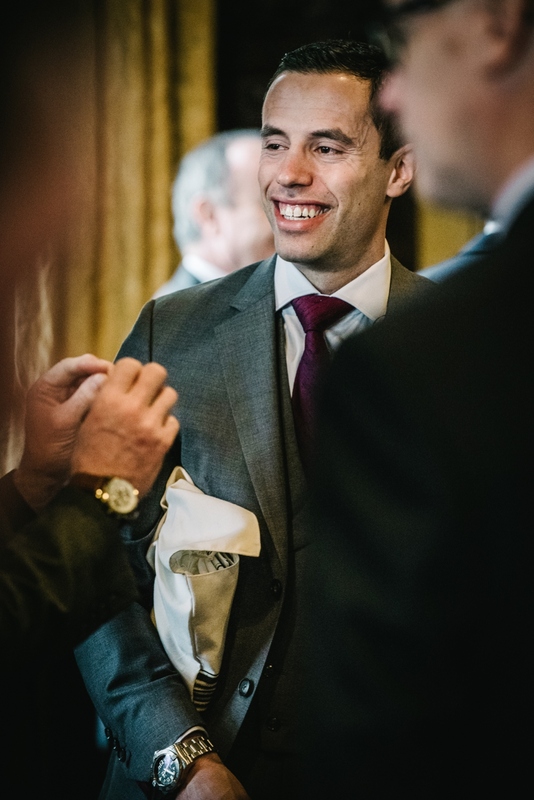 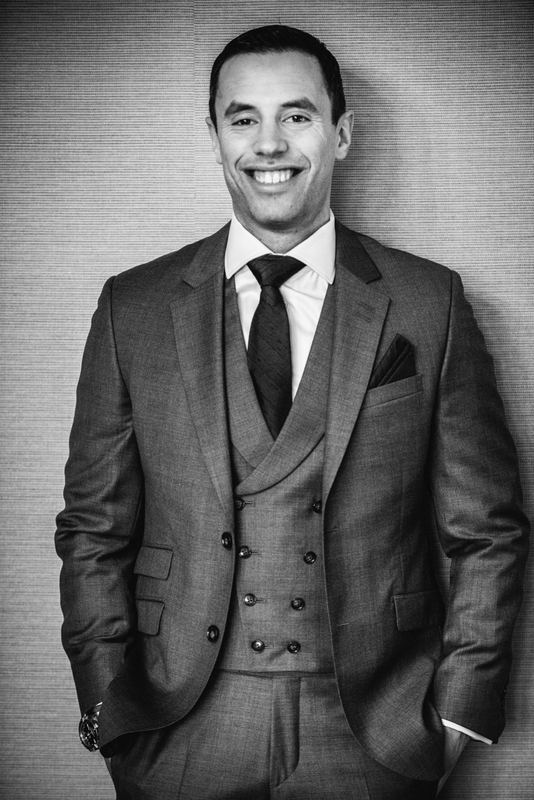 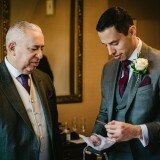 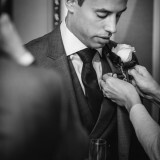 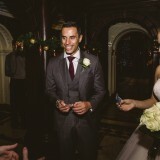 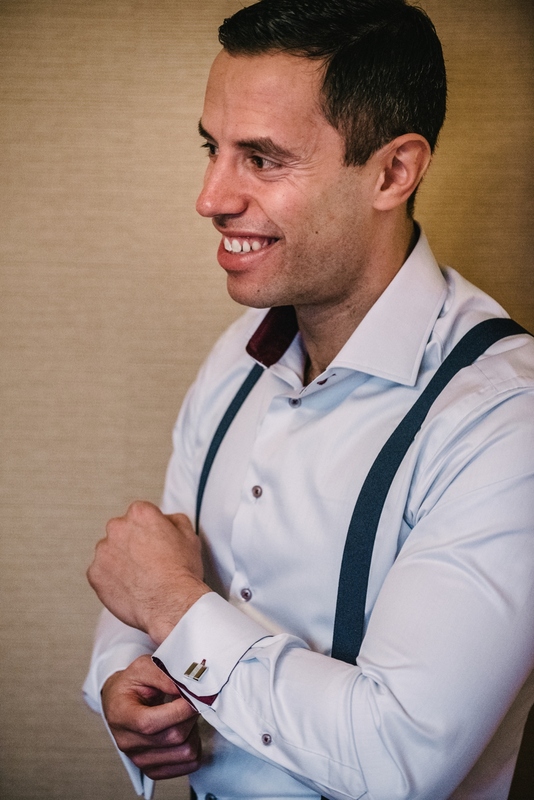 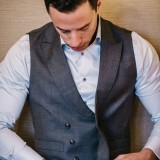 He loved being able to design and personalise his suit and thoroughly enjoyed being part of the whole process. 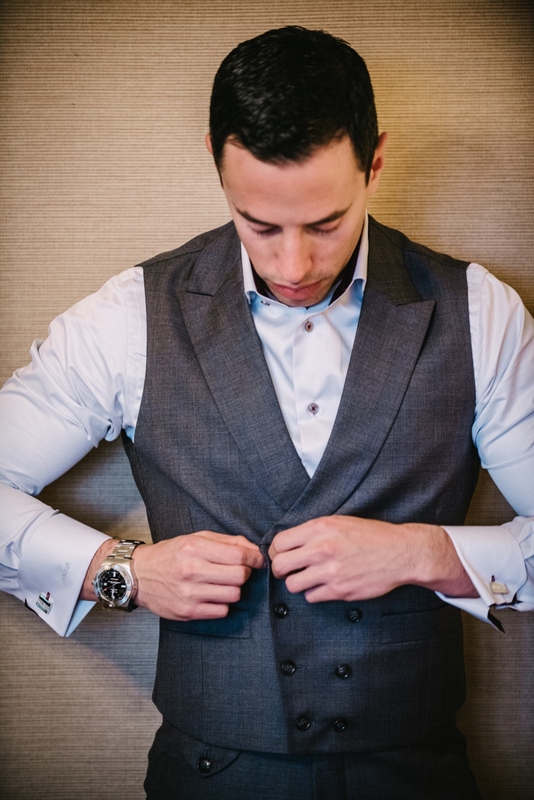 He designed a three-piece suit with a tie and waistcoat for the day and braces and a bow tie for his evening look. 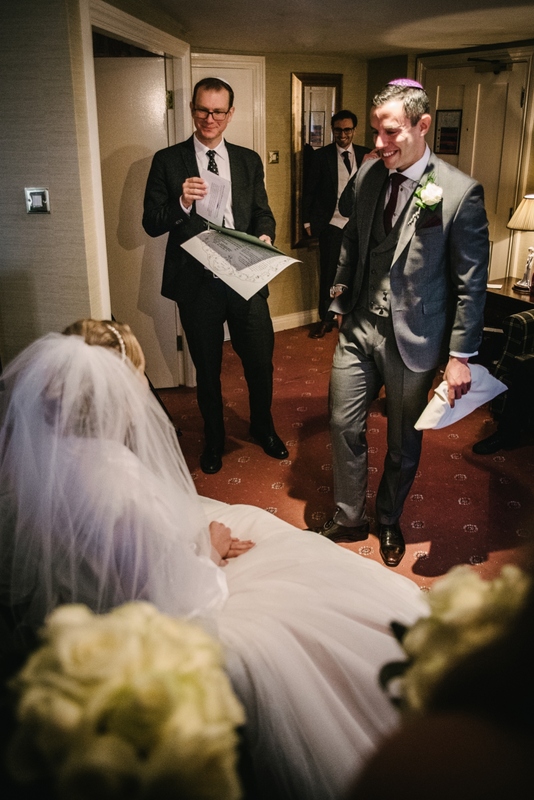 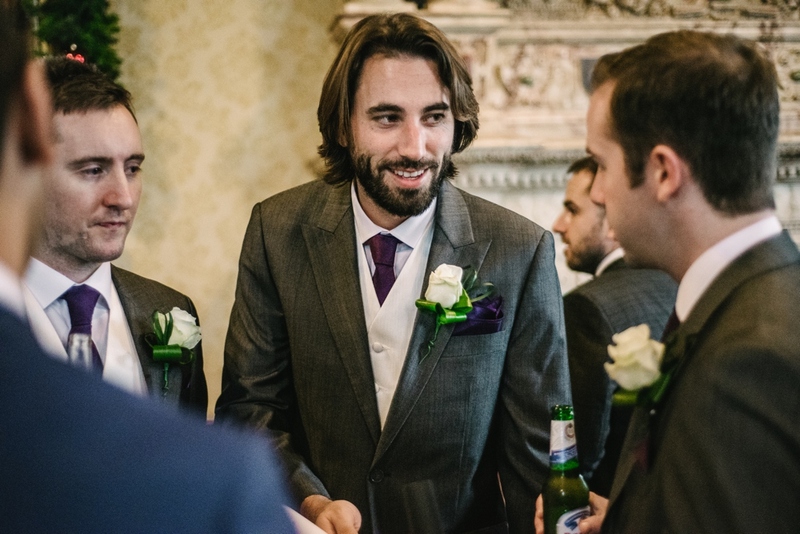 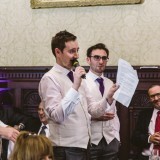 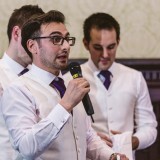 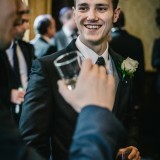 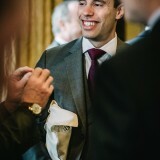 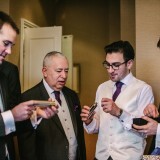 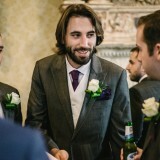 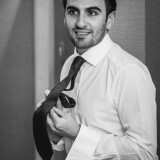 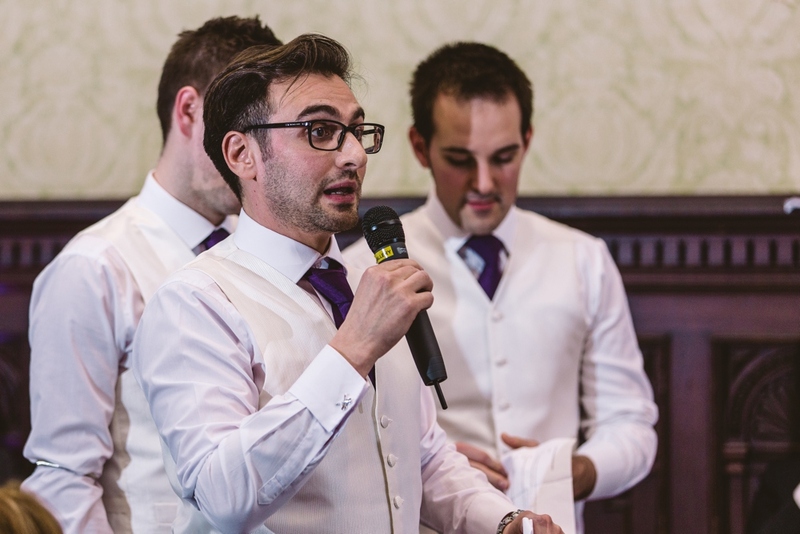 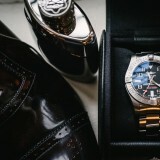 The groomsmen wore graphite coloured suits with Aubergine ties, which were hired from Youngs at Debenhams. 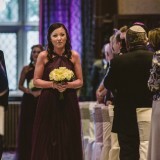 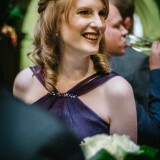 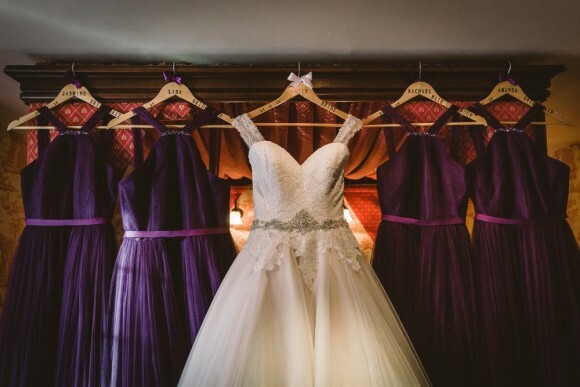 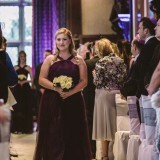 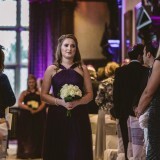 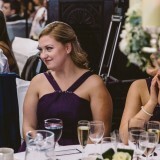 My bridesmaids wore aubergine coloured floor-length chiffon dresses from the designer Kelsey Rose. 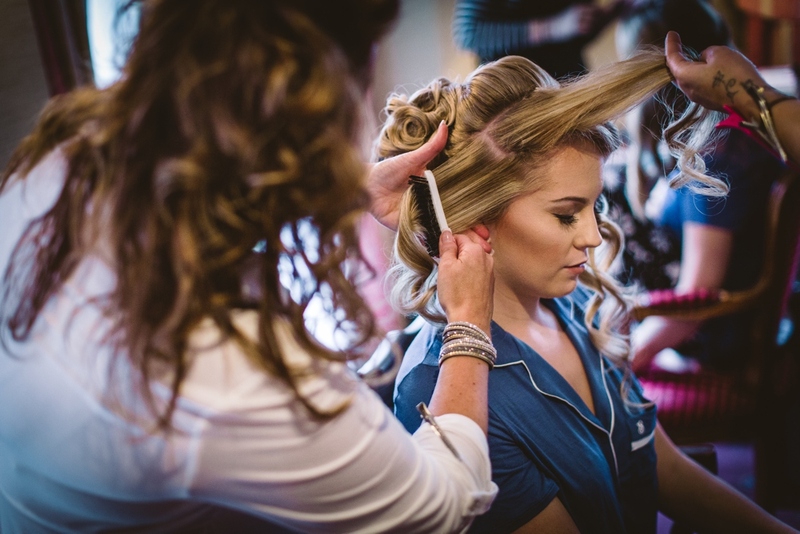 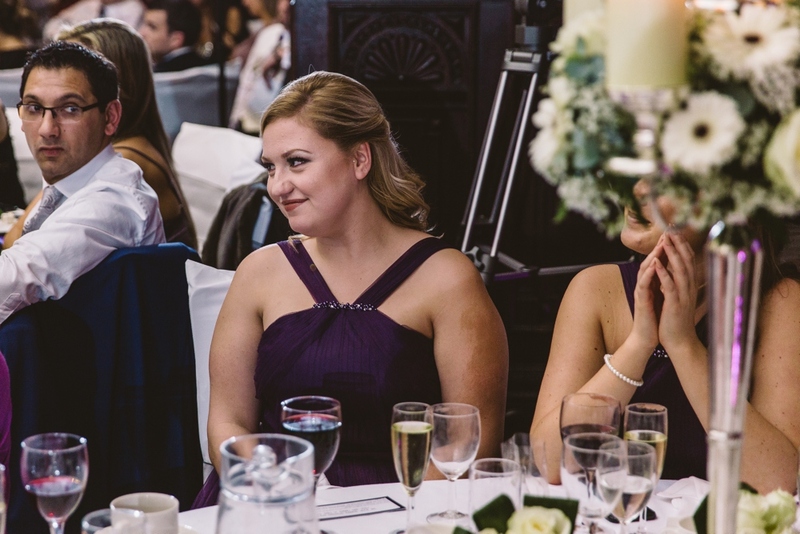 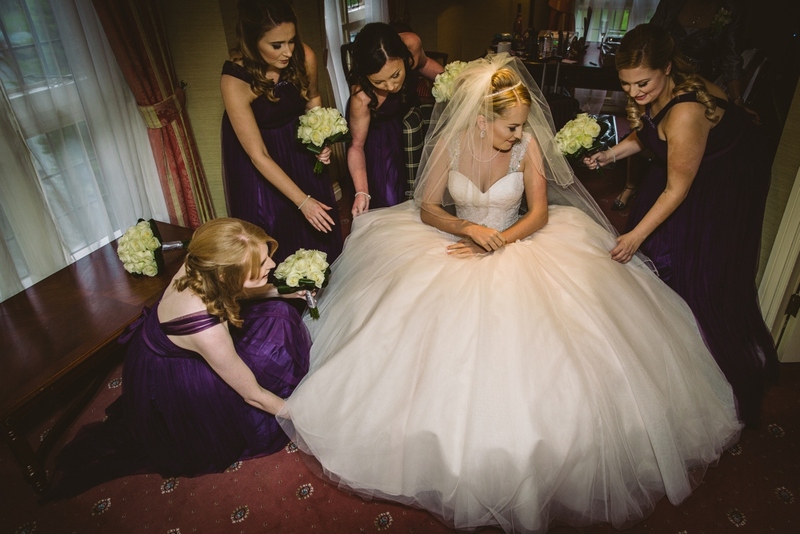 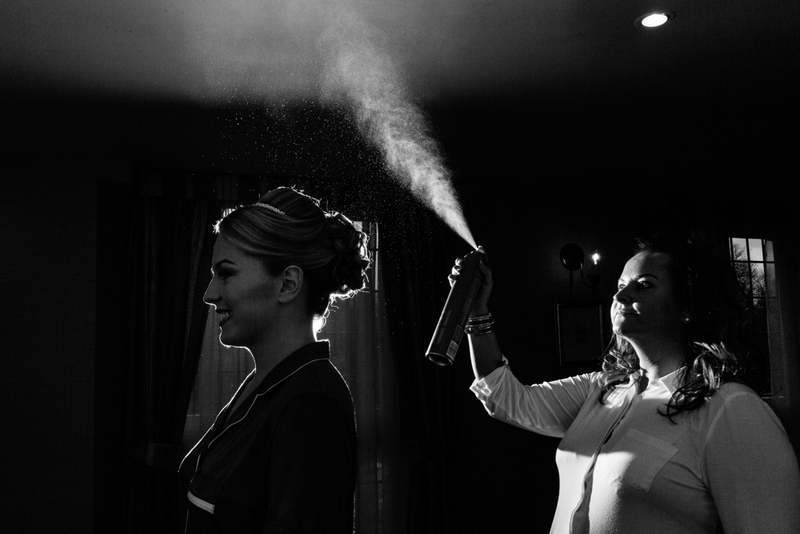 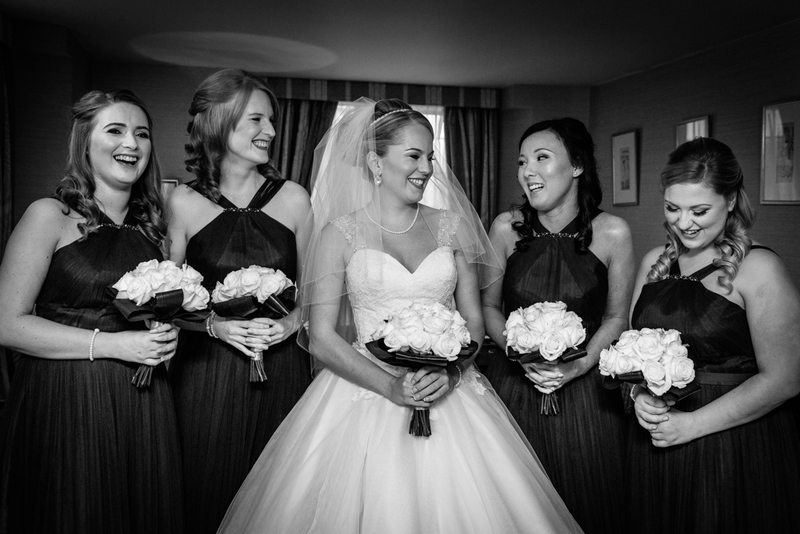 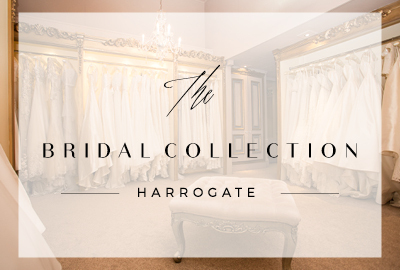 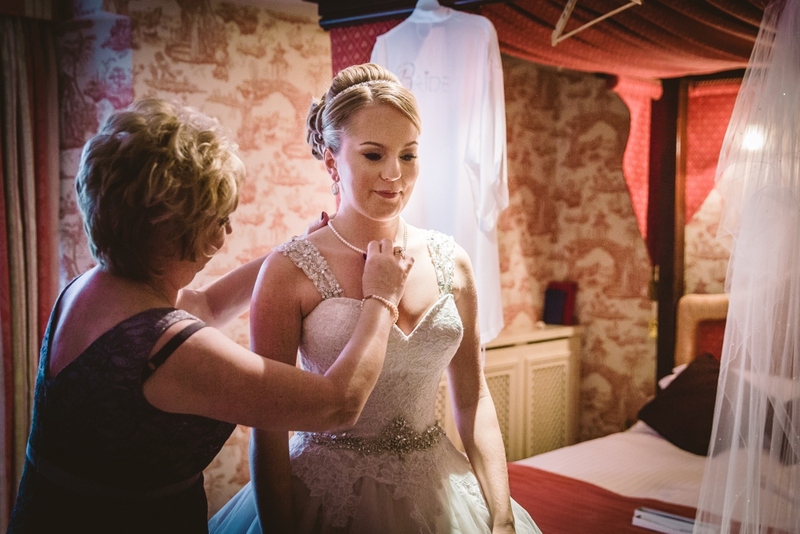 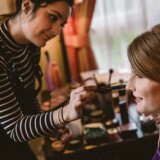 I booked Nicola and Paisley from Jane Alexandra Hairdressing to do my hair and also my bridesmaids and mum’s hair on the day of the wedding. 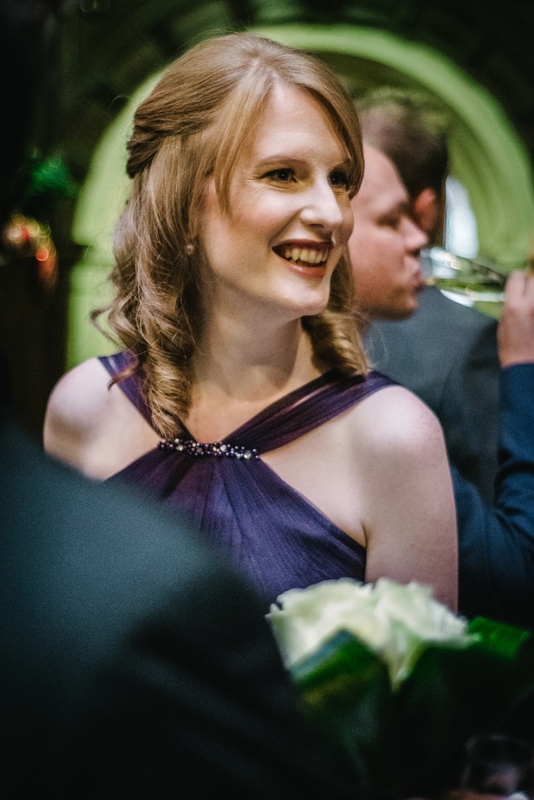 A number of guests commented on the beautiful hair dos and I even slept in mine and it still looked flawless the next day! 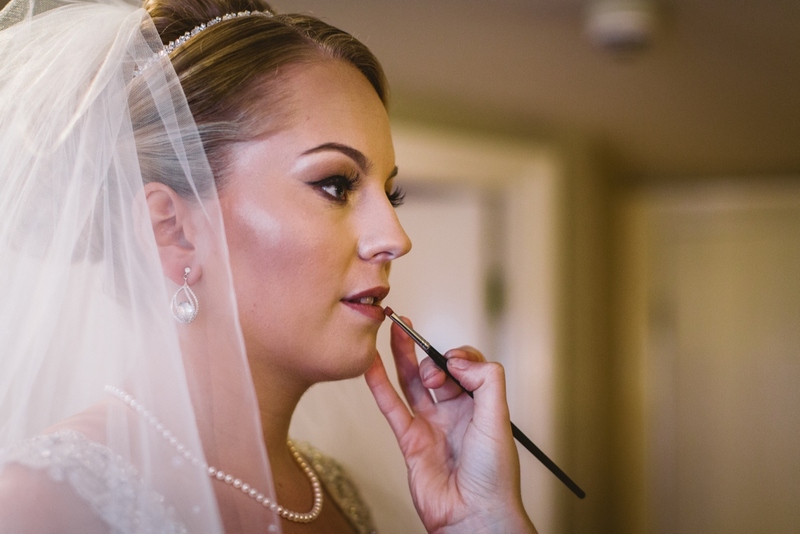 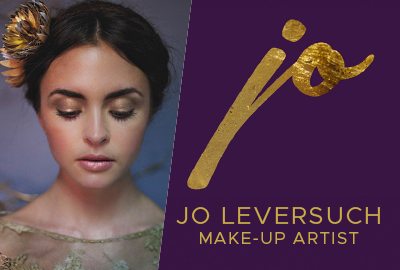 My makeup meanwhile was done by a makeup artist called Olivia Morewood and she really saved the day. 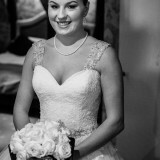 I booked her a month before the wedding when a lady who I had previously booked failed to attend our trial. 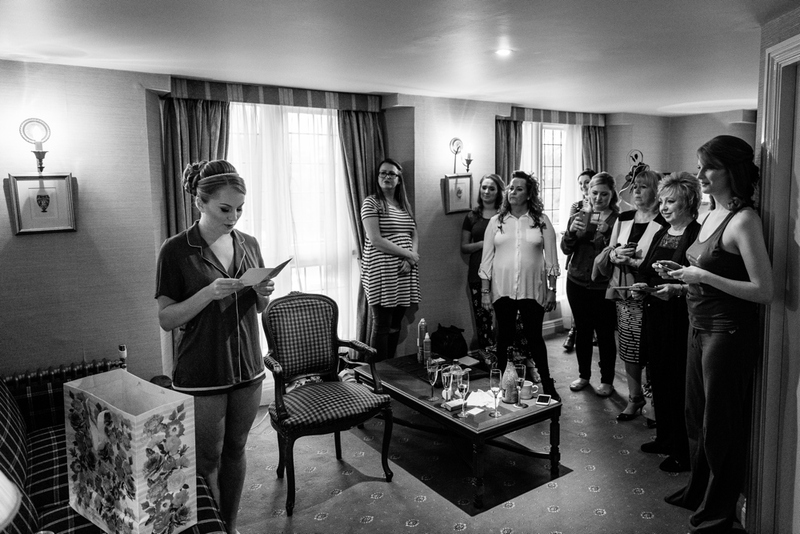 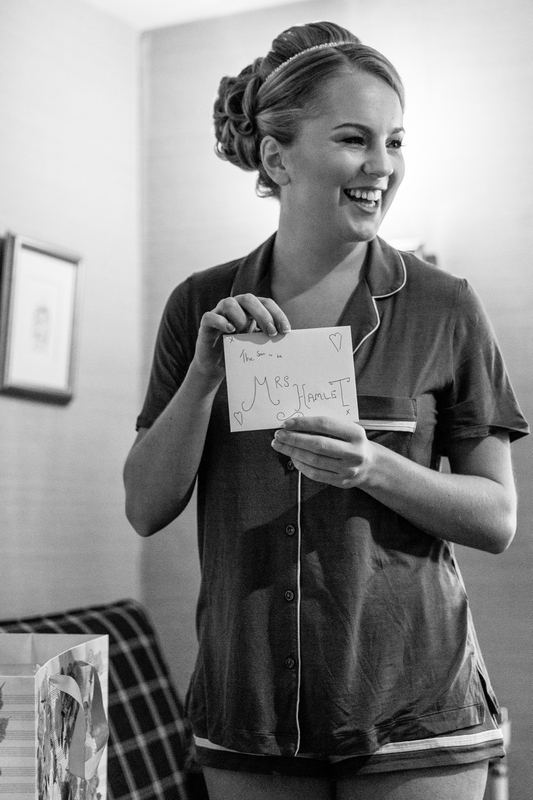 Olivia was amazing and I’ve had a number of bride-to-be’s ask for her contact details! 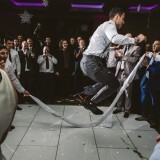 As our wedding was all under one roof, there was no need for transport. 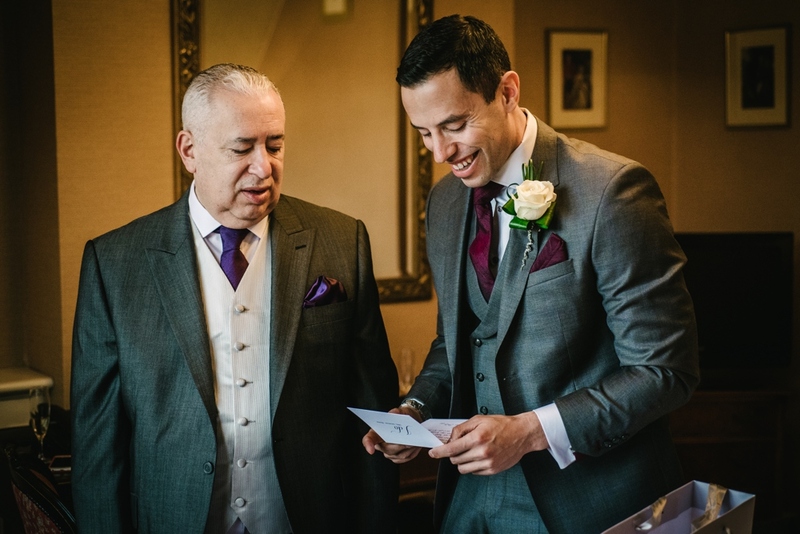 However, as a surprise for me, David had his family wedding car renovated and parked outside the venue so that we could carry on the tradition of the car featuring in our photos. 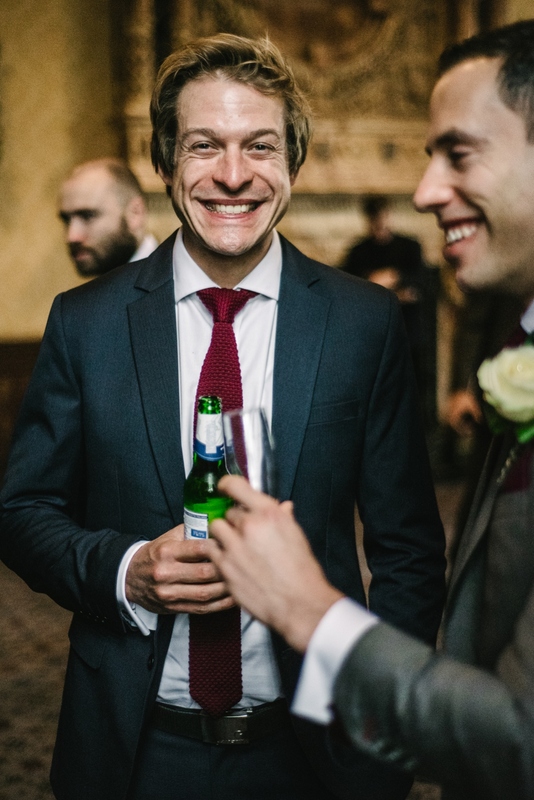 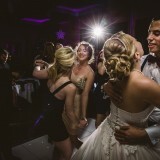 Our photographer was Lee Brown and he was just amazing. 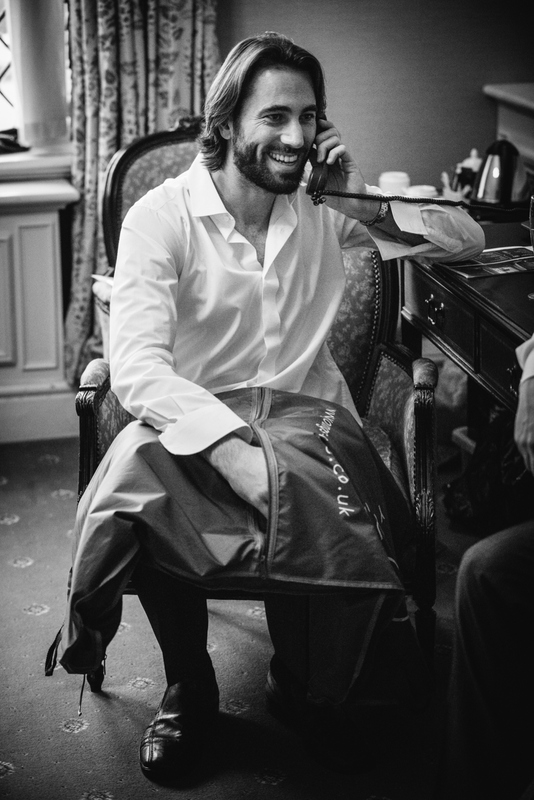 We barely noticed him being there on the day, he somehow found a way to make us feel comfortable in front of the camera and he made sure that we got the great shots but also had time to spend with our guests on the day. 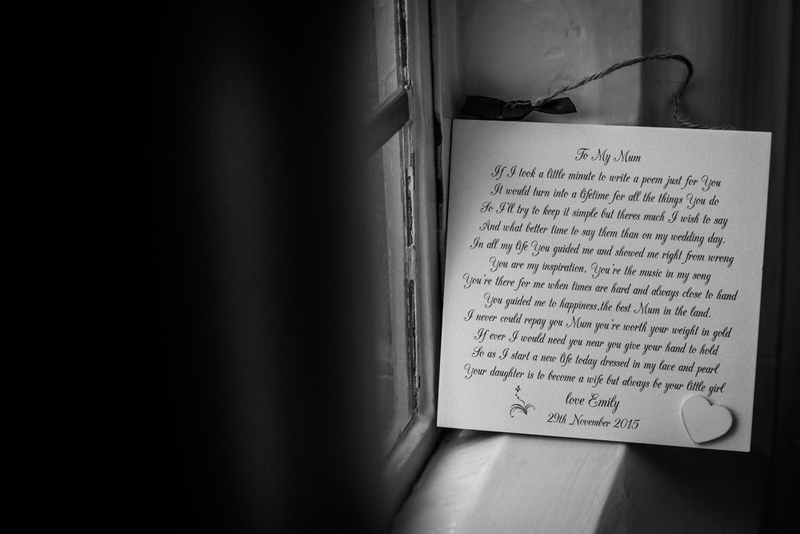 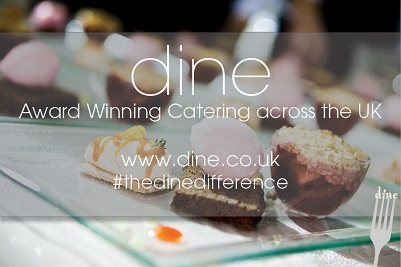 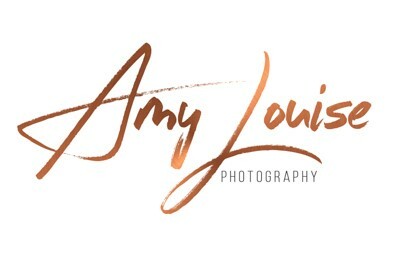 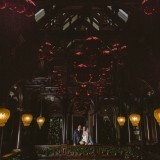 We could not have dreamt that our photos would have been anywhere near the quality that they are, we love them all! 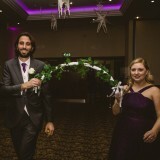 We also had our day filmed by Satin Pictures, who put so much work into our beautiful wedding video. 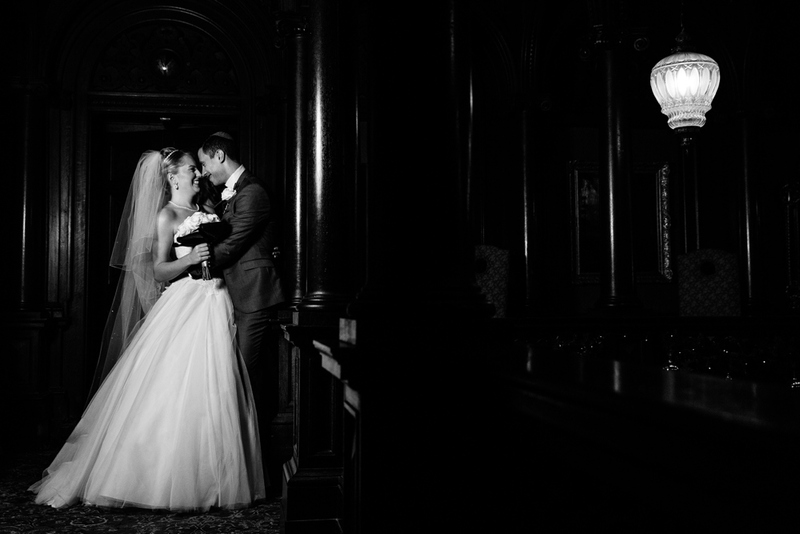 His work is incredible and again we barely noticed him on the day, we were actually worried that he didn’t film us! 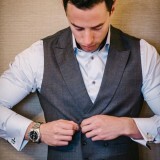 He is so talented and creative and he produces videos that really capture the day. 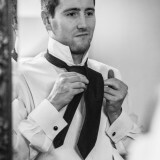 He also worked particularly well with our photographer. 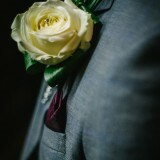 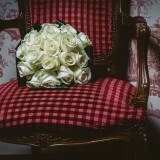 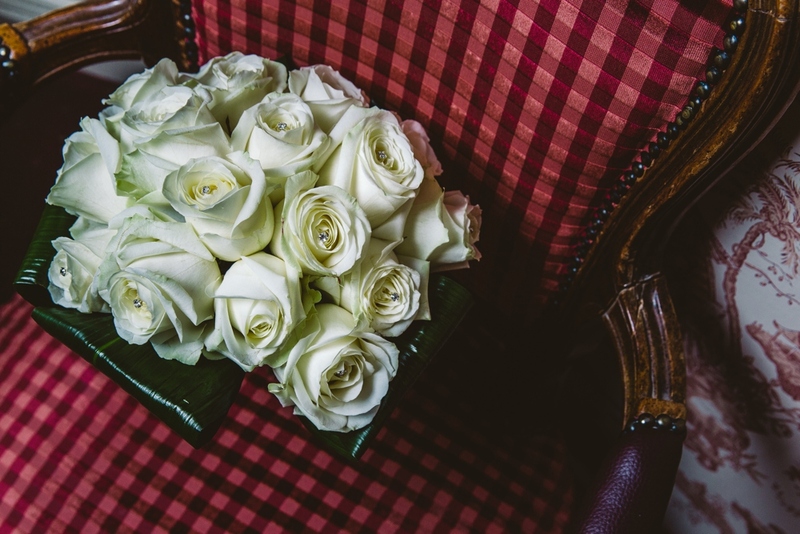 I carried a bouquet of ivory roses in tribute to my grandma, as these were her favourite flowers. 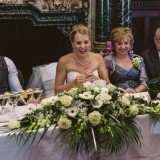 They were provided by our local florist, Hazel Grove Flowers, who were very professional and the flowers were stunning. 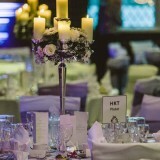 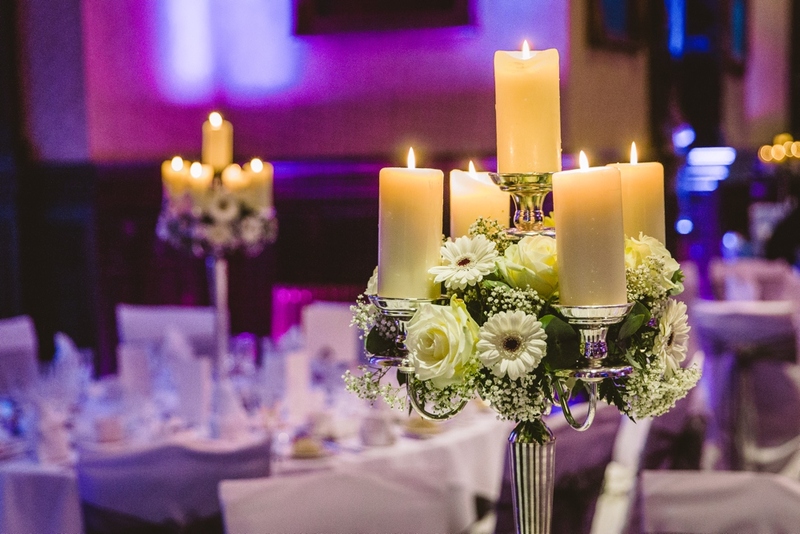 To style the venue we had candelabras dressed with fresh flowers and placed on top of mirrors with tea lights around them in our breakfast room. 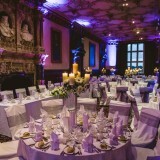 In our evening room we had tall vases with a very modern arrangement and the water was dyed dark purple! 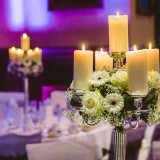 Both rooms were dressed by Hazel Grove Flowers who really inspired us with their ideas for both rooms. 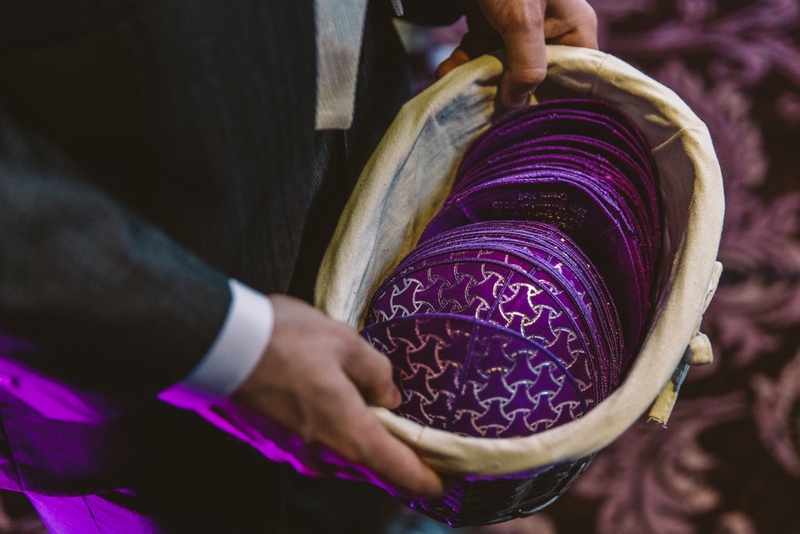 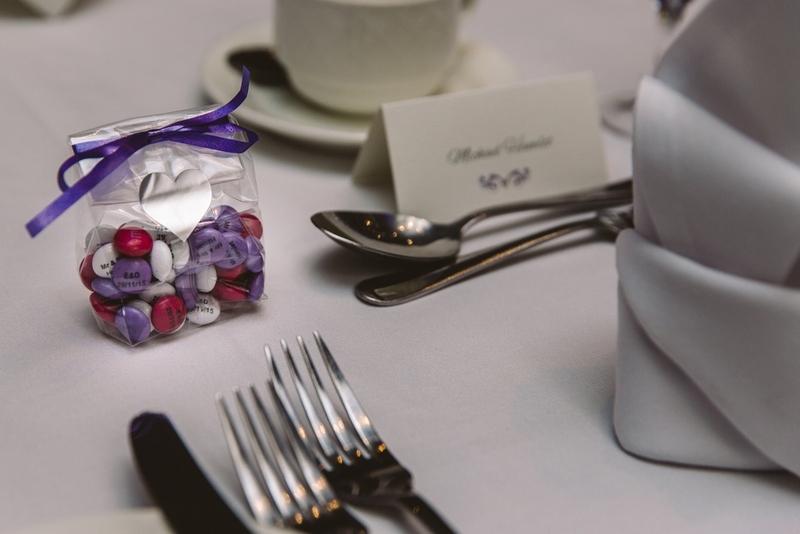 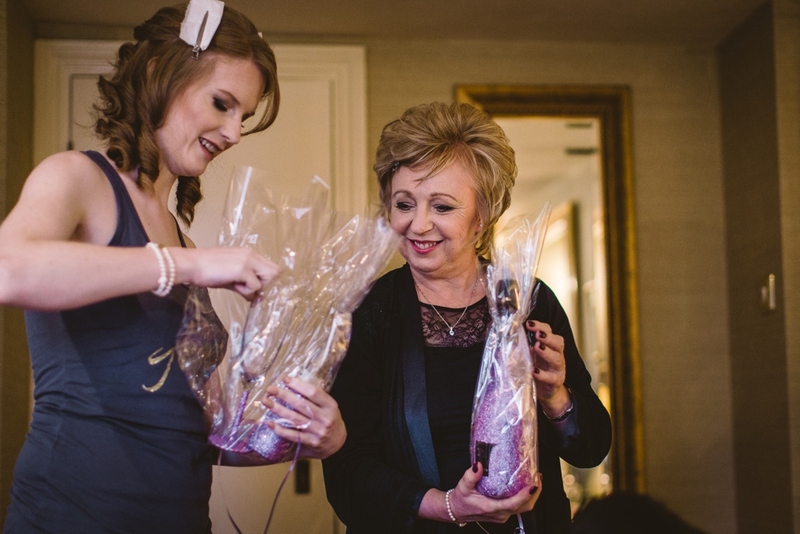 As favours we gave small bags of personalised M&M’s with heart shaped stickers on the back and dark purple bows to finish. 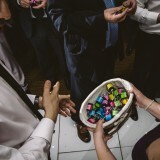 We bought the M&M’s online and then portioned them and decorated them ourselves. 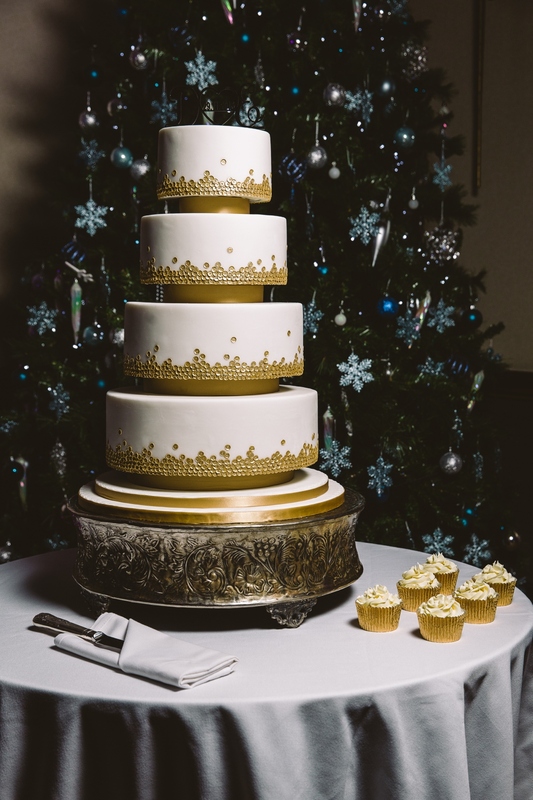 We had a four-tier ivory wedding cake with different flavours for each tier. 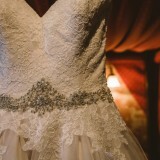 It was decorated with golden sequins. 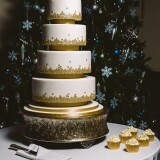 The cake was made by Buttercup Cakes, who we discovered at a wedding fair. 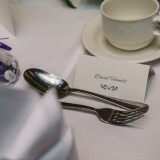 For our wedding breakfast we served salmon and dill fishcakes for starter, followed by roast chicken in a peppercorn sauce and finally a raspberry crème brulee for dessert. 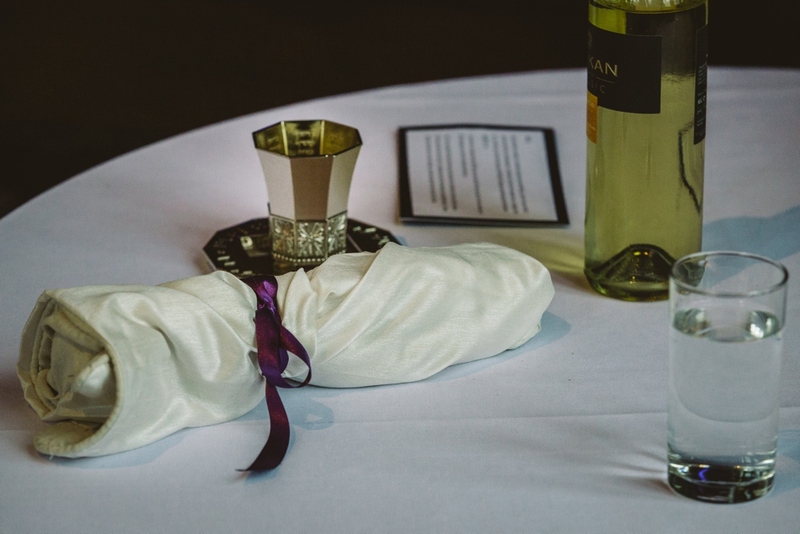 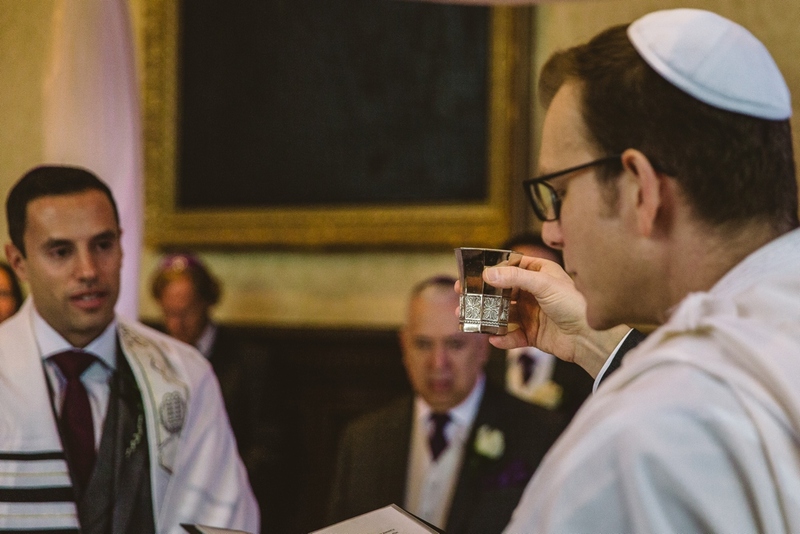 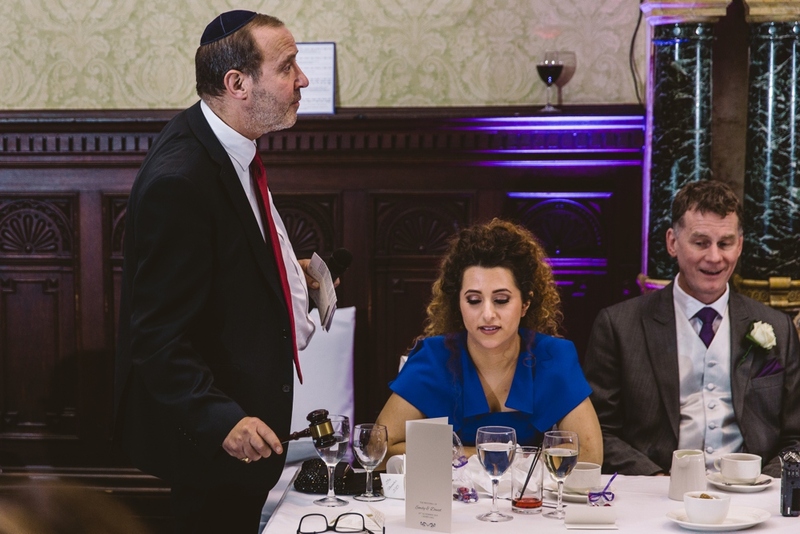 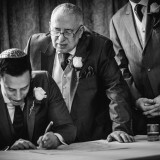 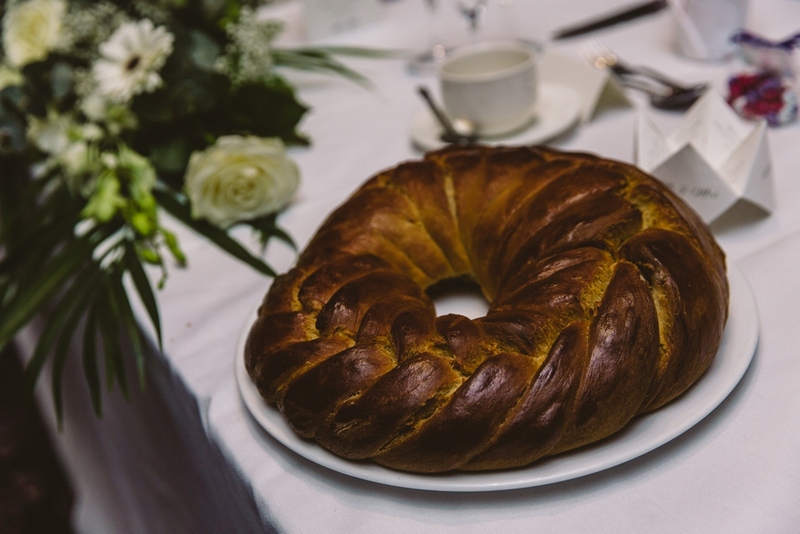 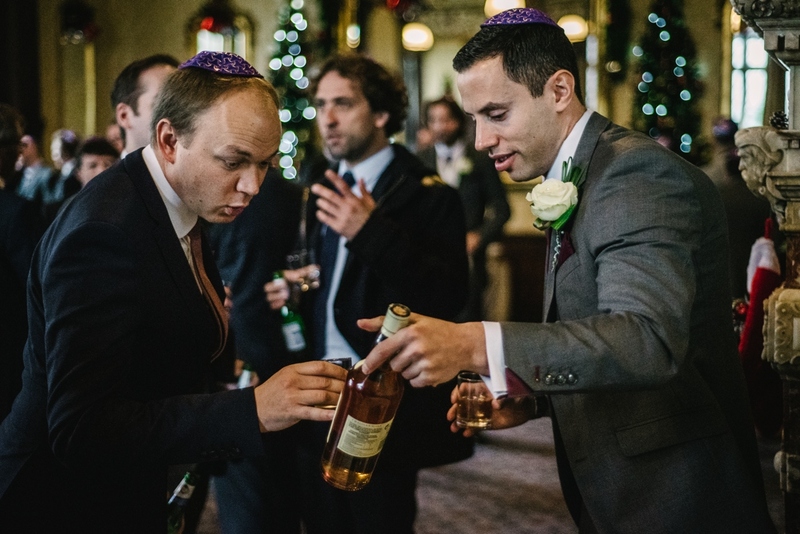 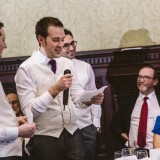 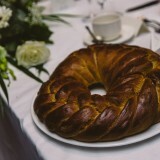 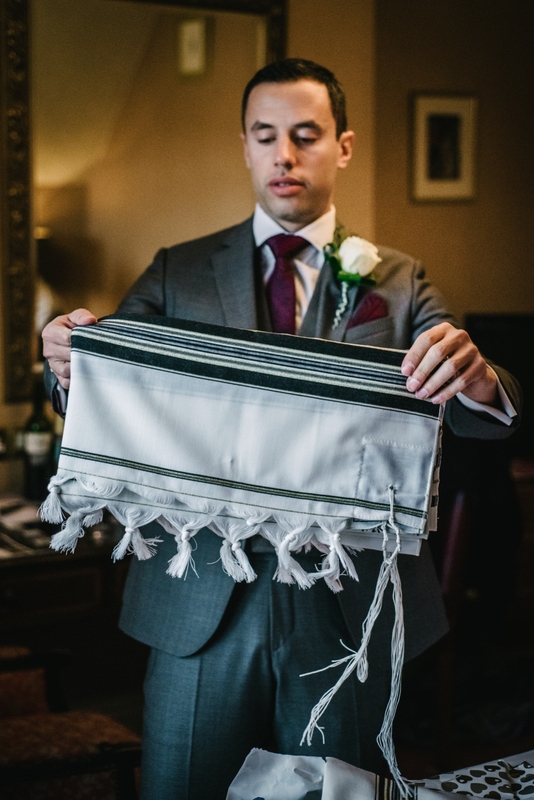 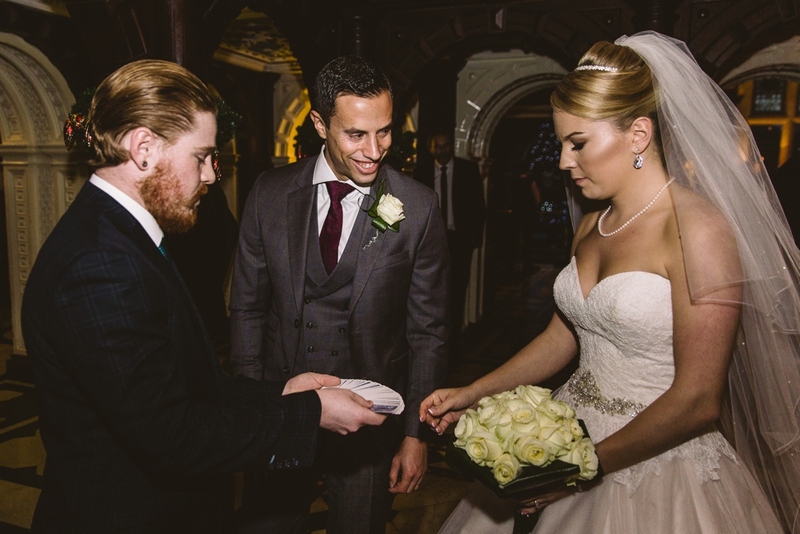 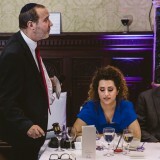 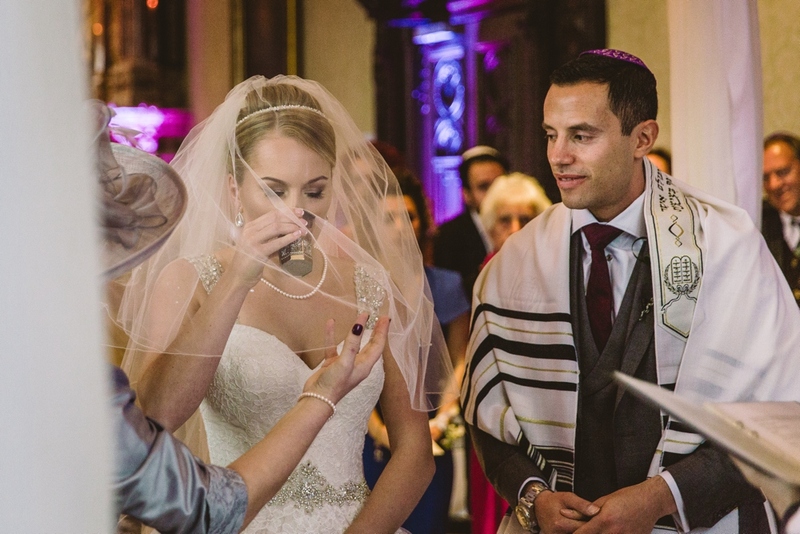 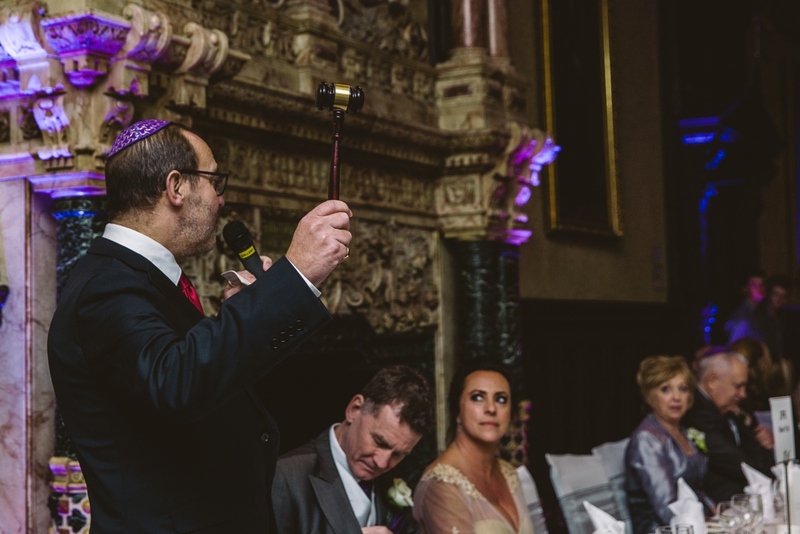 We were mindful when choosing our menu that a lot of the guests were Jewish and followed Kosher dietary requirements to varying degrees, so we tried to serve dishes that we felt most of our guests could enjoy. 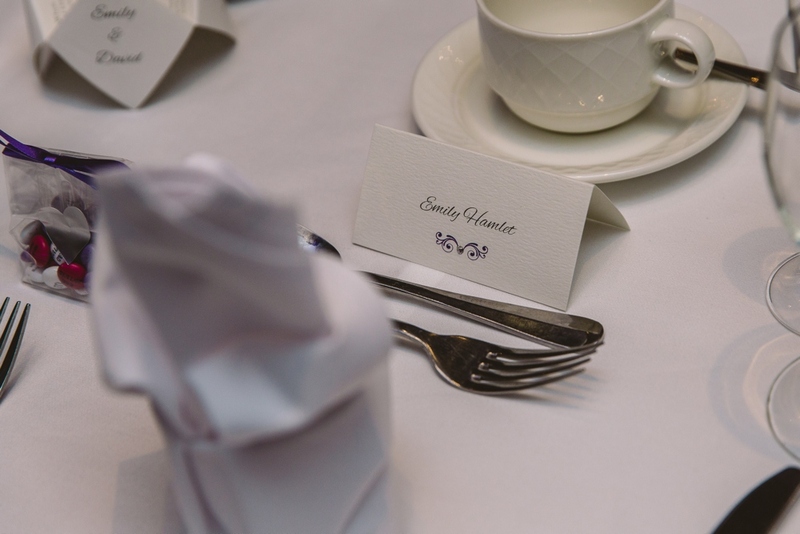 We also spent a great deal of time designing our vegetarian menu, which featured a goat’s cheese tart and Mediterranean vegetable gnocchi for the people who couldn’t have the meat option. 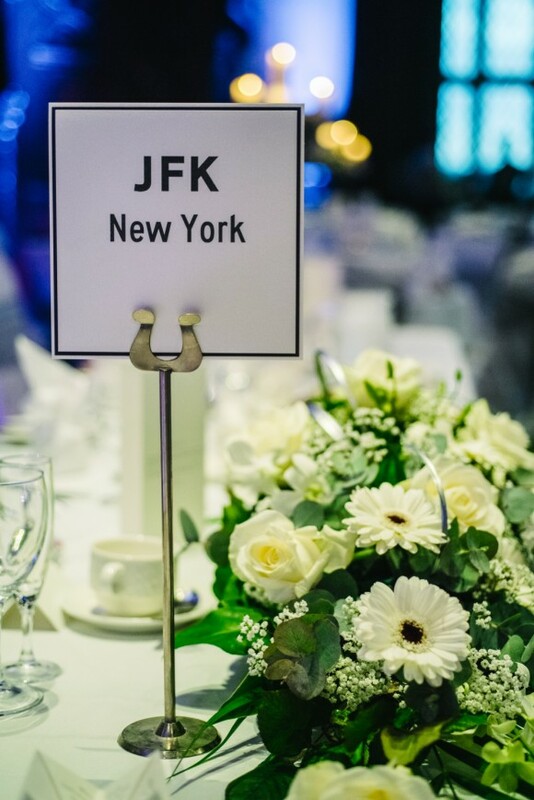 Food was very important to us and so we personalised our evening buffet to give it an American theme serving burgers, chicken wings and nachos amongst a variety of other things. 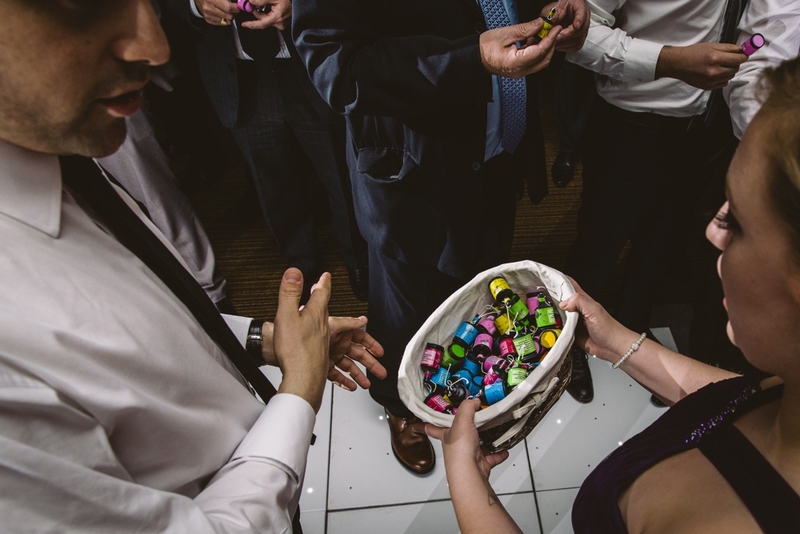 We also made a candy buffet filled with our favourite sweets from our childhoods, which included Troli burgers and Dib Dabs. 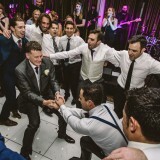 Music was another very important element to us and we found an incredible band very early in our planning process to provide our entertainment. 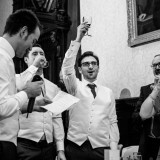 This was a huge advantage as we were able to ask their advice on a number of things and add more music to our day. 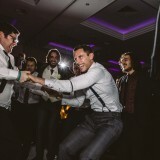 Originally we booked Vibetown for two 60 minute sets and one 15 minute Israeli set in the evening. 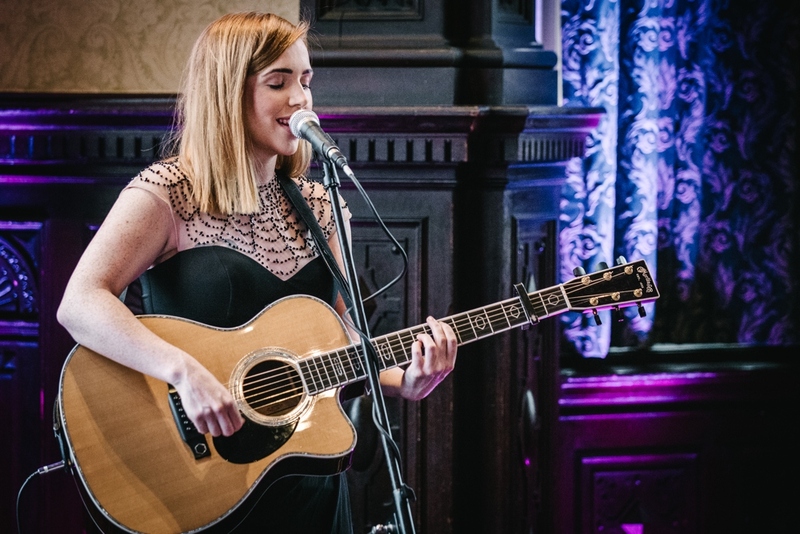 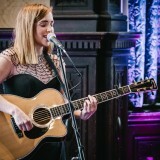 We then added their acoustic singer Laura Oakes to perform a set during our ‘cocktail hour’ and finally we also added her to perform while our guests were arriving for the ceremony and also to sing as we came down the aisle. 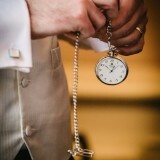 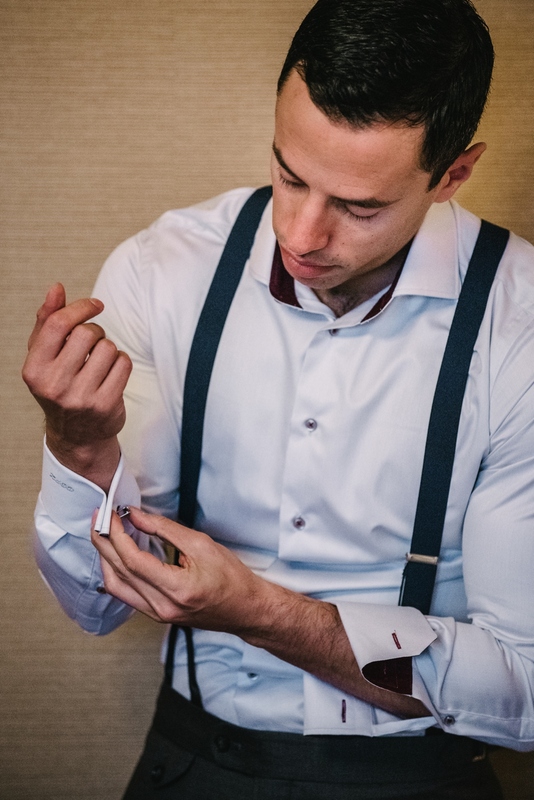 In addition we hired a magician called Cross Magic to entertain our guests during the cocktail hour too. 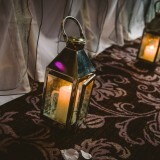 This was a last minute addition but was a huge hit with our guests. 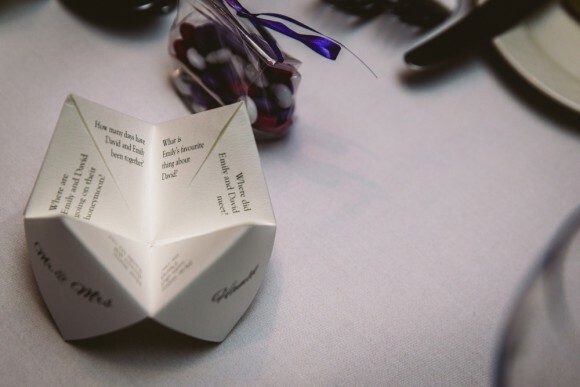 As a surprise to David at the reception, I booked Augustus Gloop’s Chocolate Fountain, which was a huge hit with our guests. 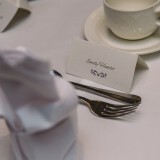 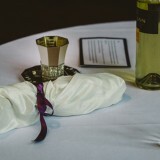 They provided a wide array of foods to dip into the chocolate and also huge napkins to protect our guest’s clothing. 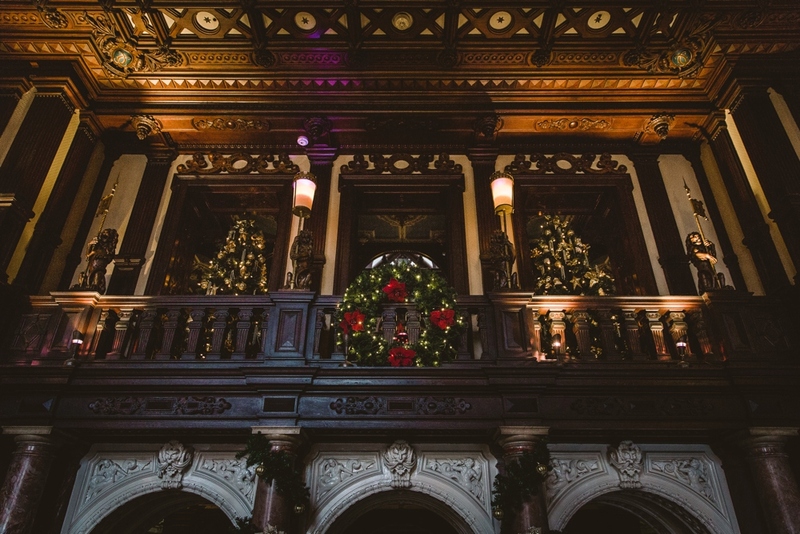 The fountain was busy all night and the member of staff that came to supervise was so friendly and encouraged our guests to try the fountain. 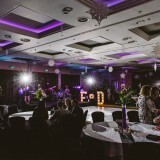 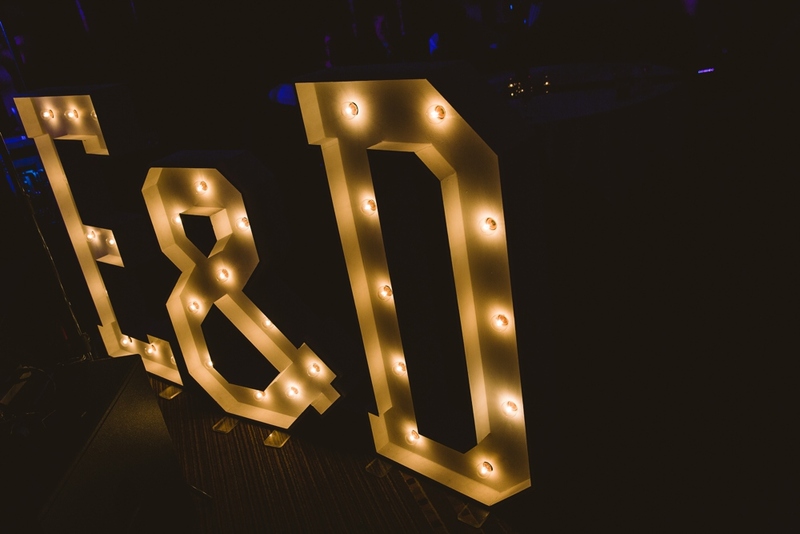 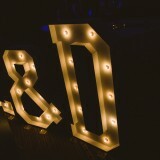 We also added a fairy lit dance floor and light up 5ft ‘E&D’ letters to our evening room to add to the party atmosphere. 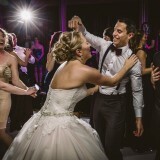 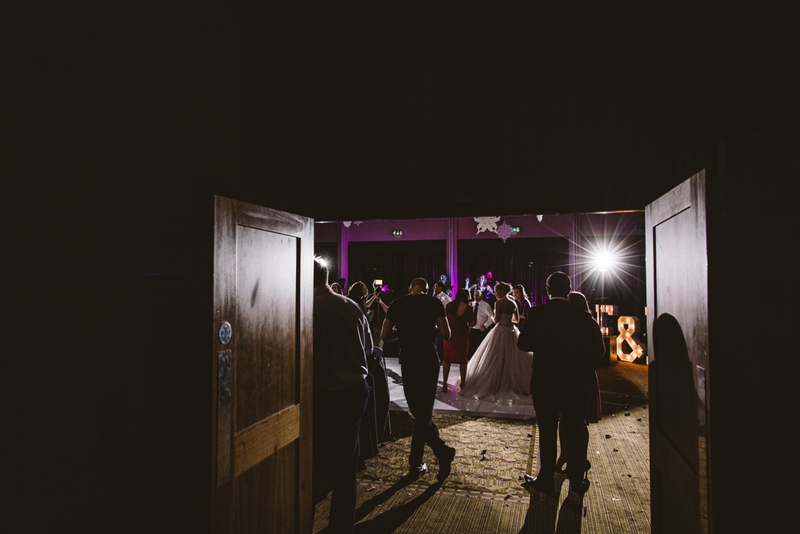 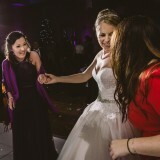 Both of these really stand out on our photos and the way that the dance floor lit up my dress was beautiful. 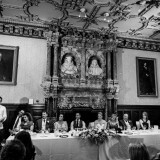 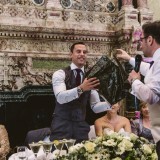 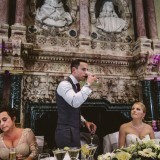 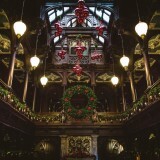 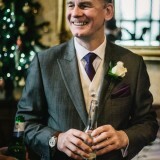 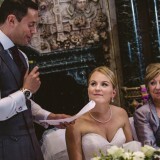 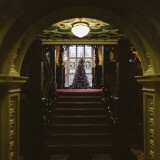 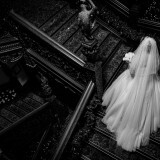 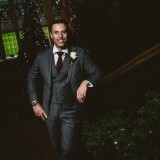 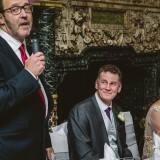 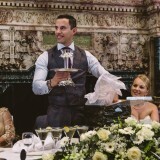 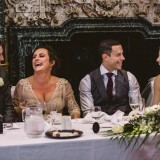 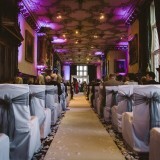 I would have no hesitation in recommending Crewe Hall to other brides and grooms. 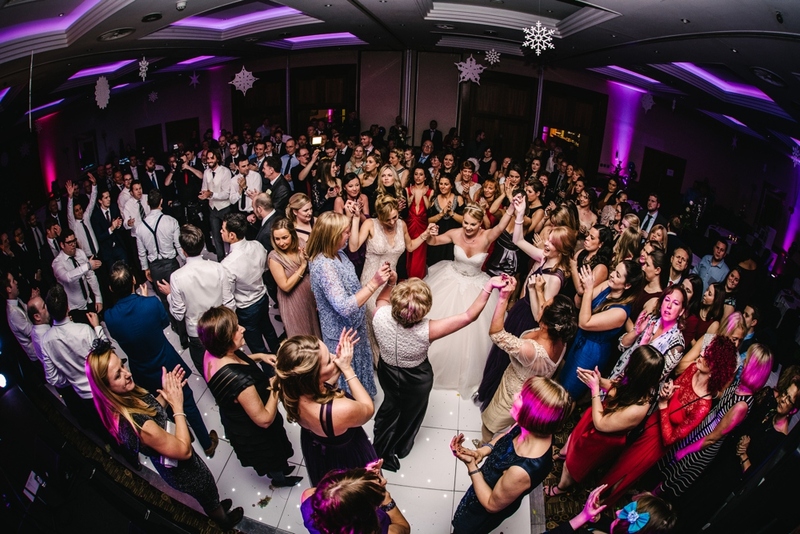 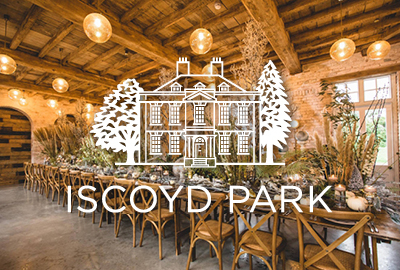 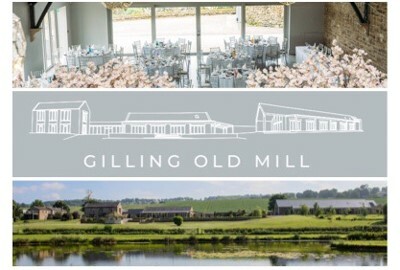 It really was the perfect venue and we found that there weren’t many venues that could accommodate such a large wedding (150 people in the day and 250 at night) whilst still feeling personal and intimate. 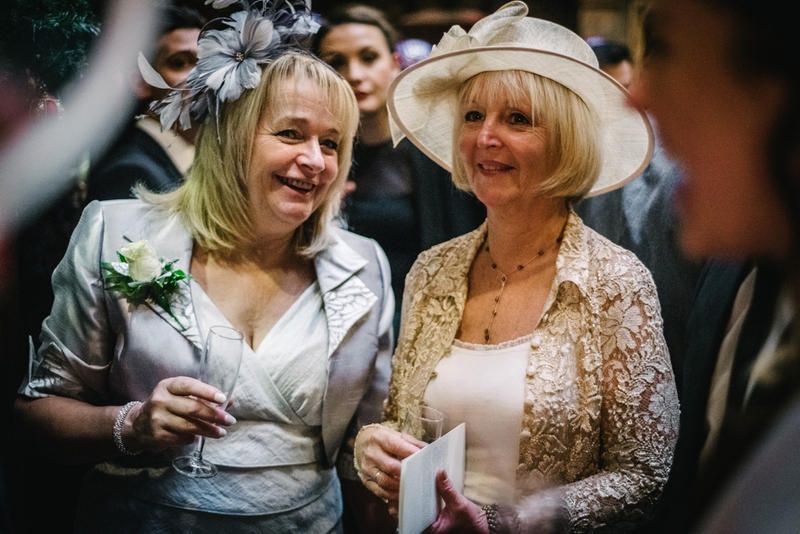 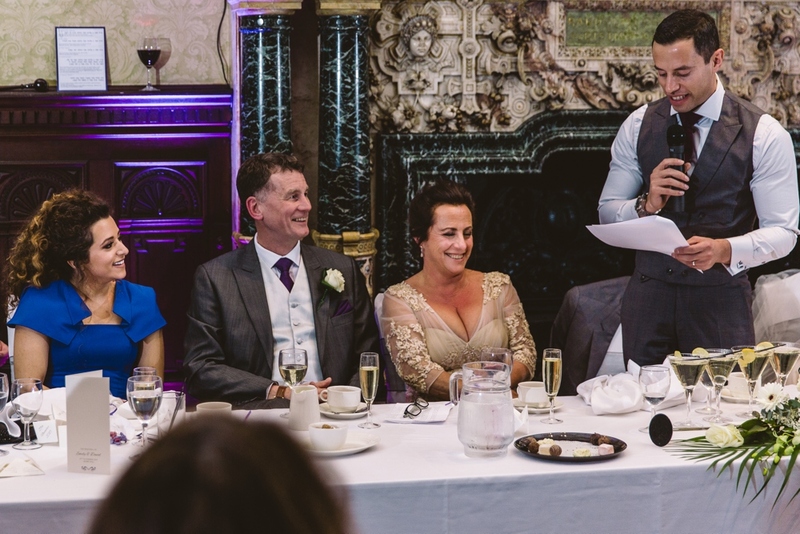 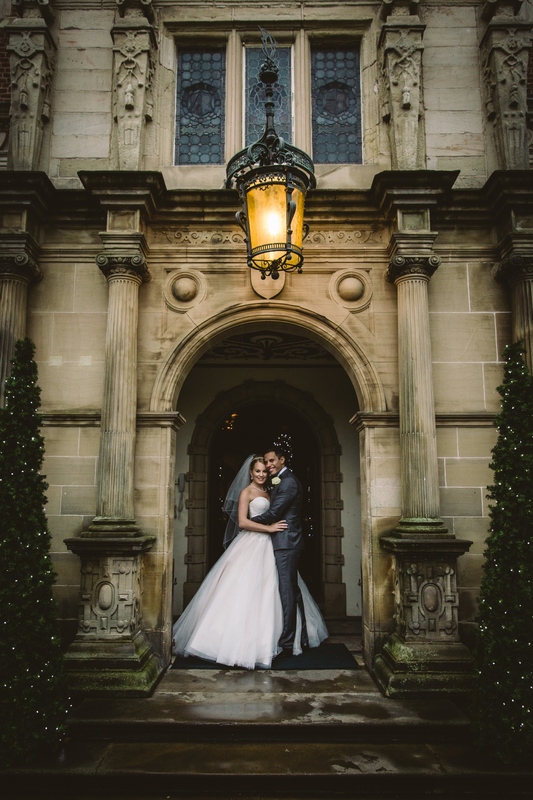 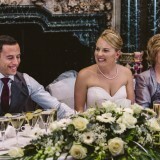 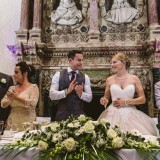 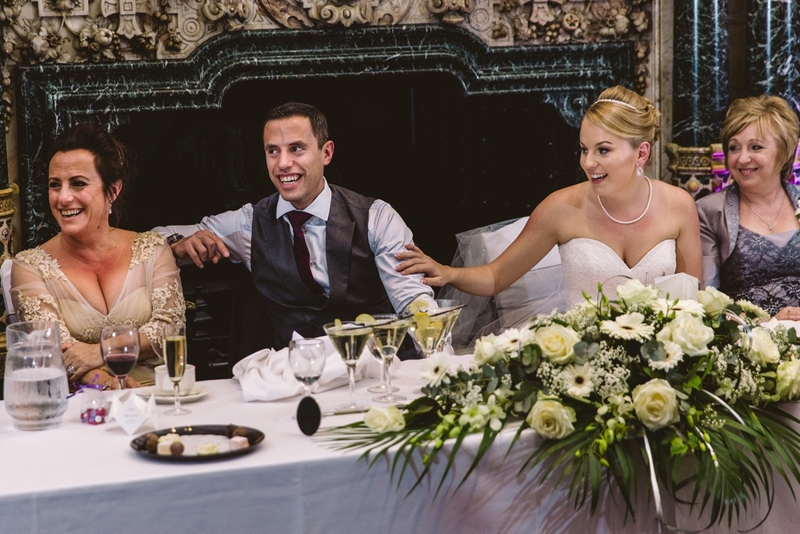 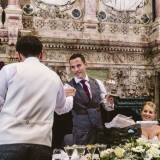 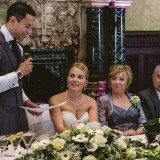 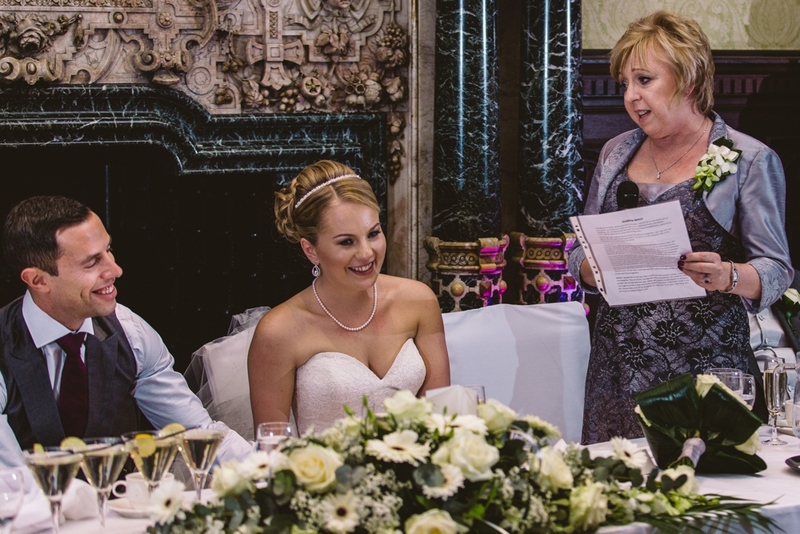 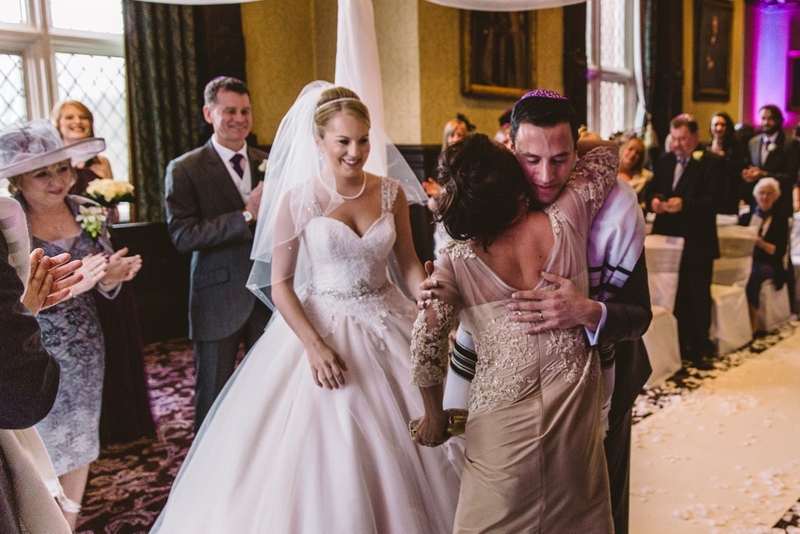 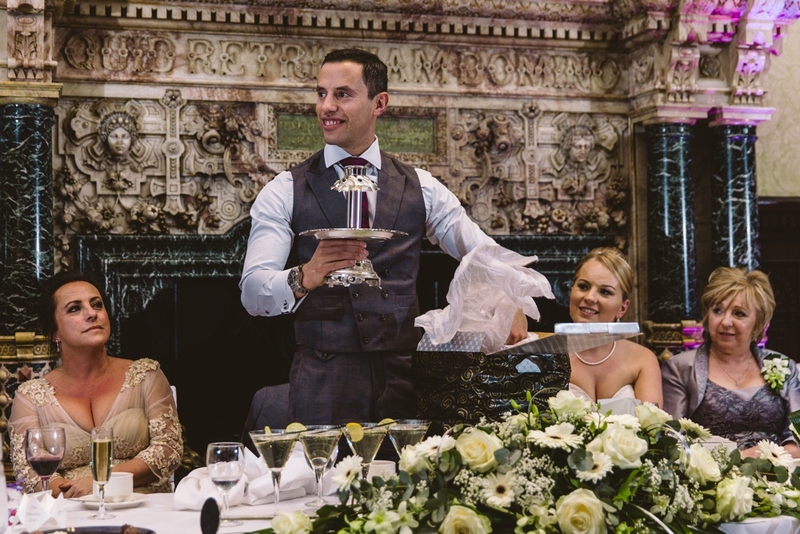 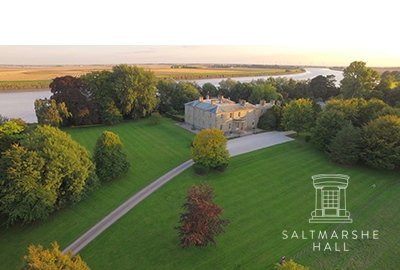 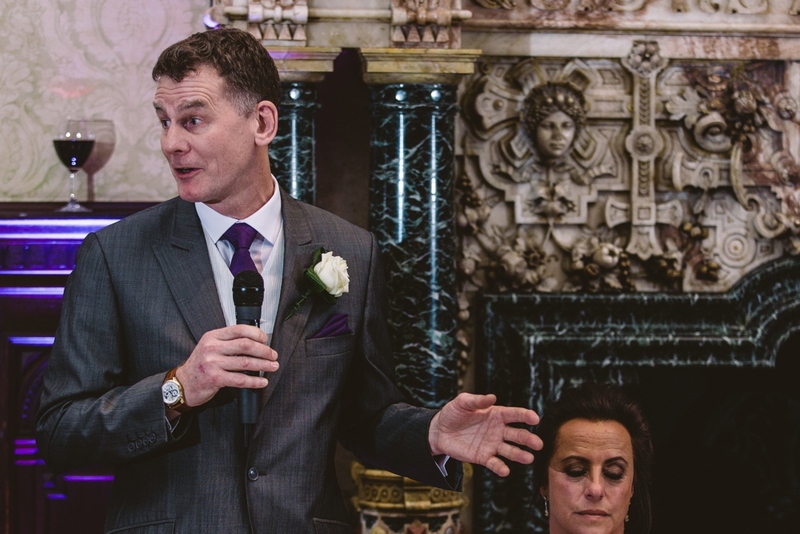 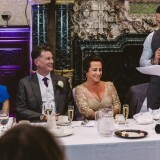 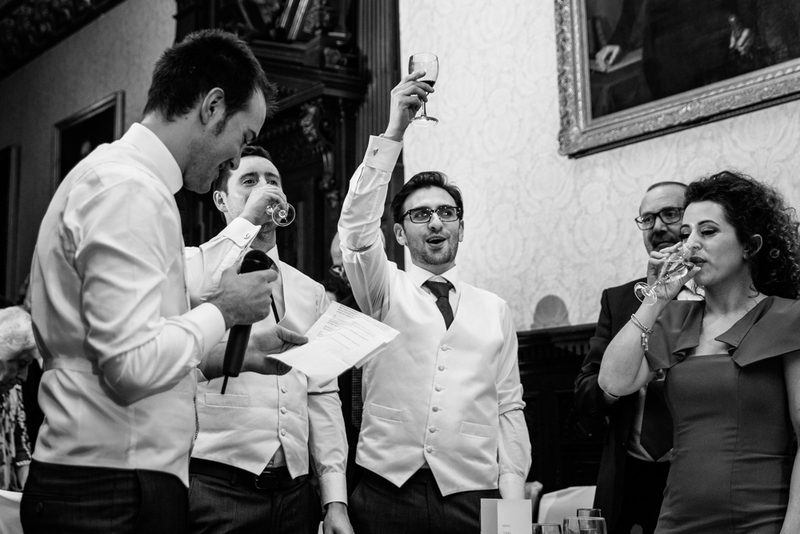 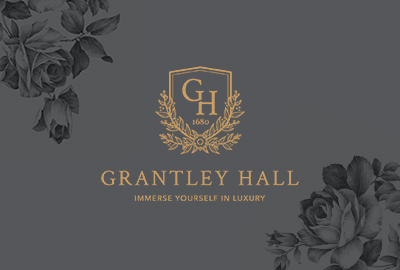 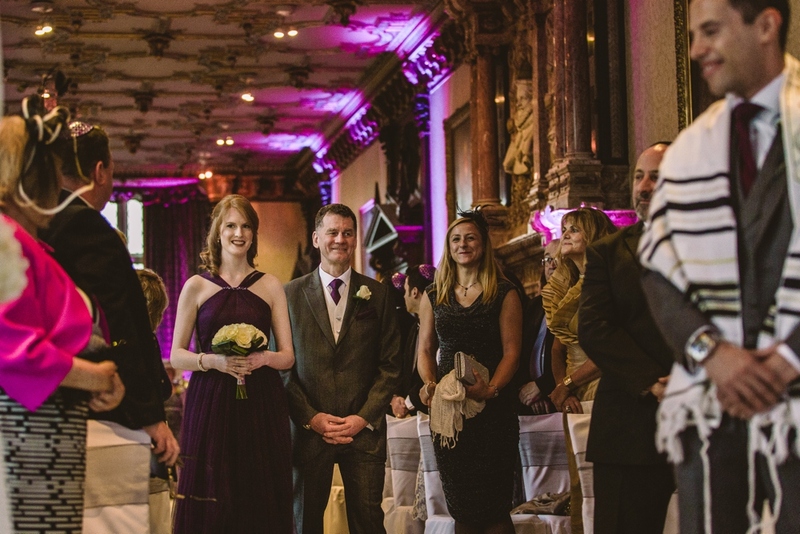 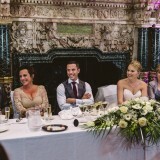 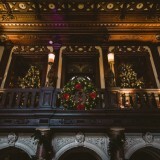 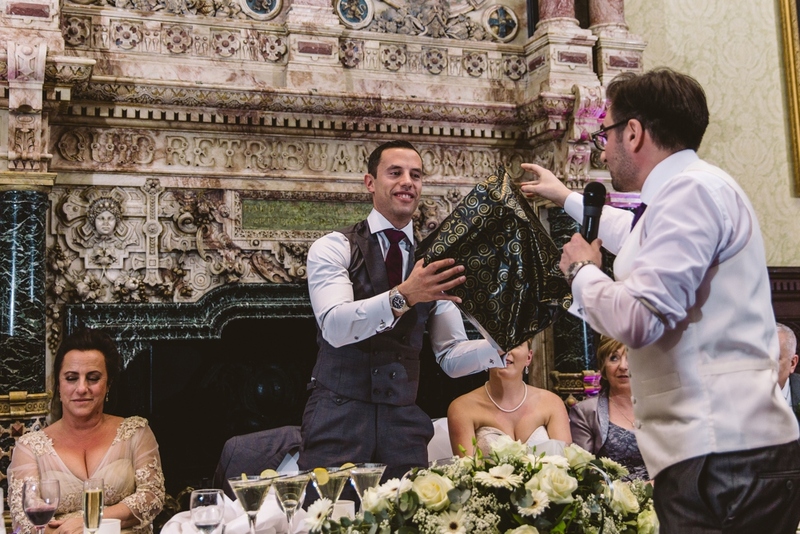 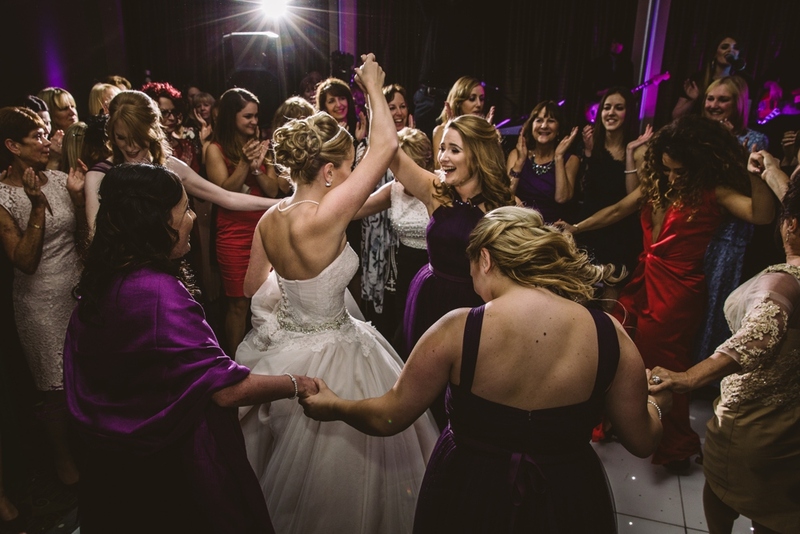 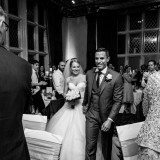 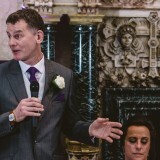 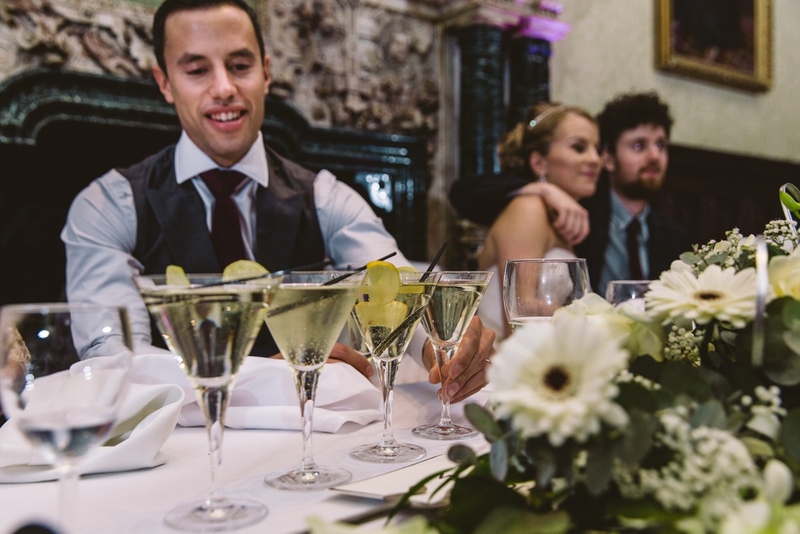 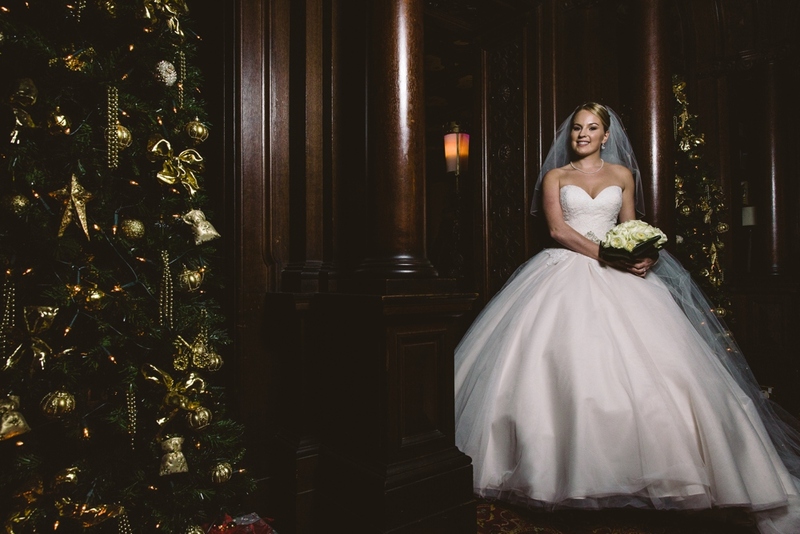 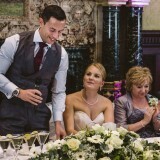 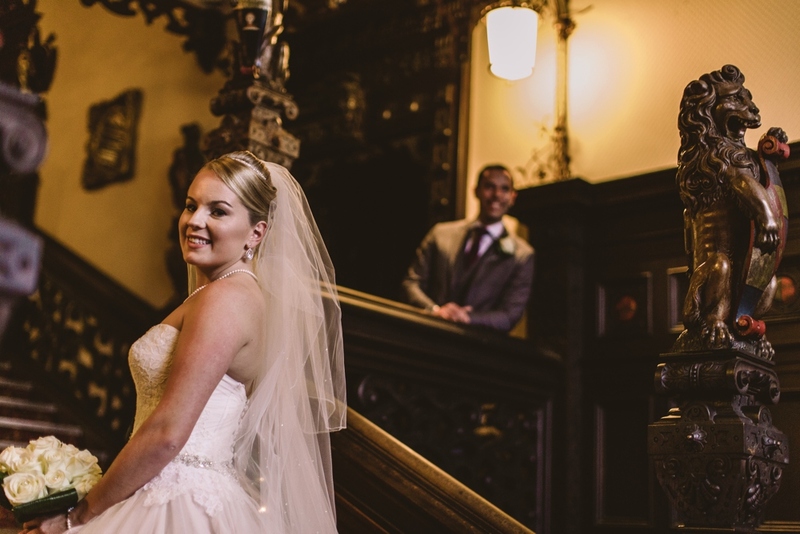 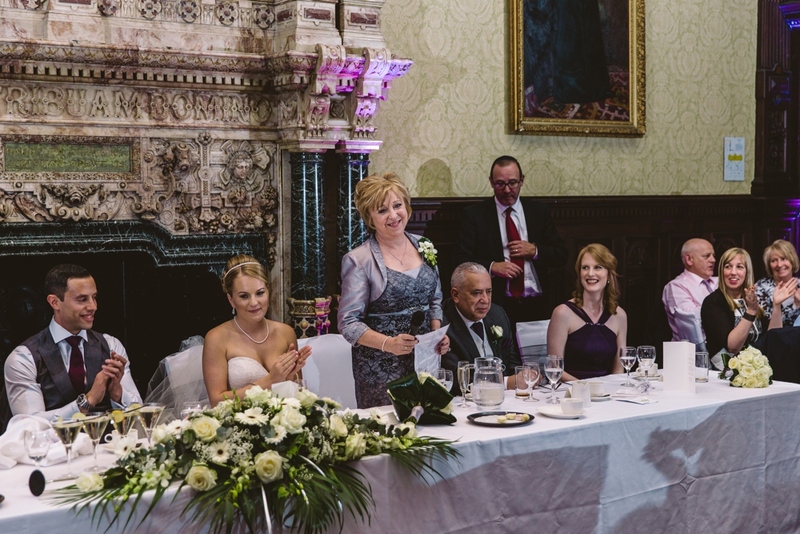 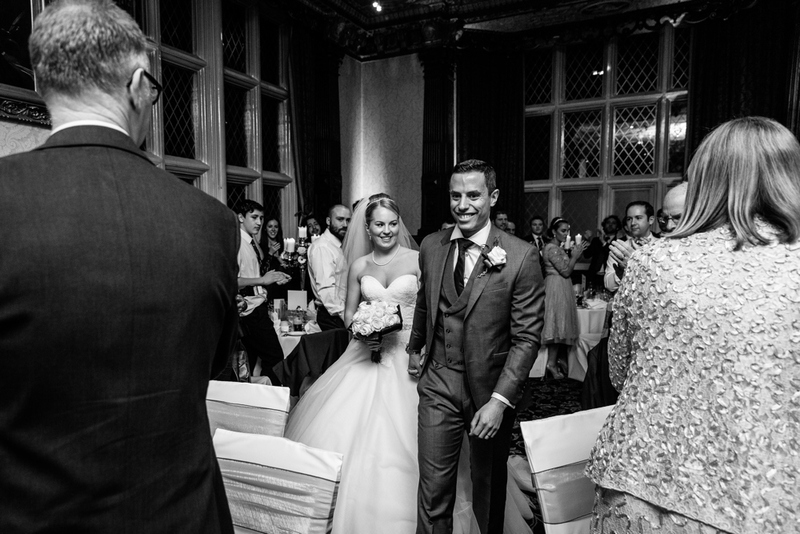 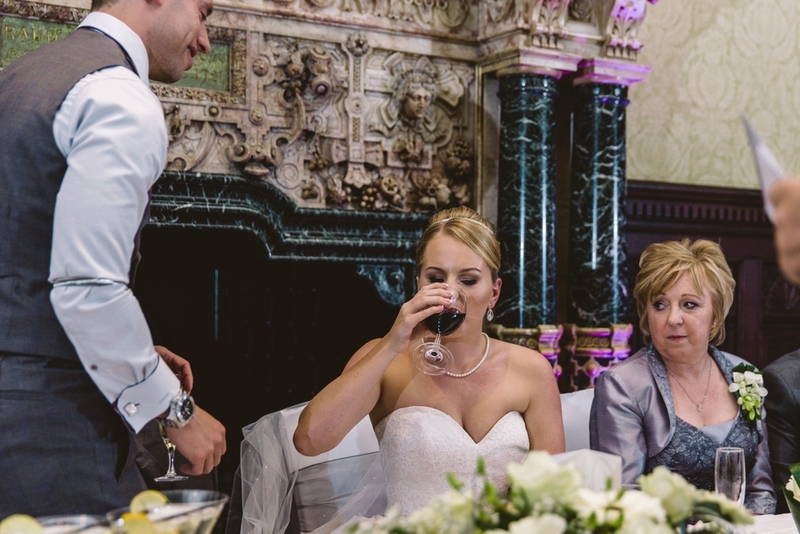 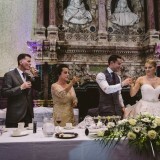 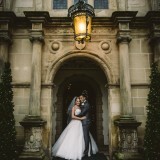 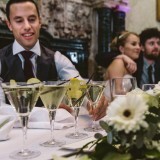 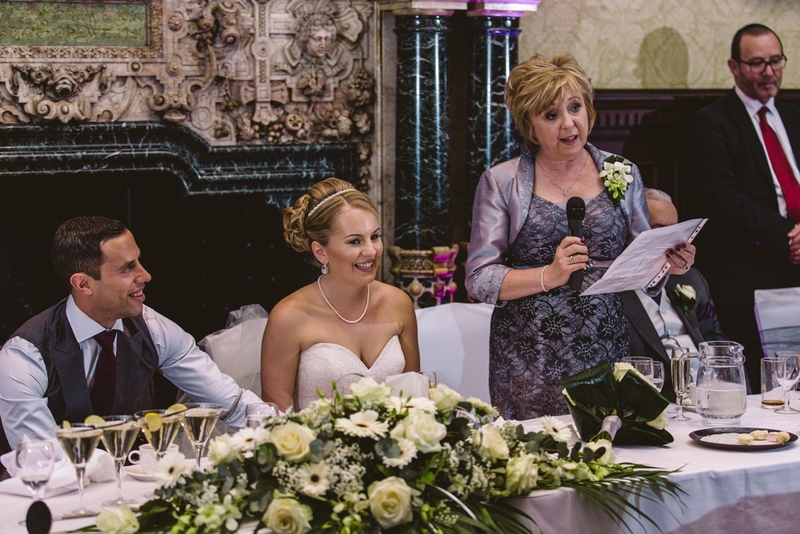 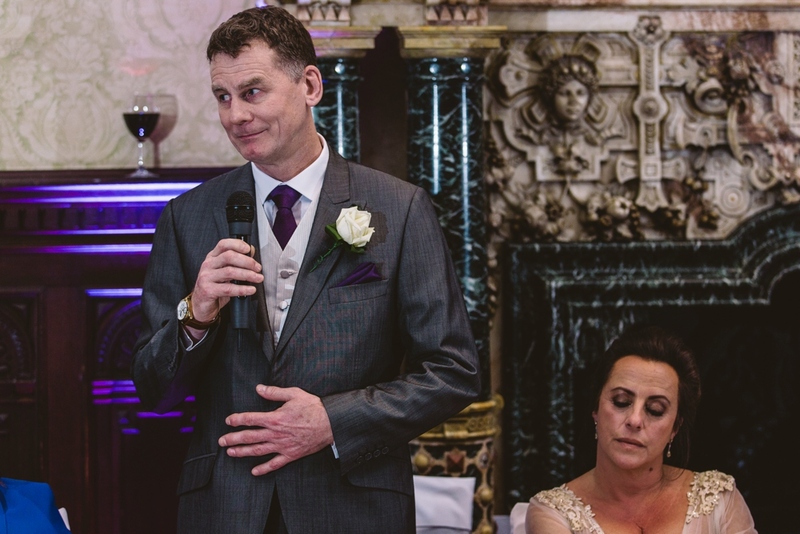 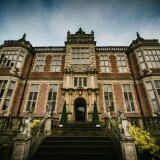 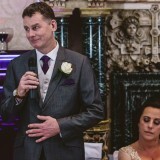 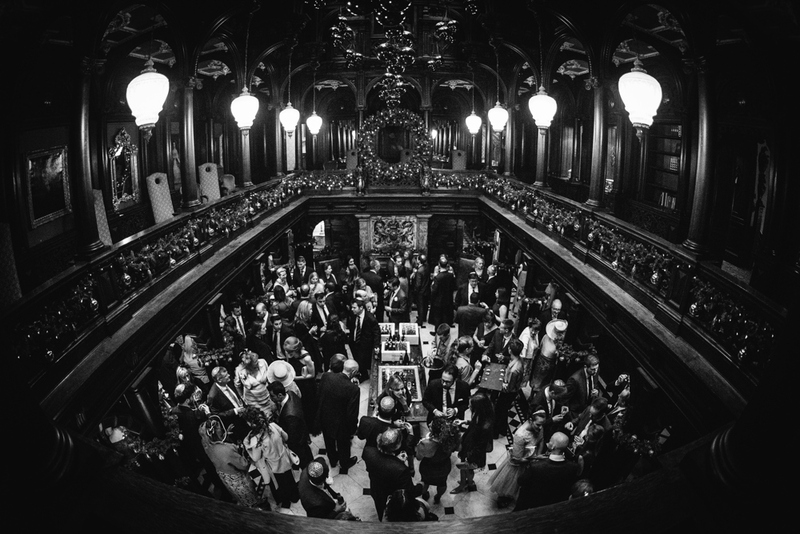 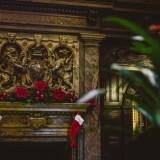 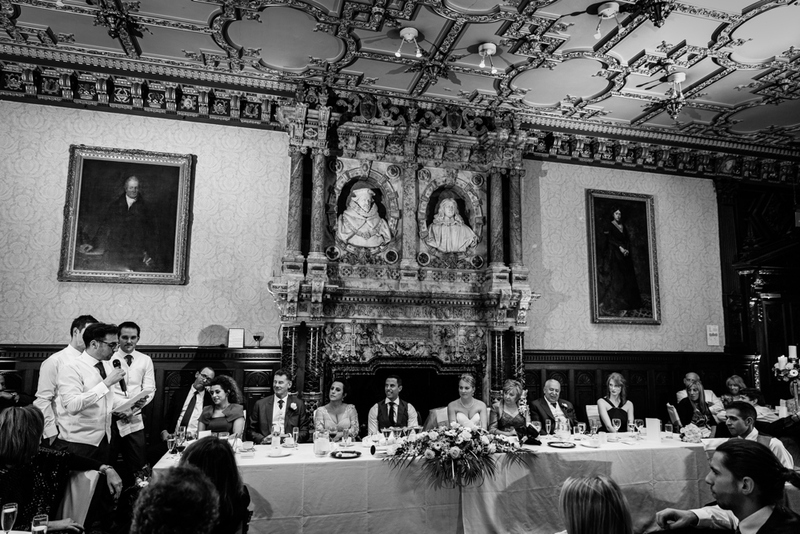 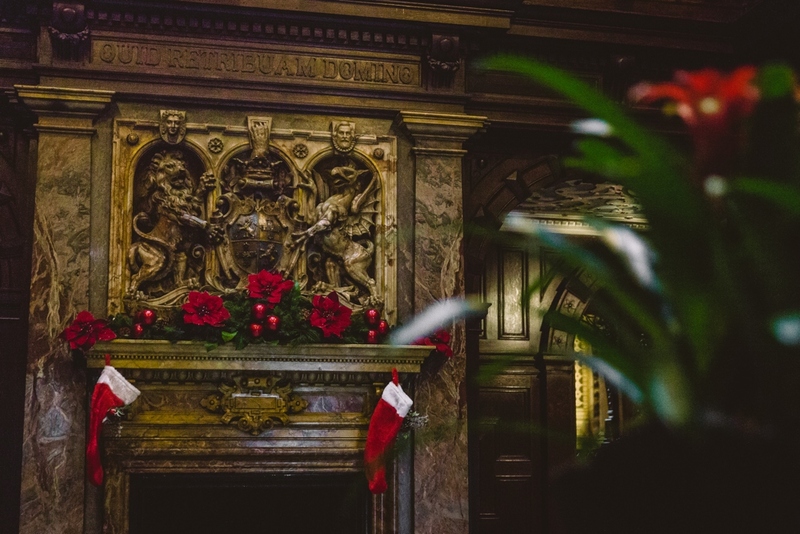 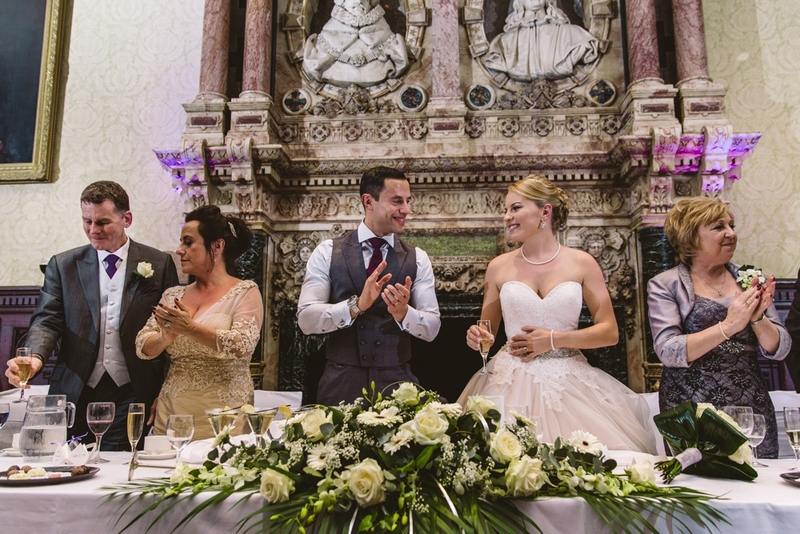 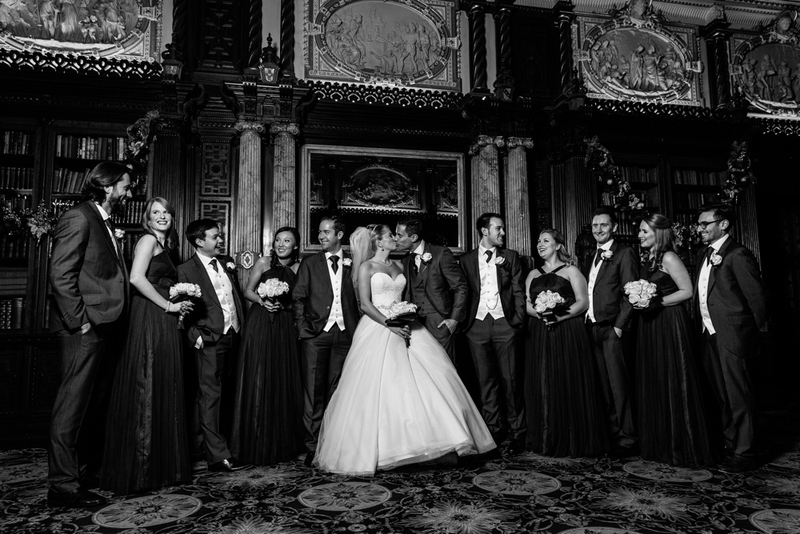 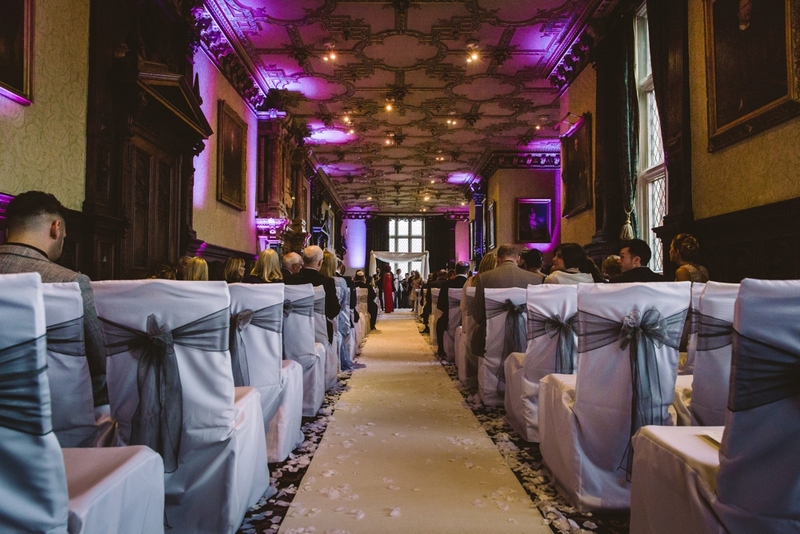 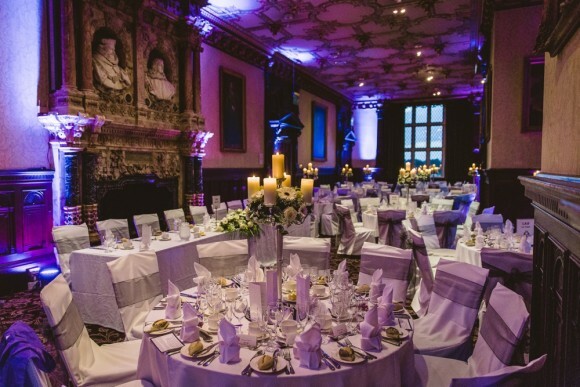 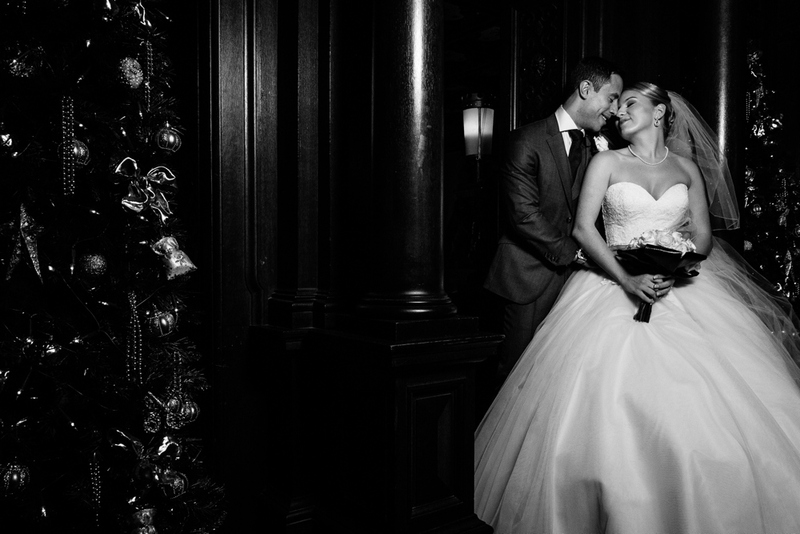 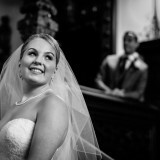 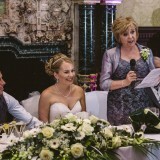 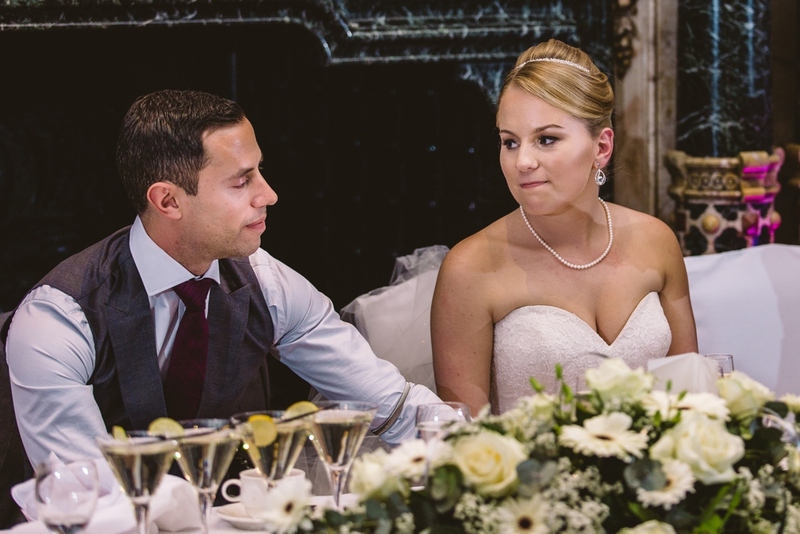 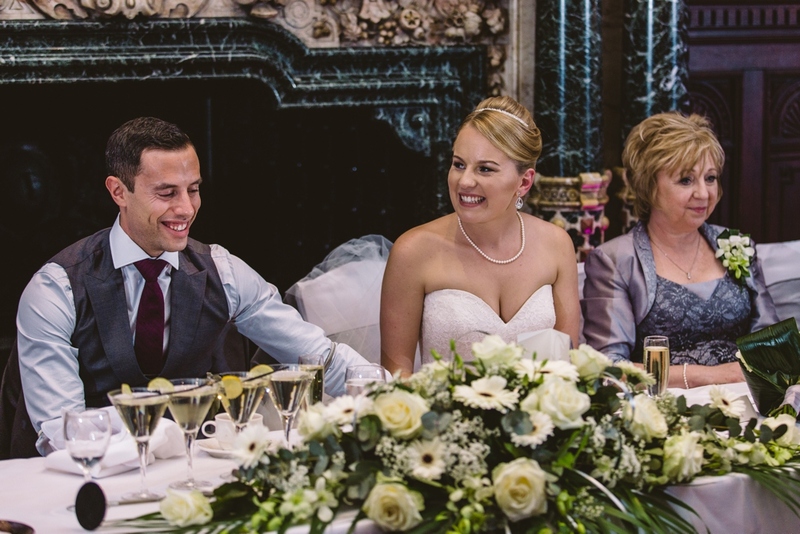 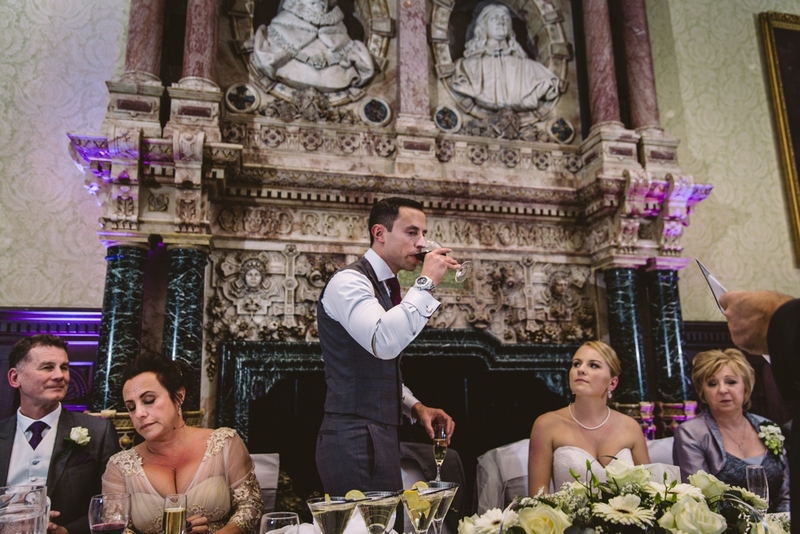 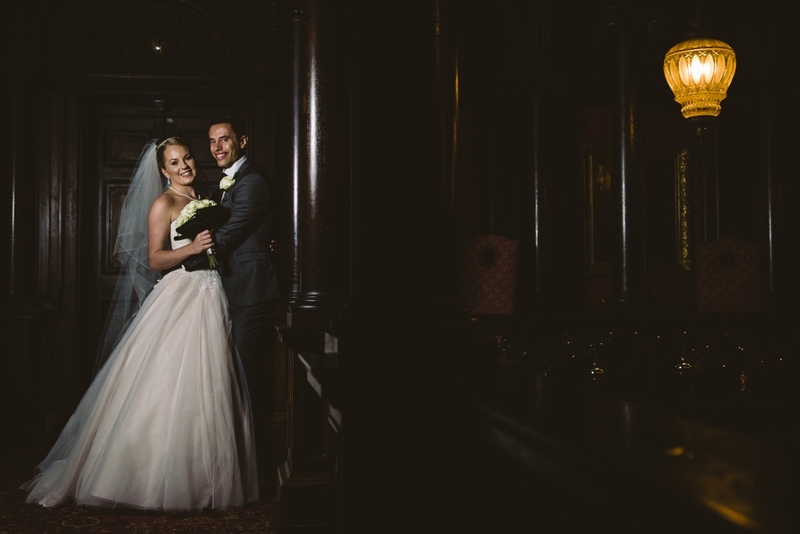 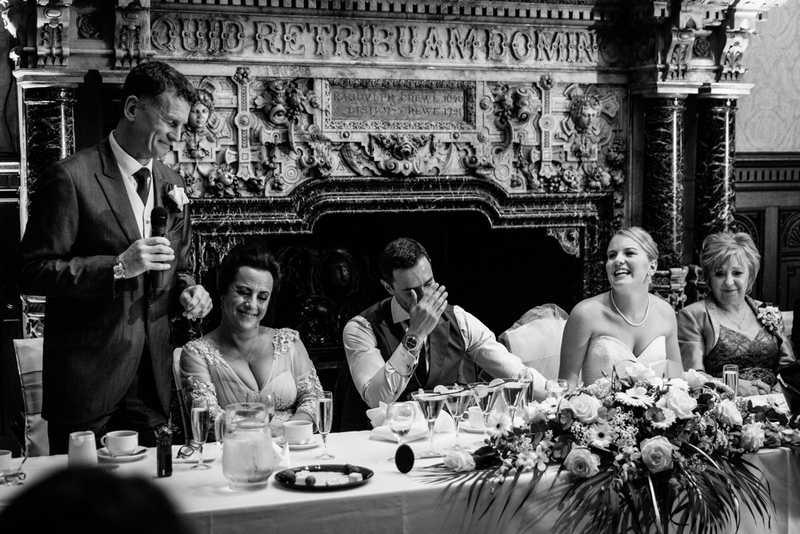 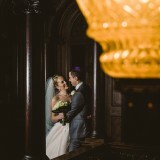 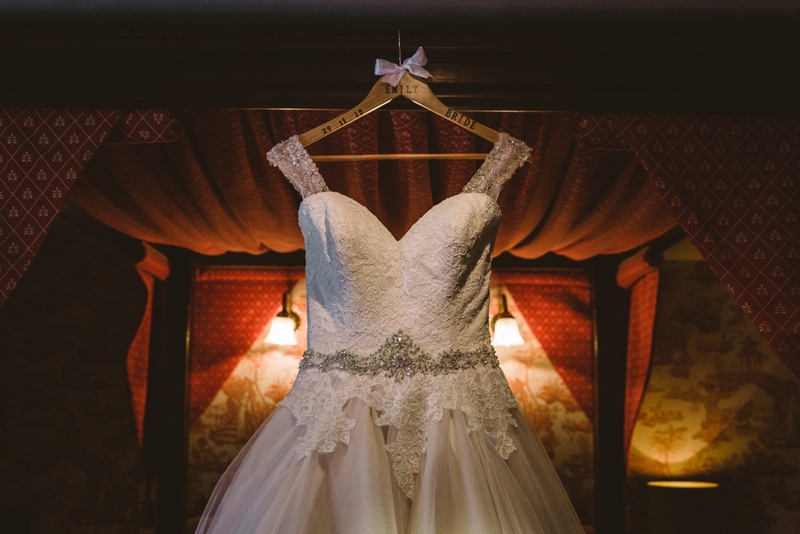 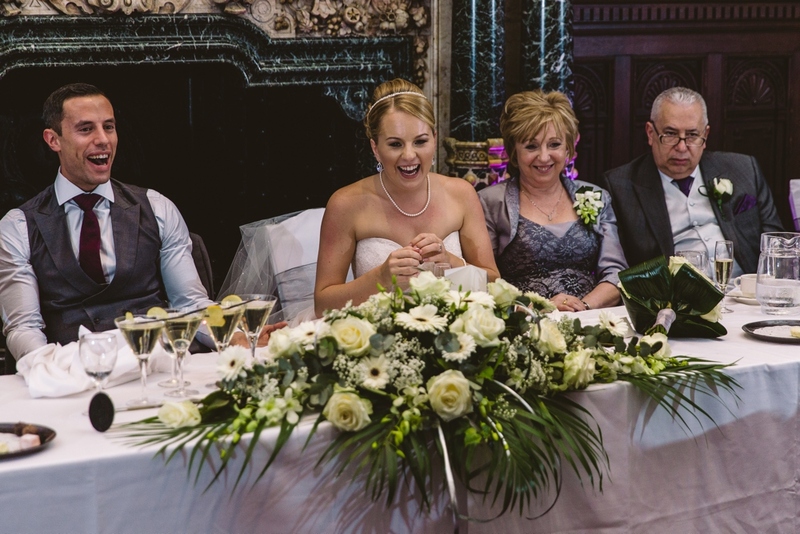 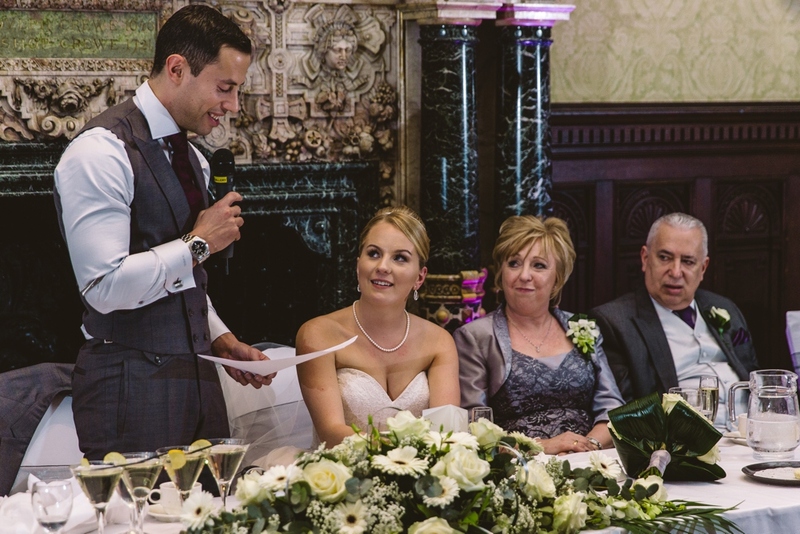 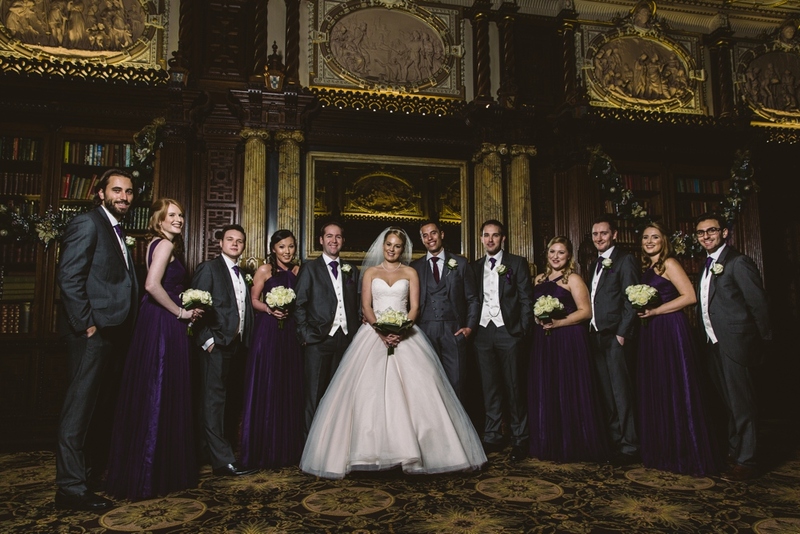 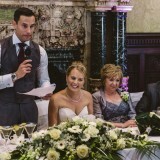 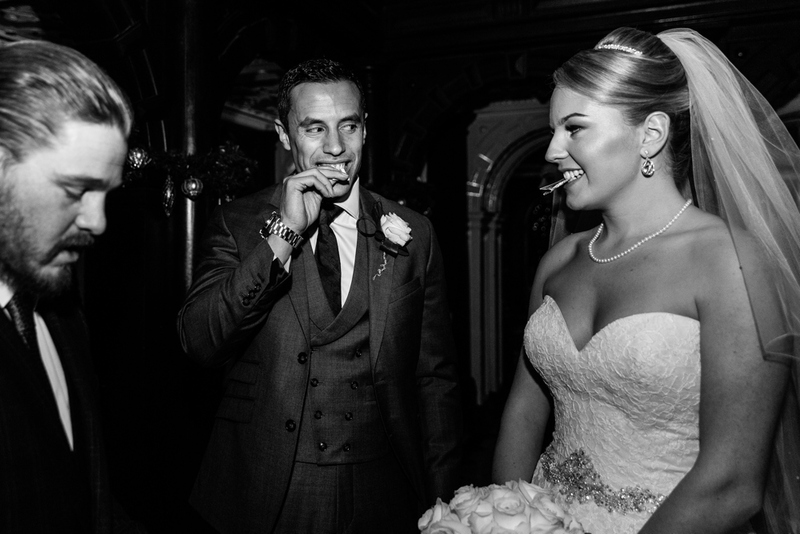 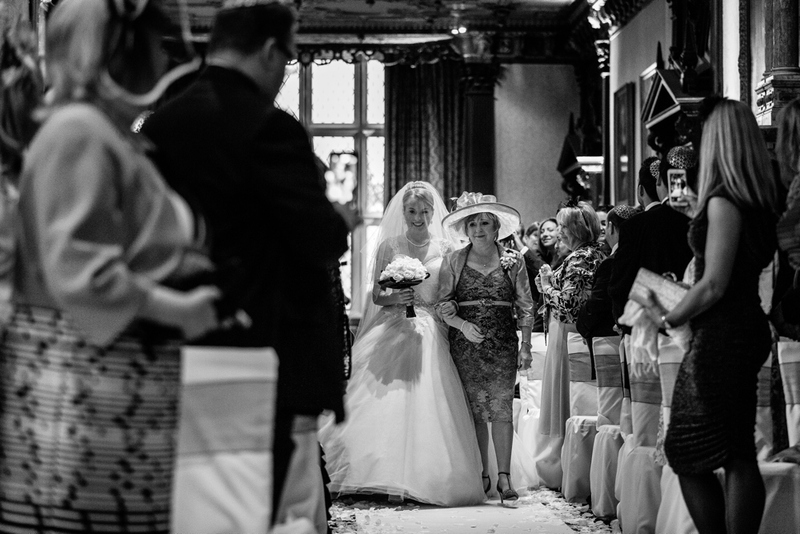 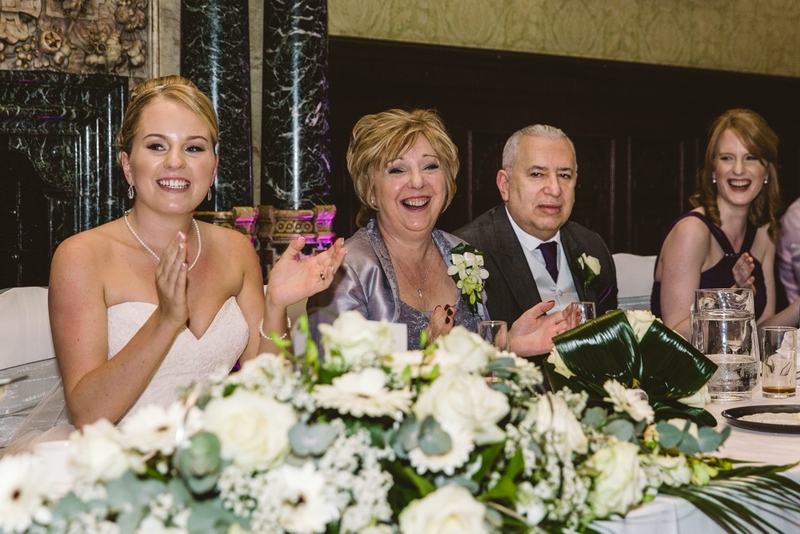 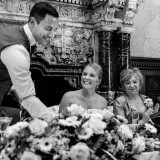 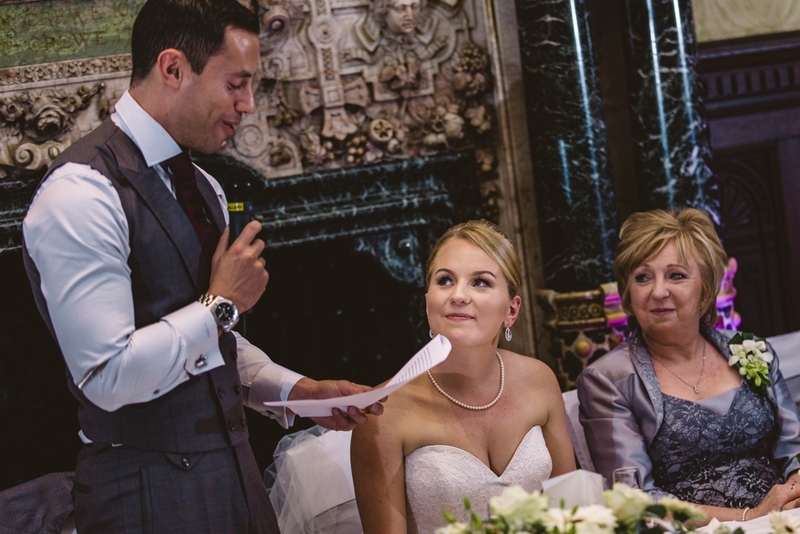 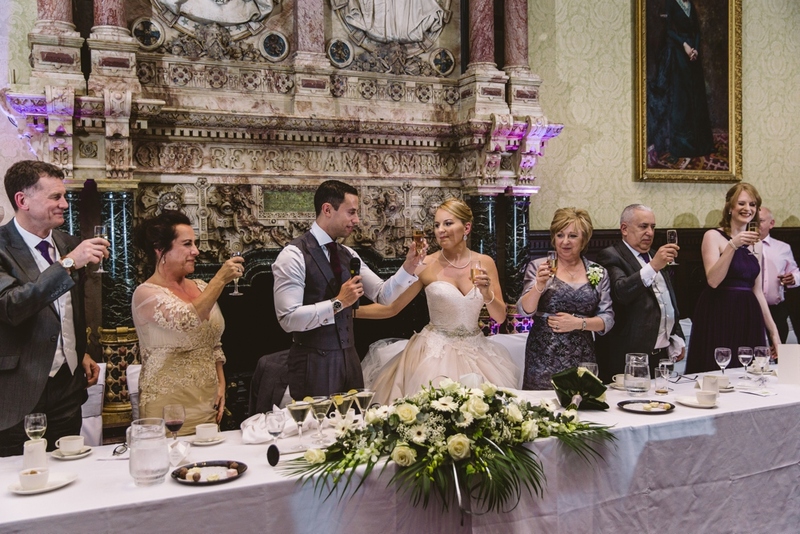 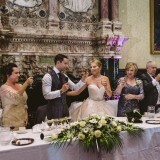 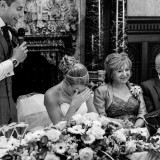 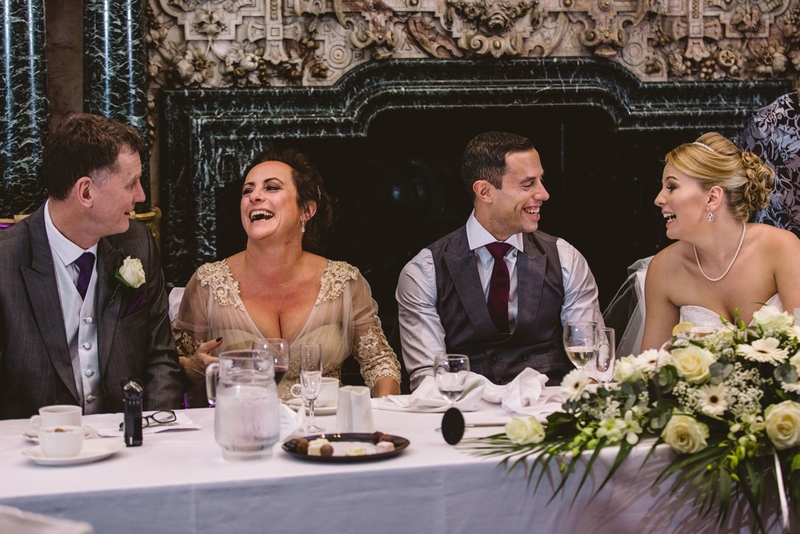 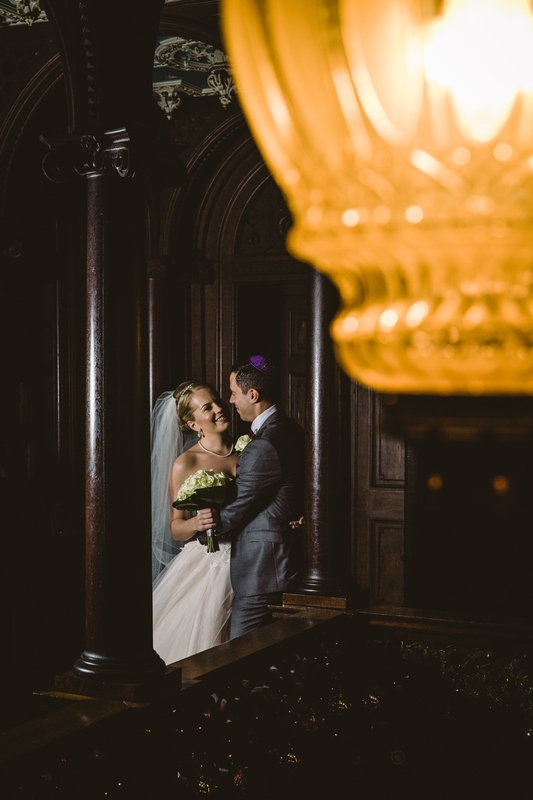 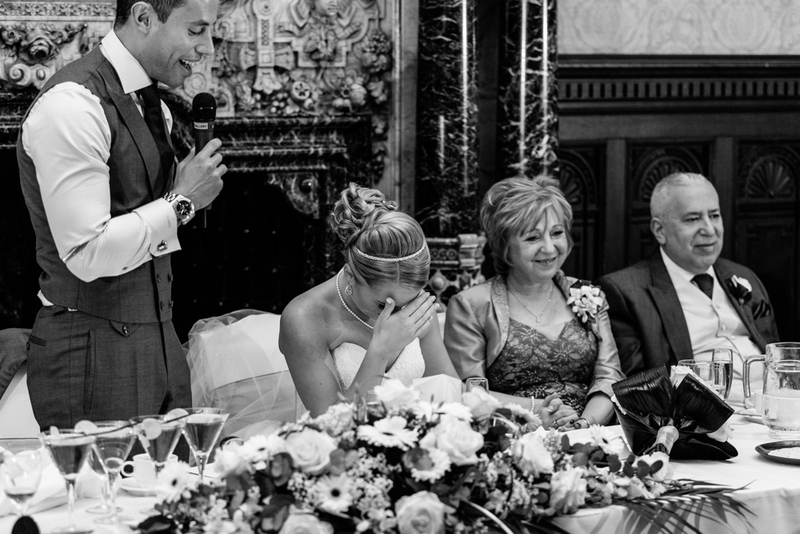 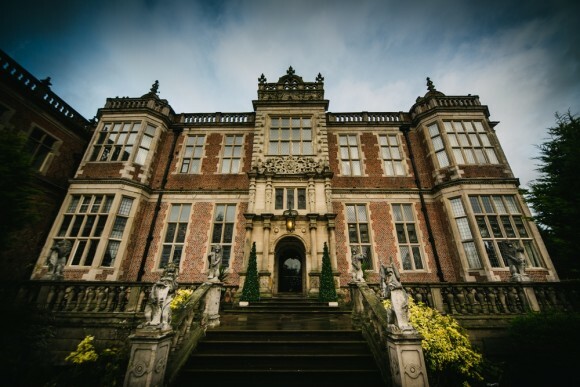 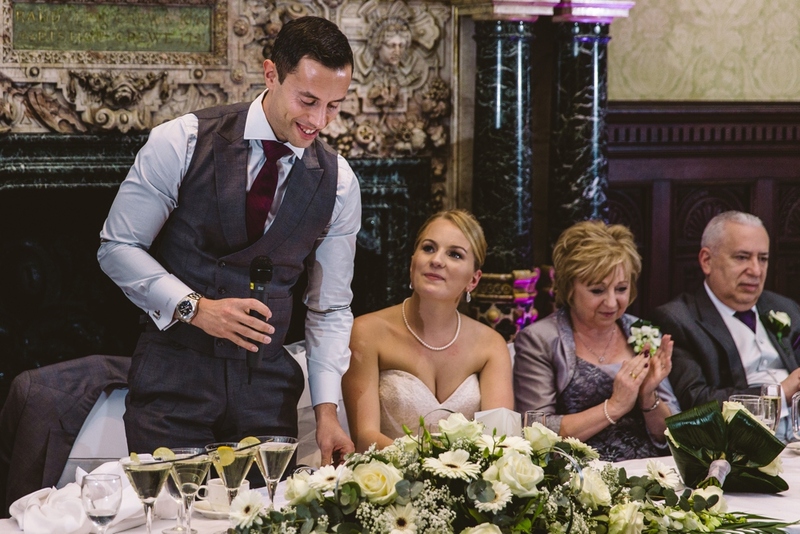 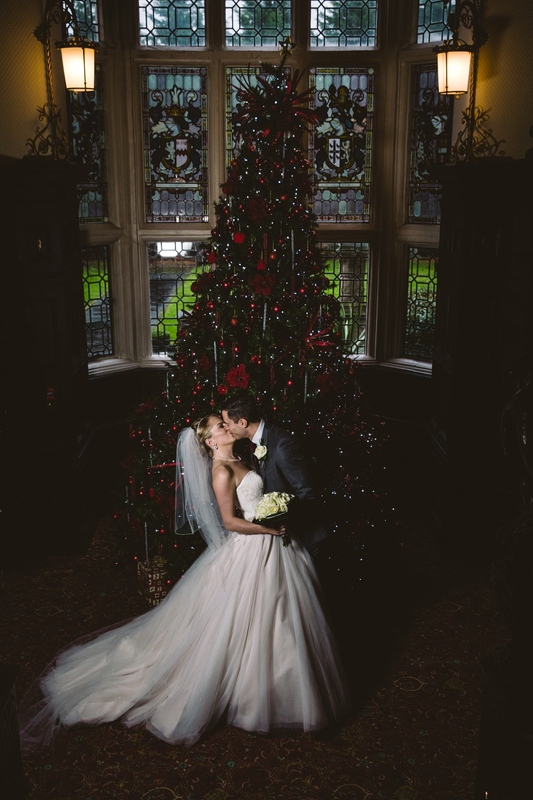 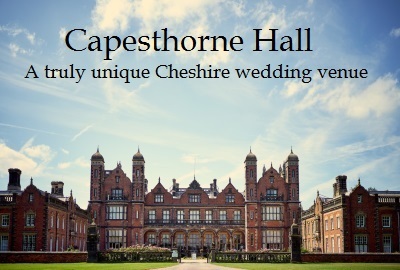 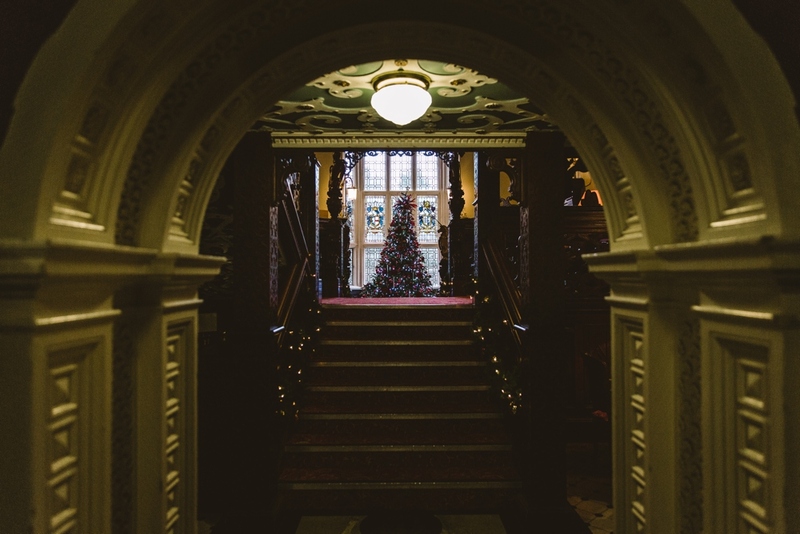 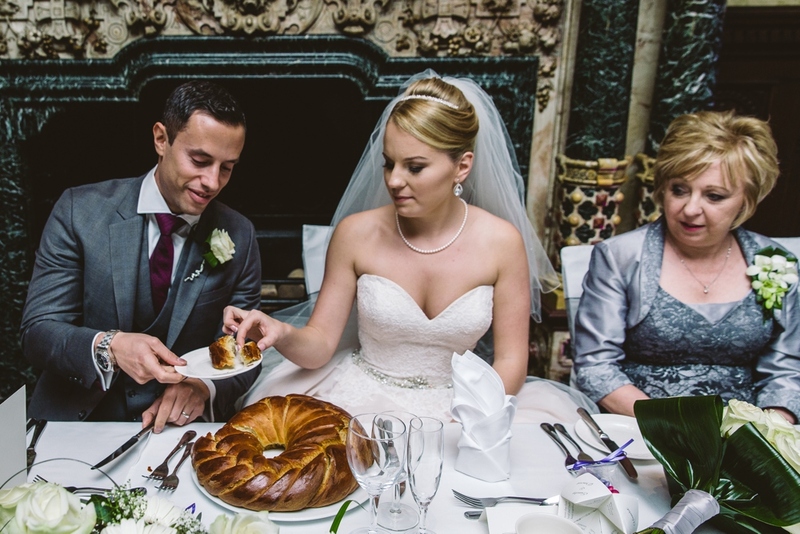 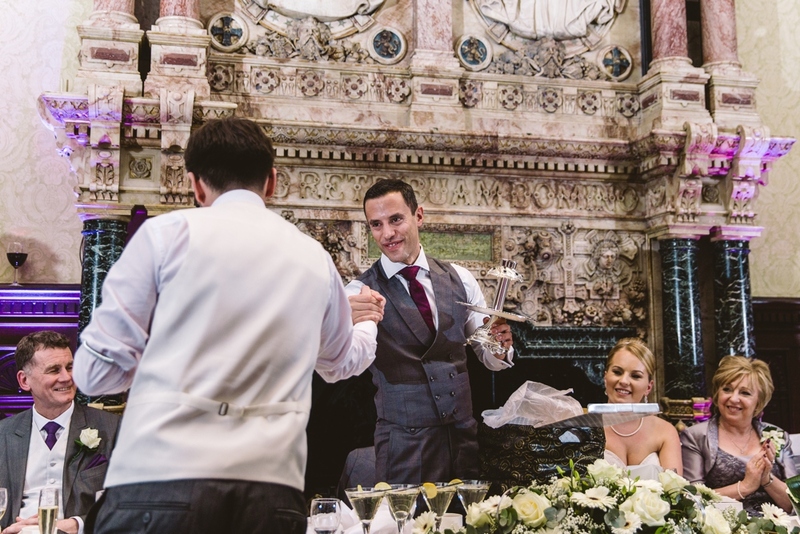 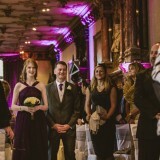 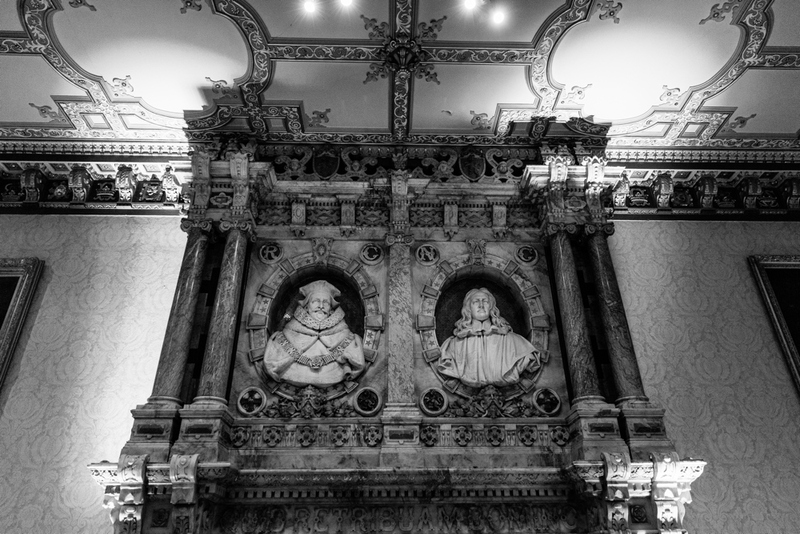 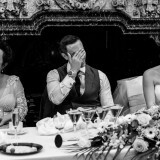 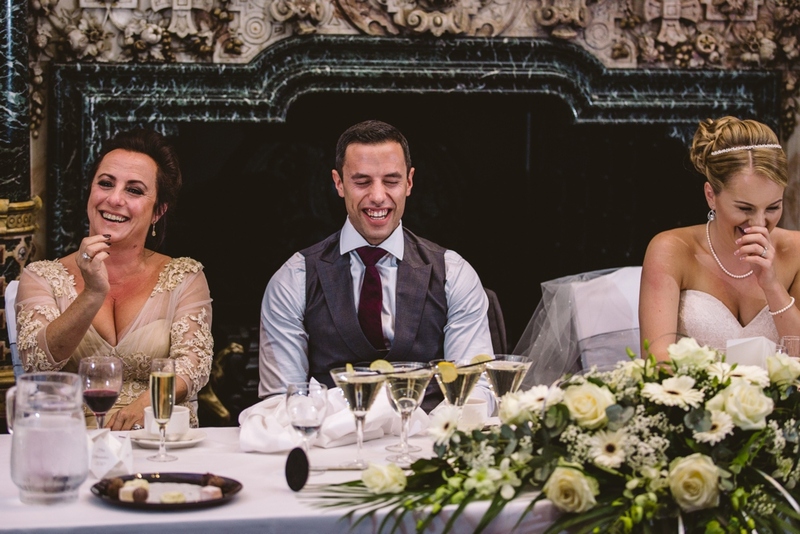 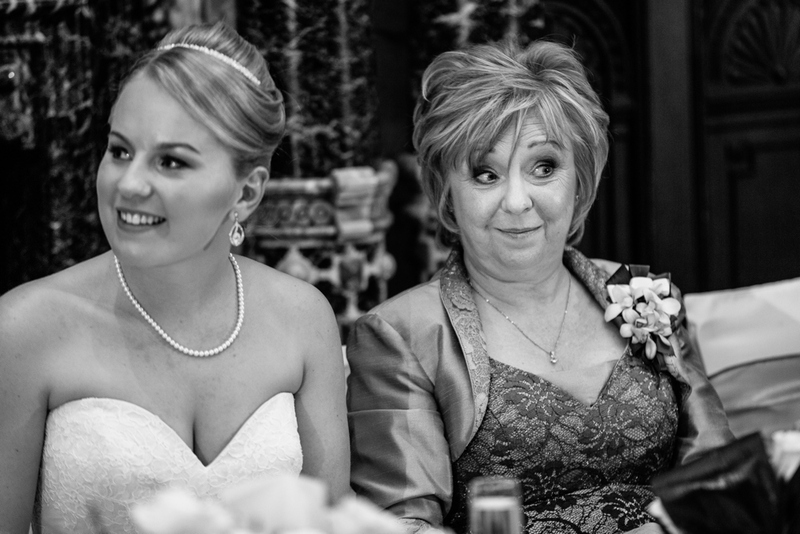 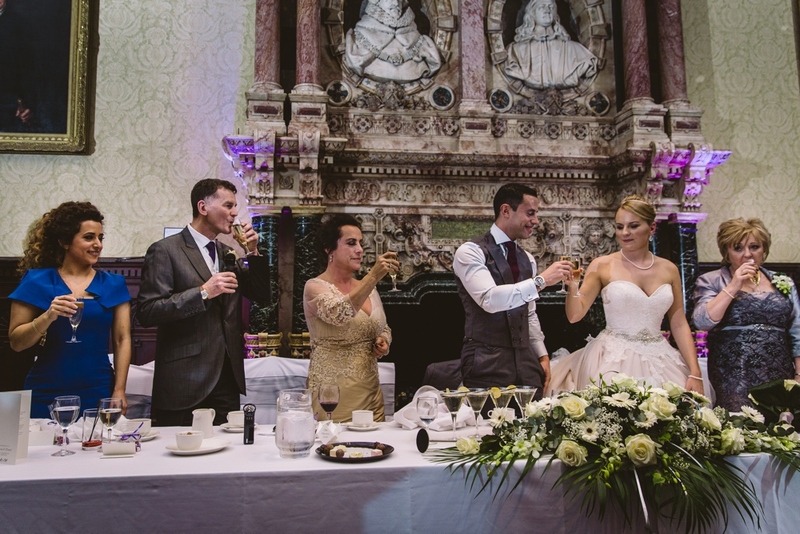 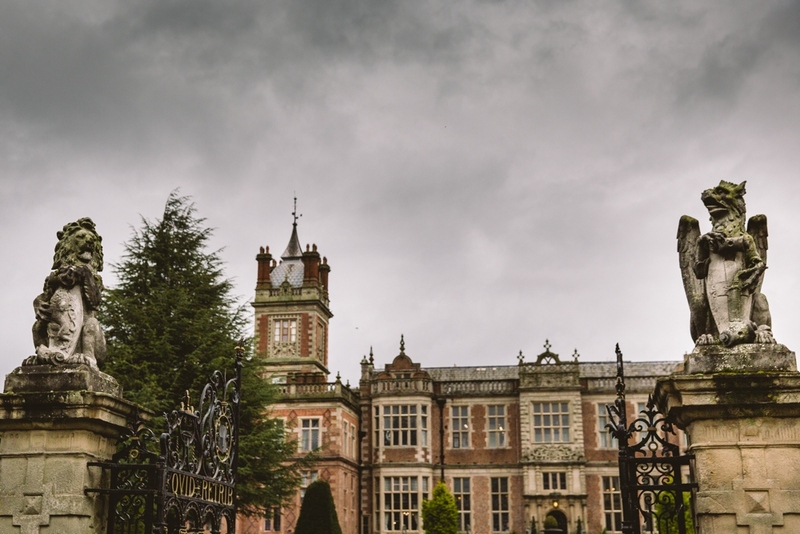 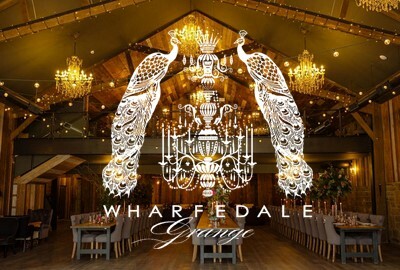 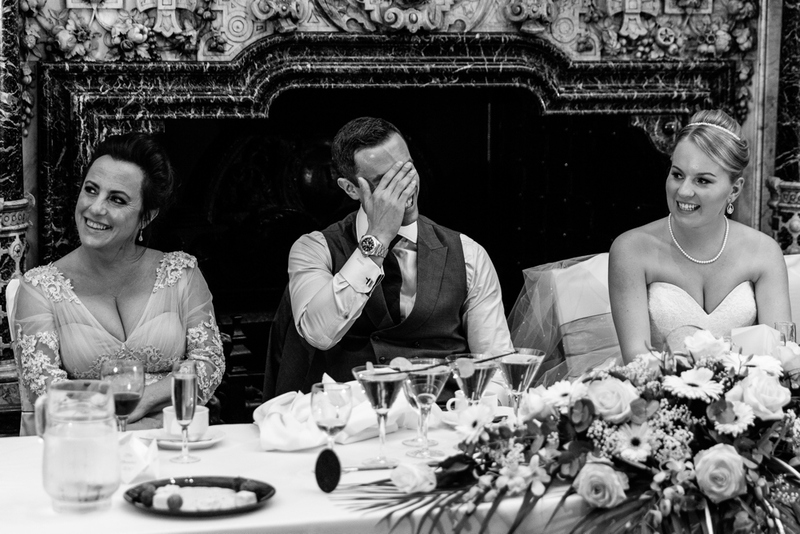 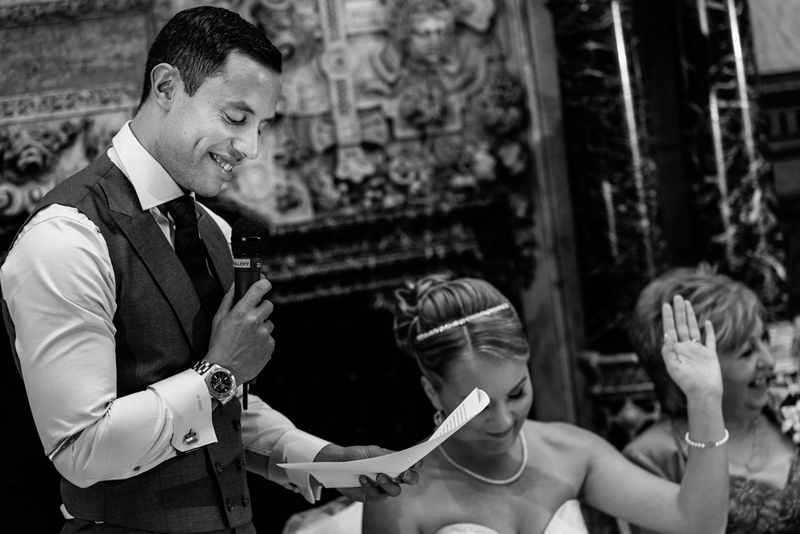 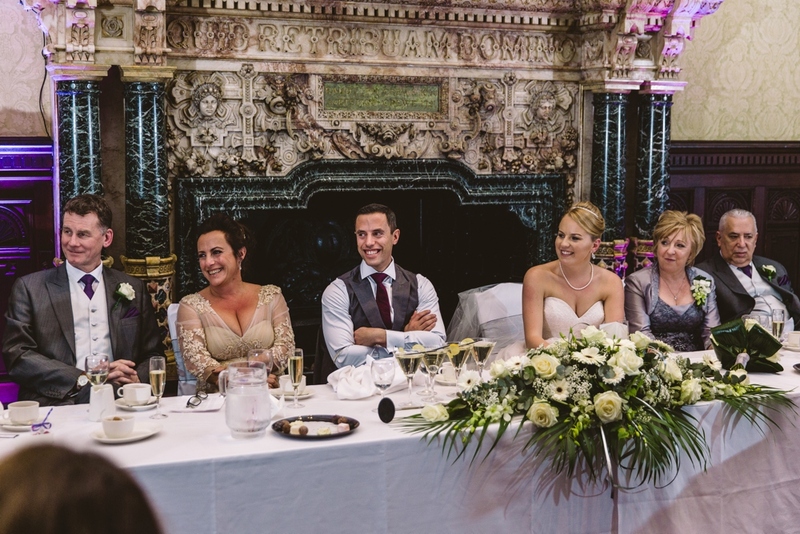 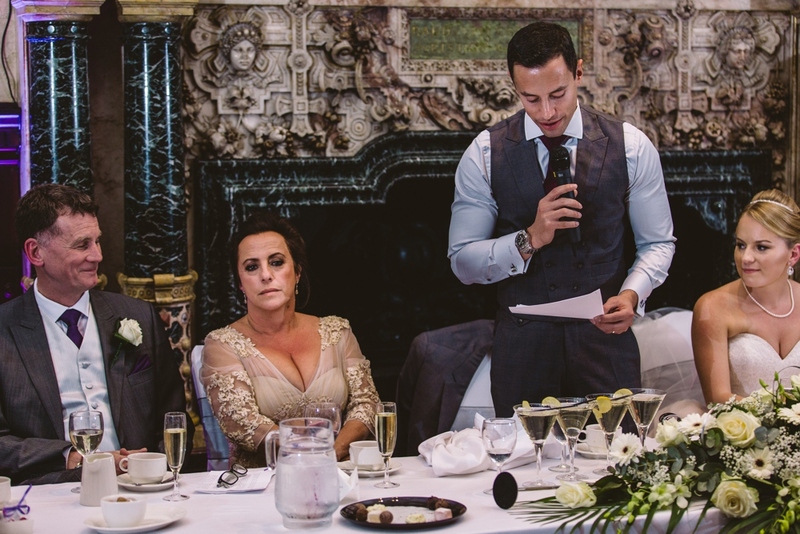 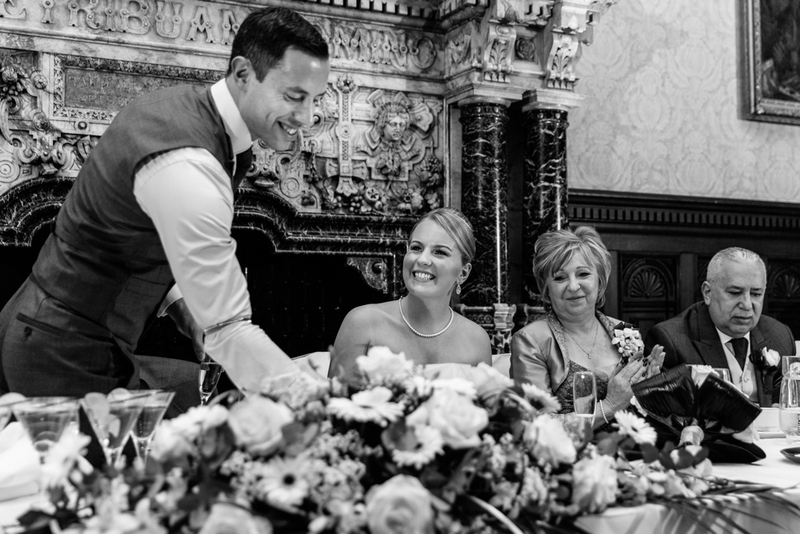 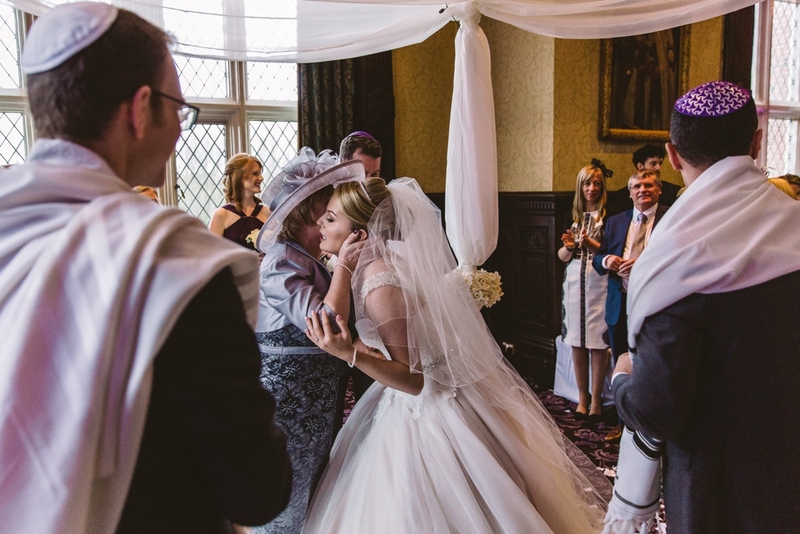 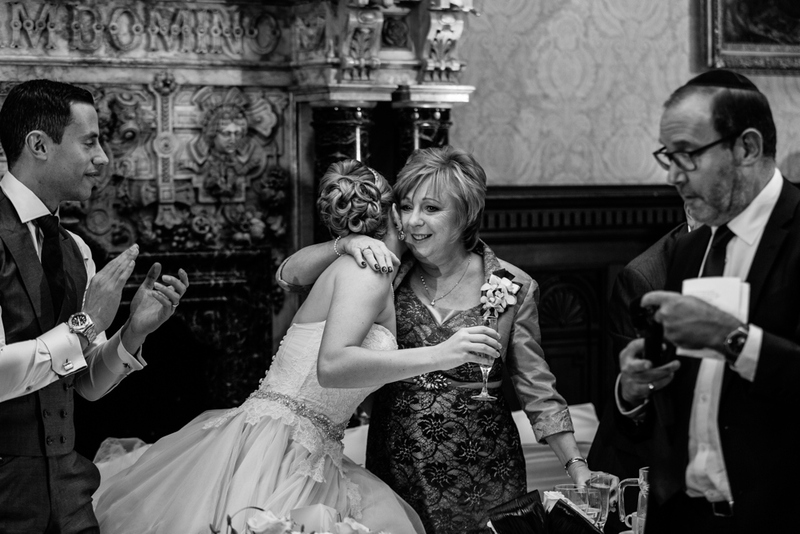 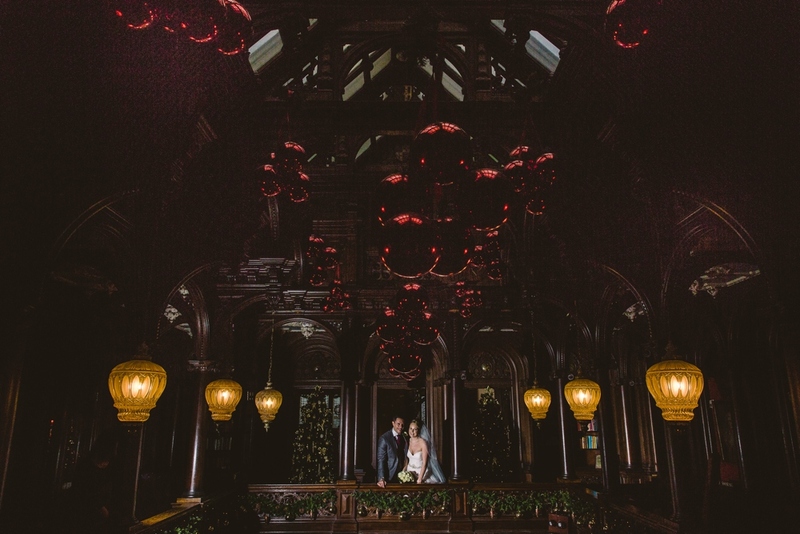 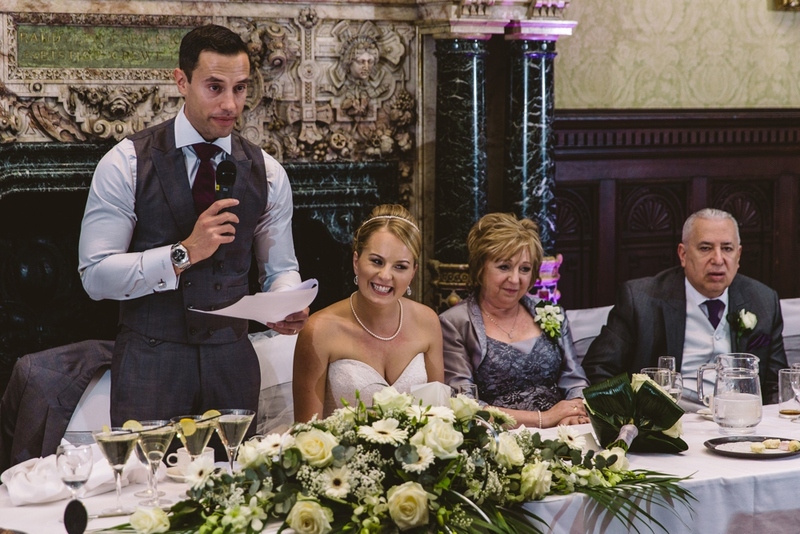 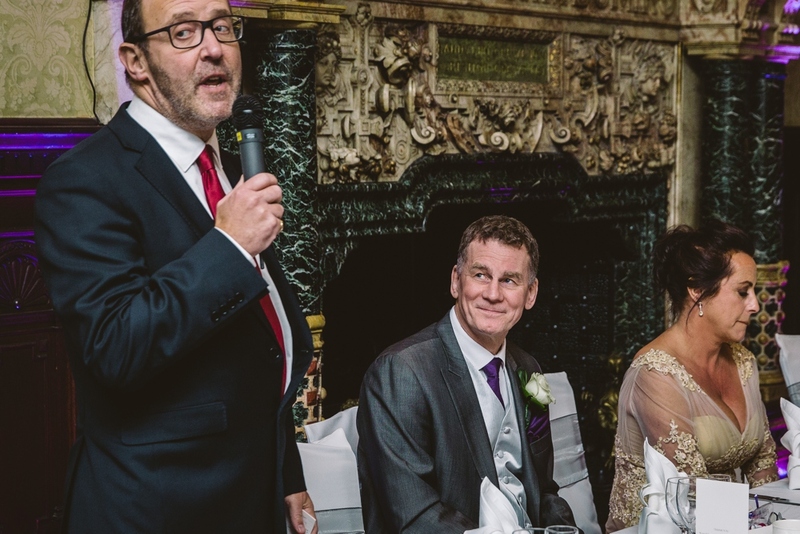 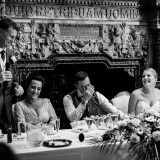 We are so happy that we chose Crewe Hall and all our guests have raved about the venue. 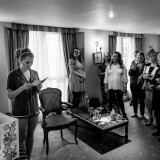 It was priceless to be able to have all our guests stay over at the venue and eat breakfast with us the next day before we left for honeymoon. 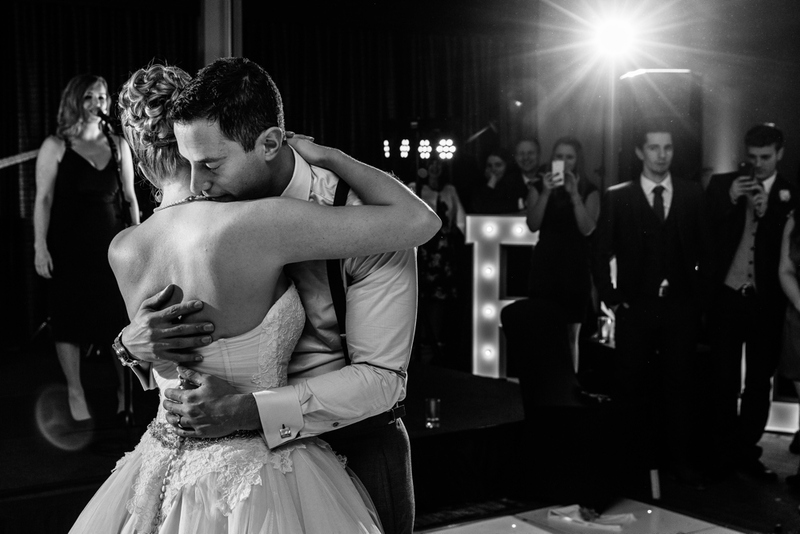 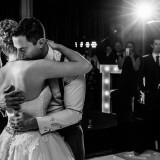 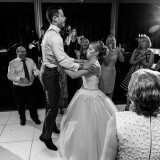 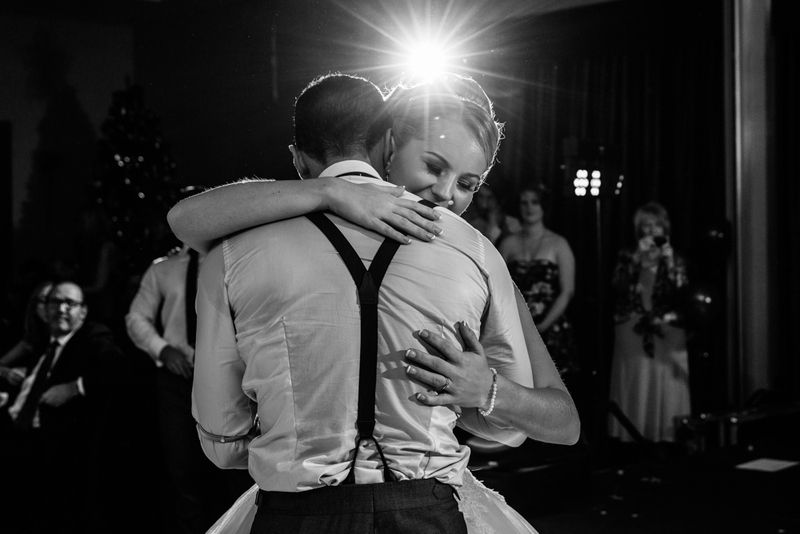 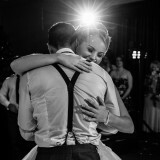 Looking back, I wouldn’t say that we have a favourite part of our day because it was all perfect but something that shocked us was how much we enjoyed the first dance. 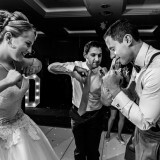 We had never put too much thought into the first dance but it truly was one of the highlights of the day for both of us. 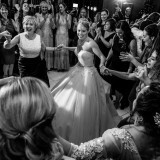 The first dance is one of the few times in the day when you’re alone with your new husband or wife and even though we had 250 people all staring at us, it felt completely private. 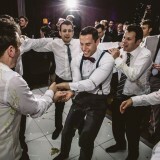 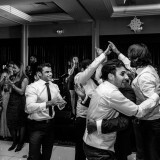 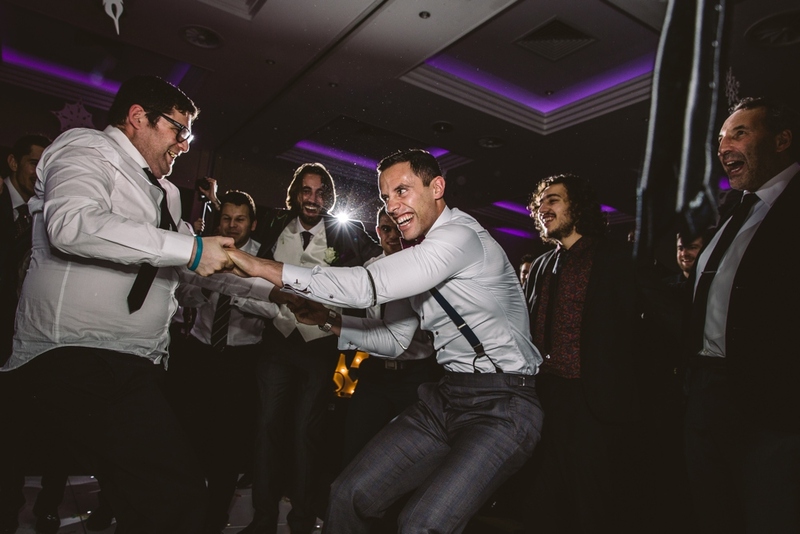 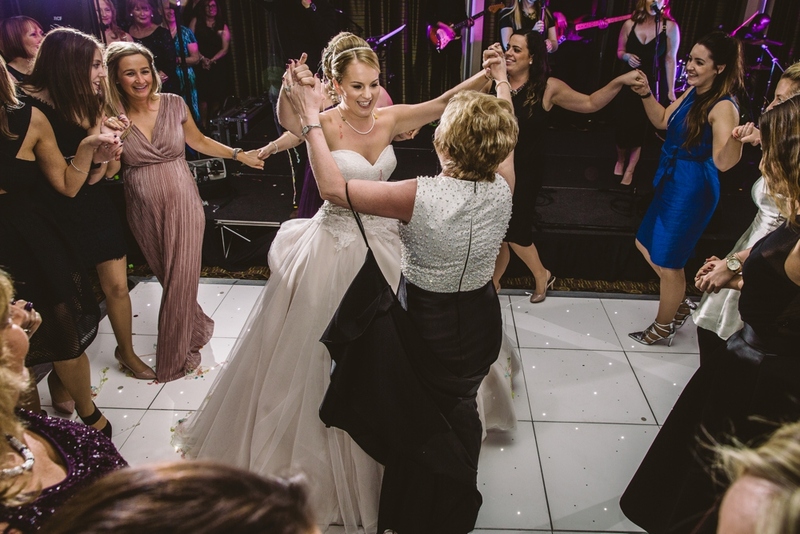 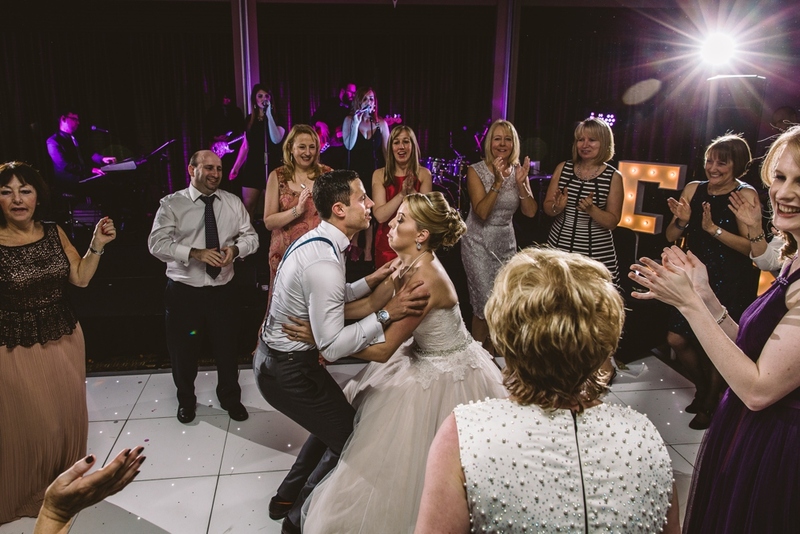 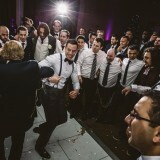 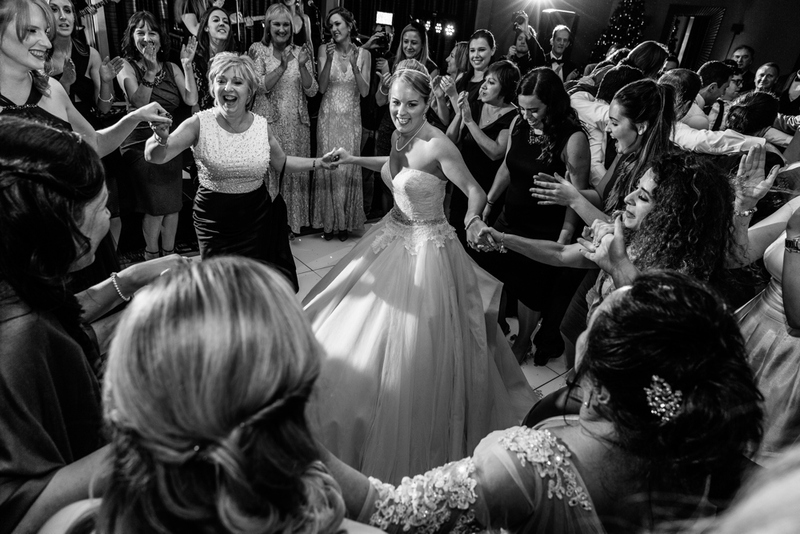 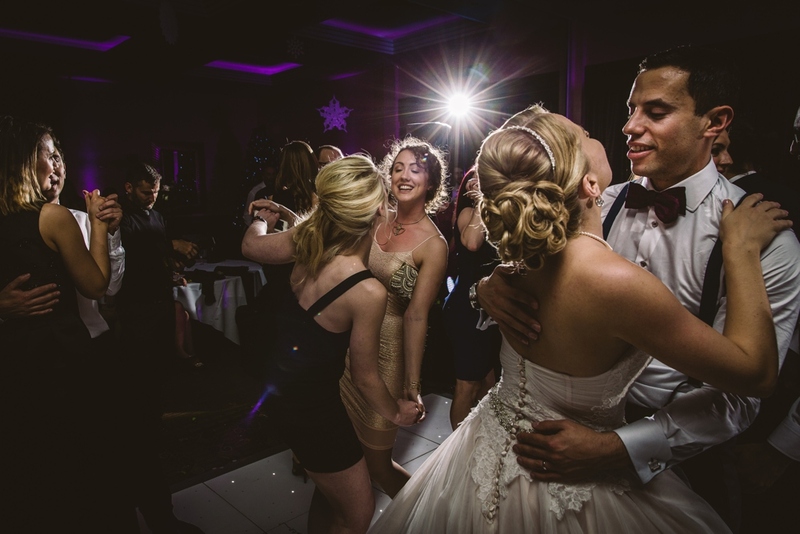 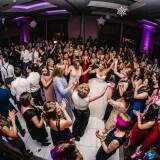 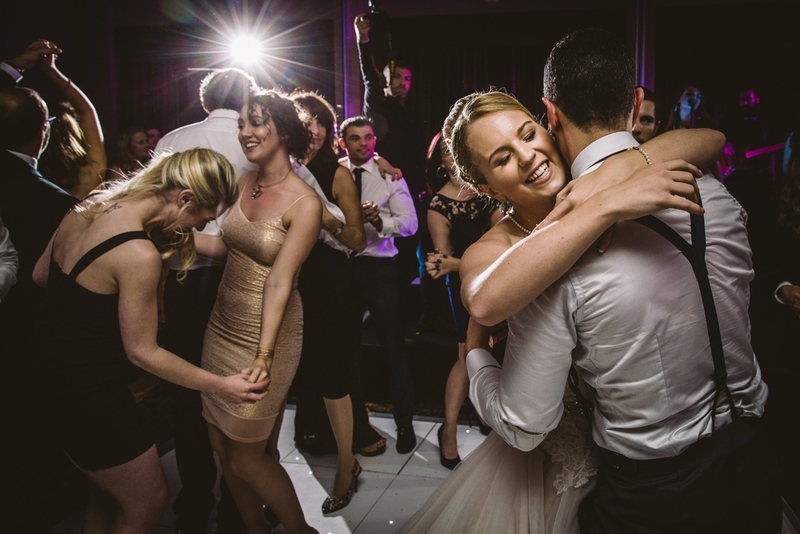 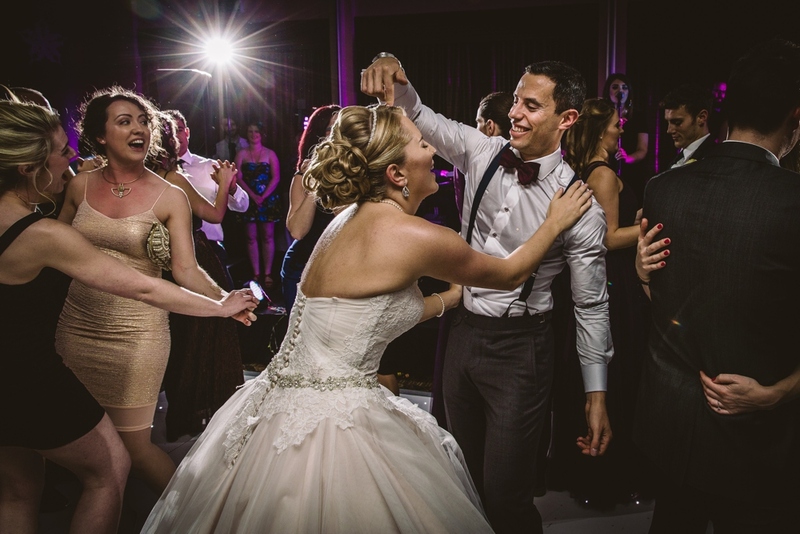 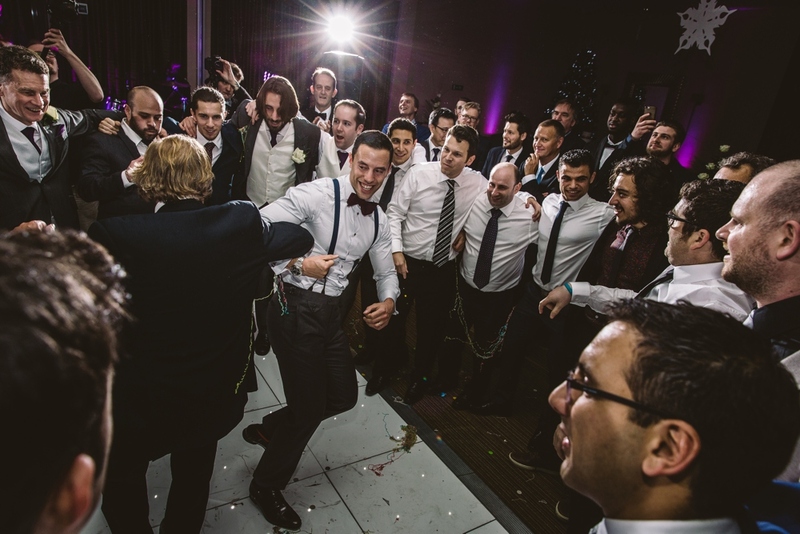 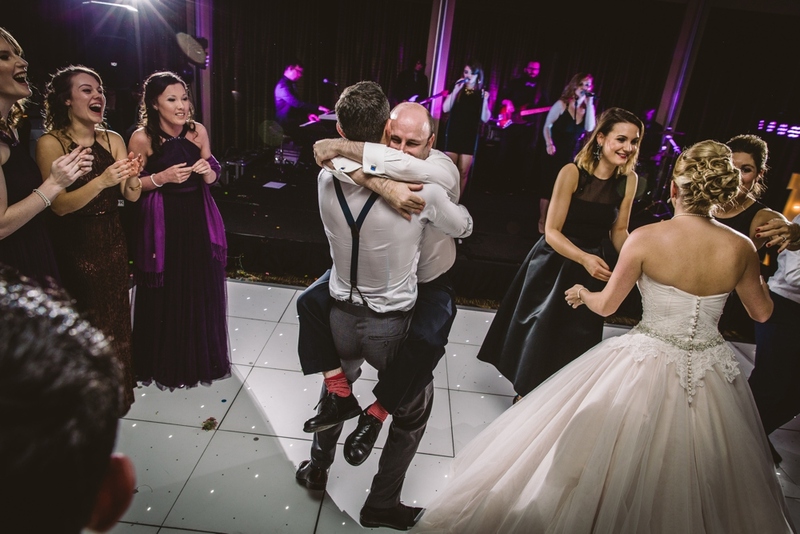 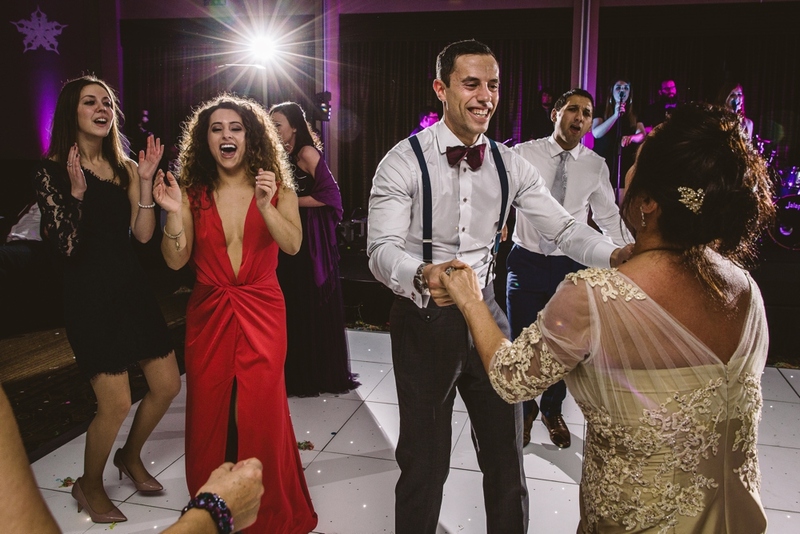 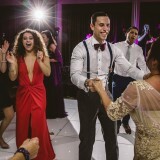 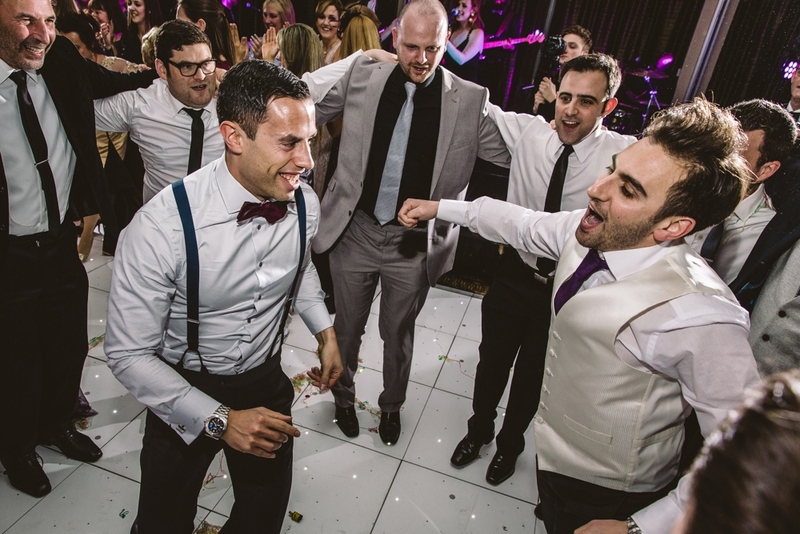 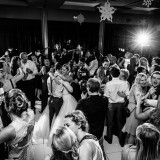 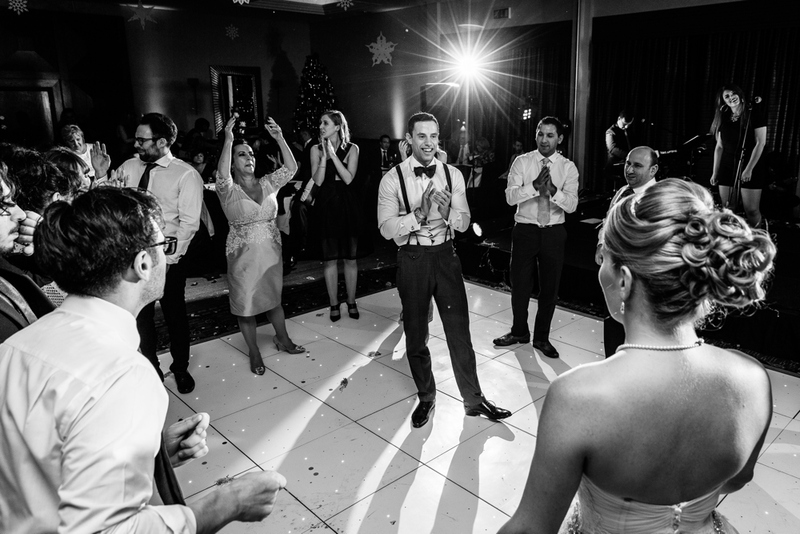 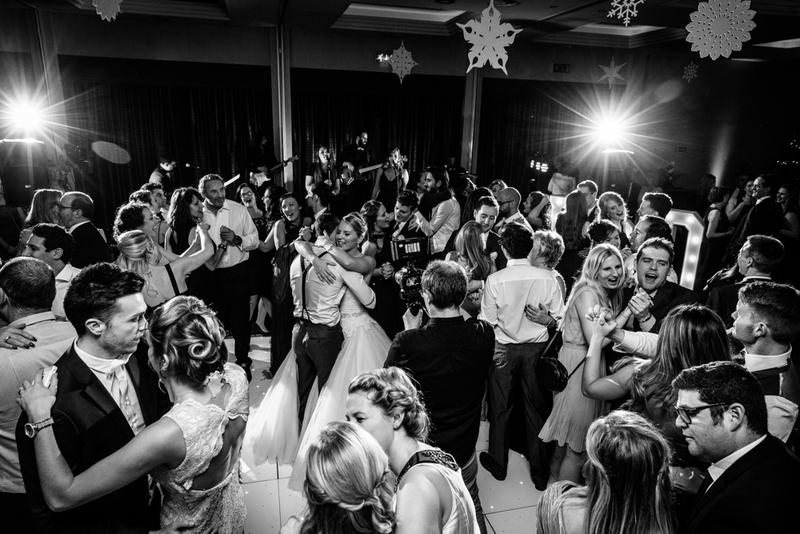 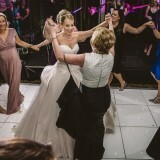 We also loved it when people started to join us on the dance floor because we had everyone we loved around us and during that moment, you can really feel the love in the room. 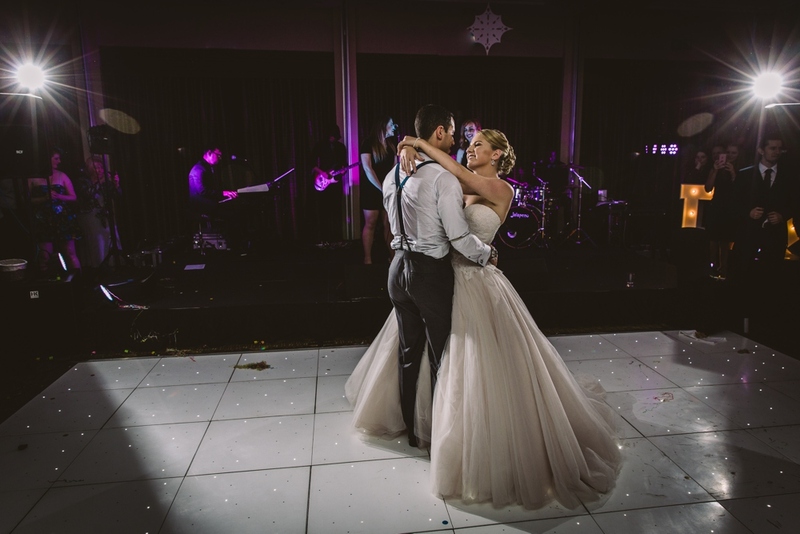 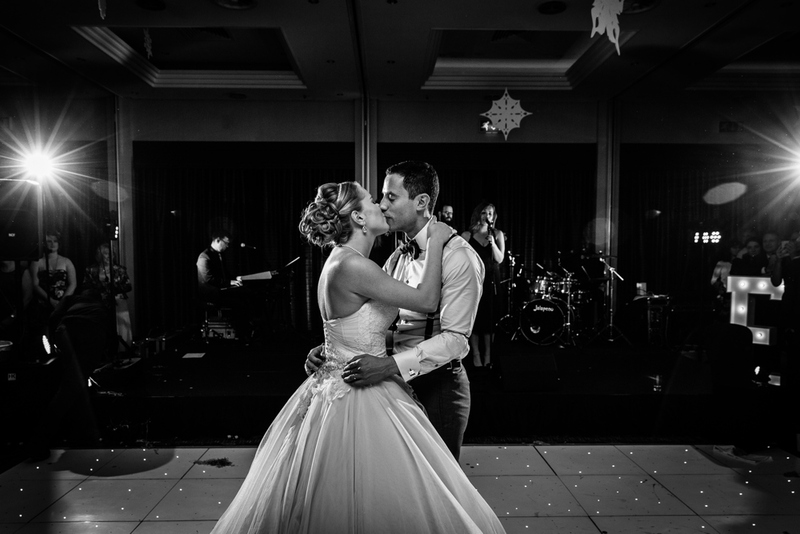 The first dance was an opportunity for us to reflect on the day and spend a few moments together as husband and wife and we will cherish those memories for the rest of our lives. 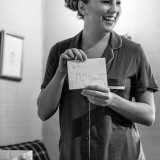 The day after the wedding we went on honeymoon to Thailand. 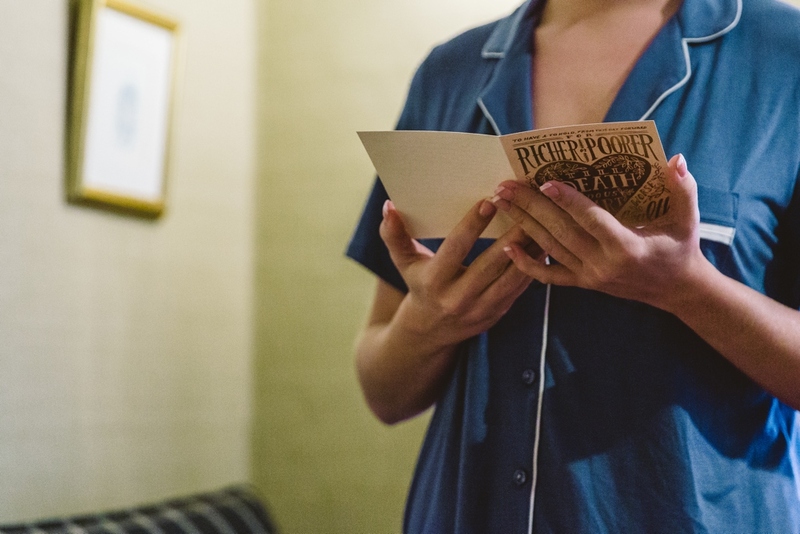 We travelled business class to Bangkok where we spent three days exploring the city (and recovering from the wedding). 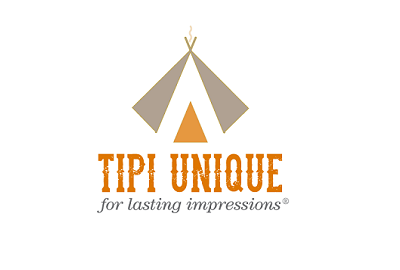 We then went on to Chaing Mai where we went elephant riding and came face to face with tigers. 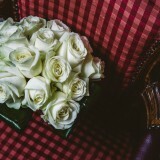 Finally we relaxed on a luxury beach in Phuket for a week before returning home. 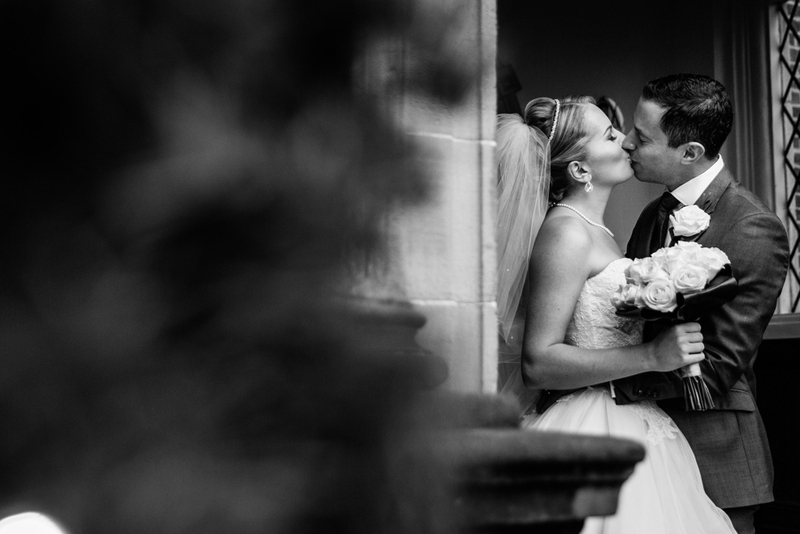 Our honeymoon was perfect for us because it had a good balance between adventure and relaxation. 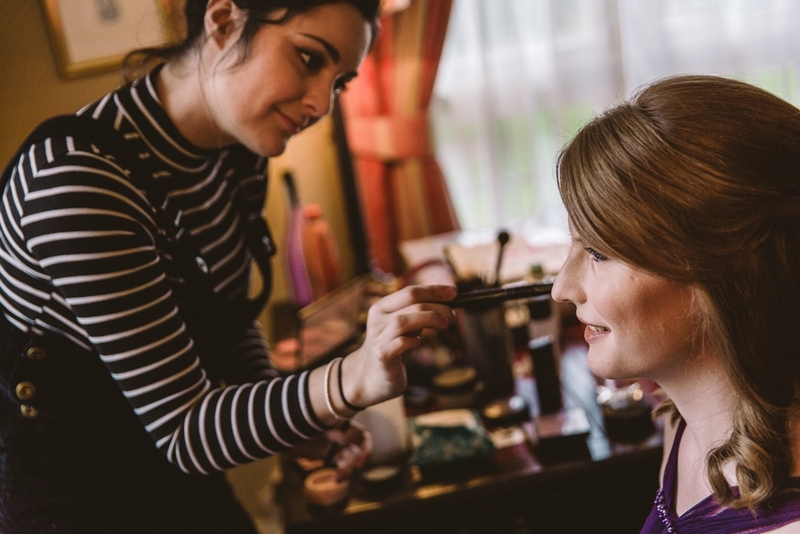 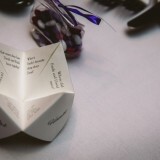 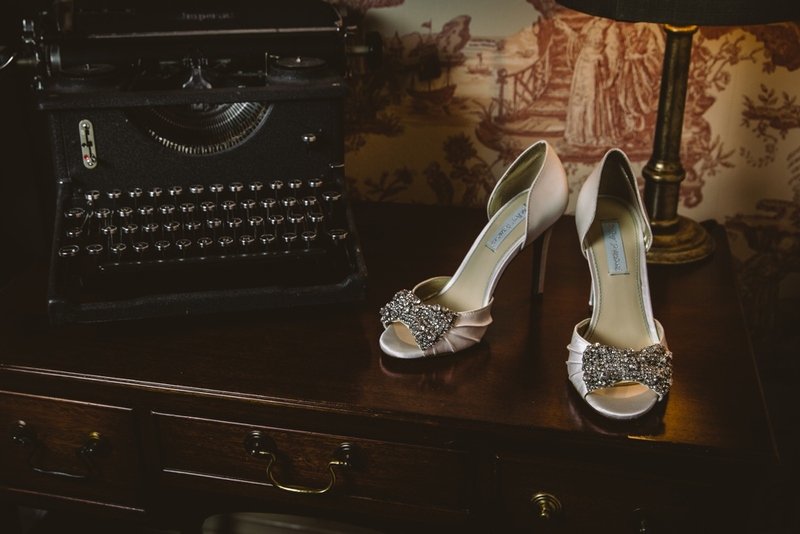 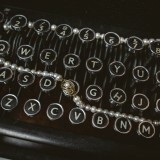 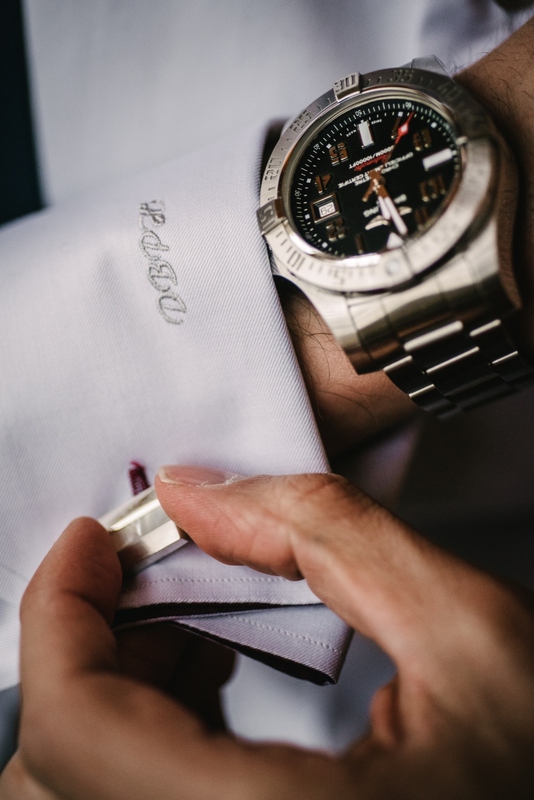 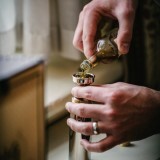 My top tip for other Brides Up North would be to enjoy every moment and plan things early. 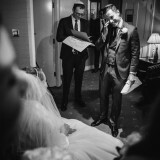 We planned the whole wedding ourselves and this was an amazing experience, it meant we knew every little detail about the wedding and we were fully in control. 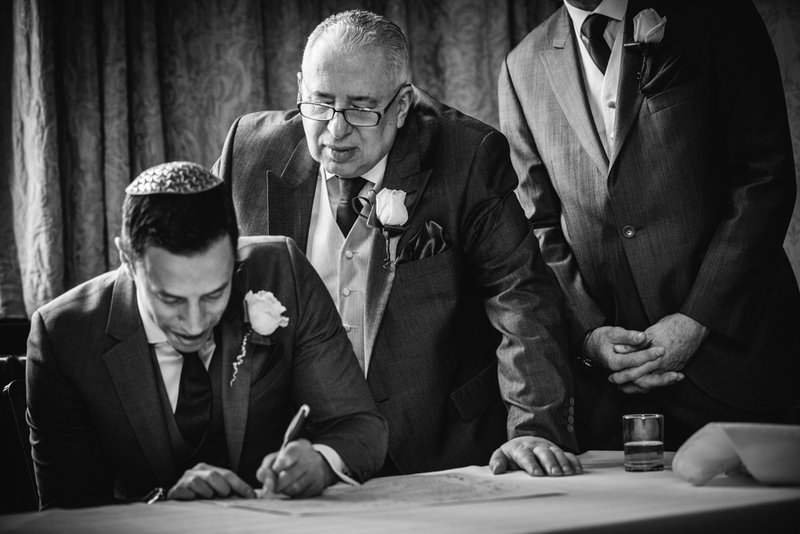 The planning can be so much fun but can also be stressful if you leave things to the last minute so my advice would be to make a timeline and to stick to it! 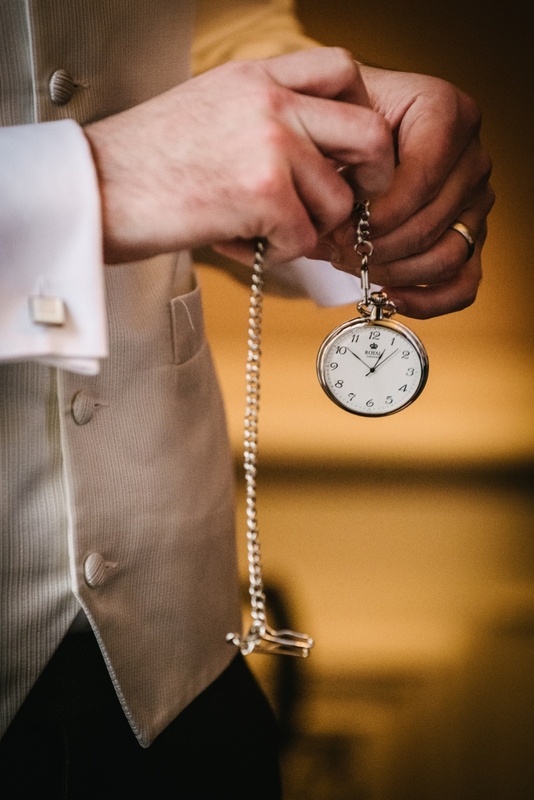 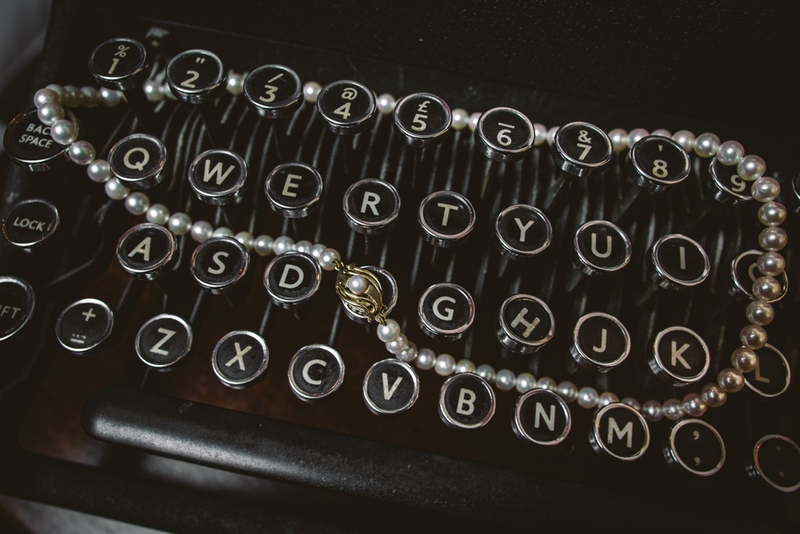 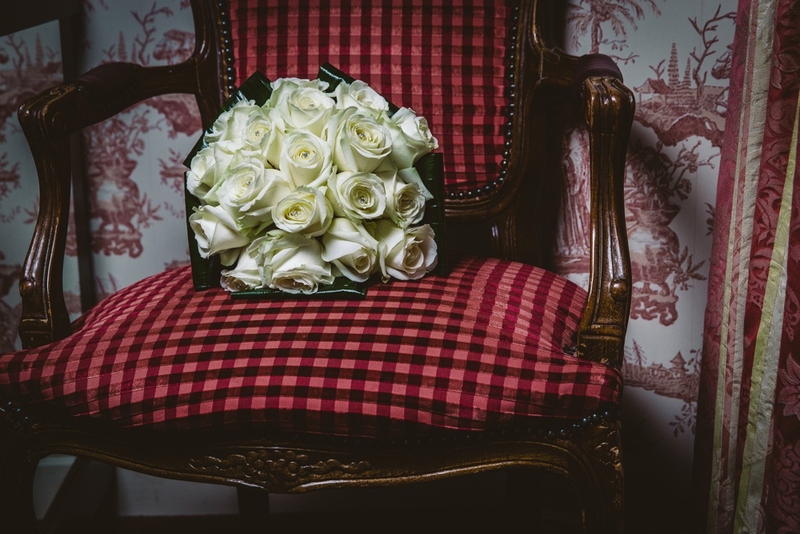 You should never be afraid to book something too early, we had 18 months to plan a wedding and were told many times that certain venues or vendors were fully booked!